1 Dec 2002 - Updated style and format. 3 Nov 2013 - Added additional photos, upgraded existing photos. This report may seem a bit disjointed. I made several business trips to the Tulsa area July through October. I made the occasional sightseeing stop on the way up, on the way back, between trips, or in my off-duty time while in Tulsa. These trips are bundled here for your convenience. Departed home at 0550. First target of the day was Muskogee. 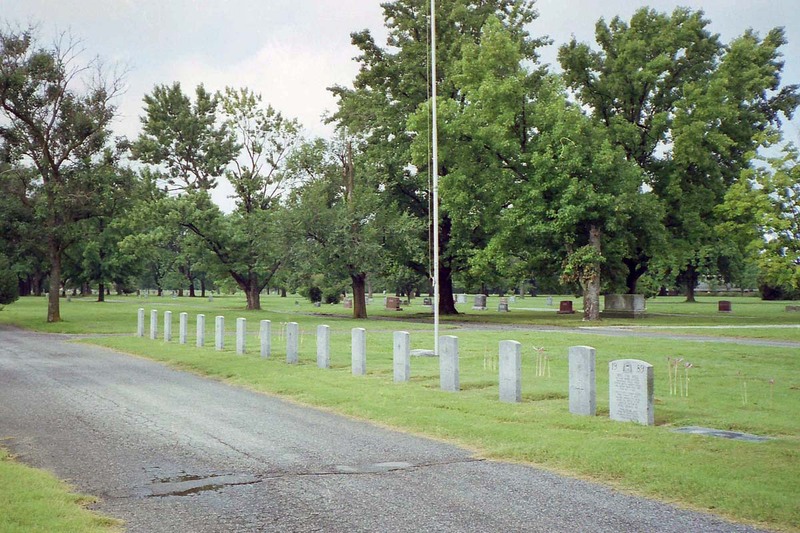 South of town, I visited Davis Field (earlier known as Muskogee AAFld), at 35-40-15, 95-22. 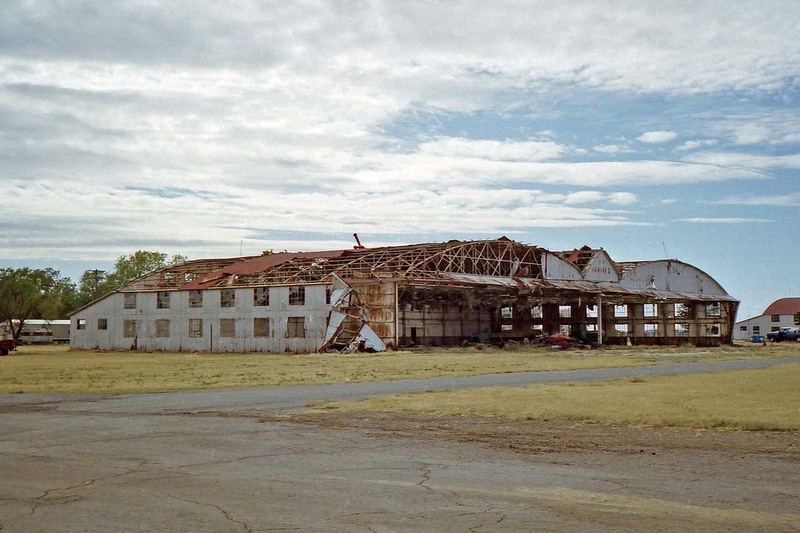 During W.W.II, this was an Air Support base associated with nearby Camp Gruber. 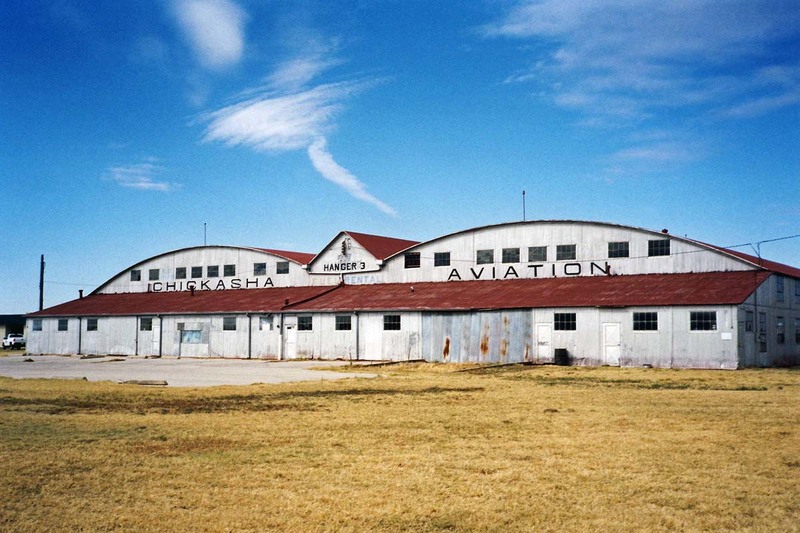 Different sources show it under 2AF or 3AF, and a sub-base of Abilene AAFld or Will Rogers Field. In late 1955 it was activated as Davis Field and assigned to Continental Air Command (CONAC) under first 14AF then 10AF. 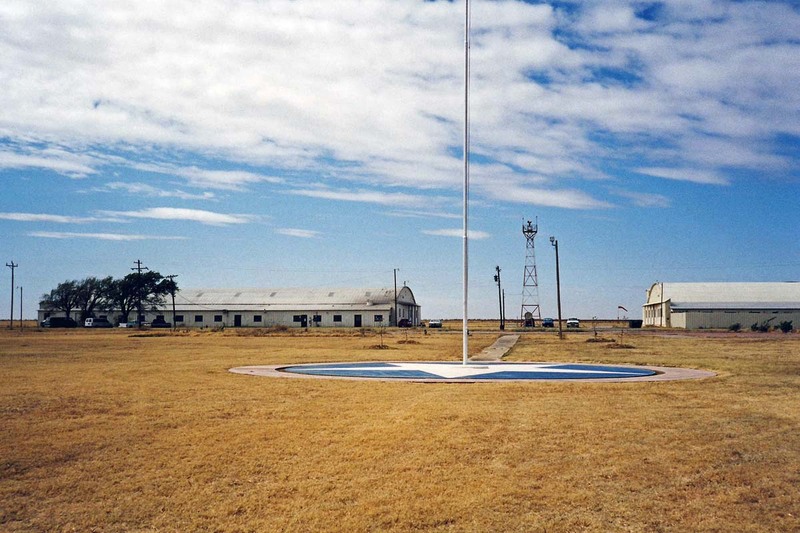 In approximately 1962 it became an Air Force Reserve (AFRES) base, and remained in use until about 1966. 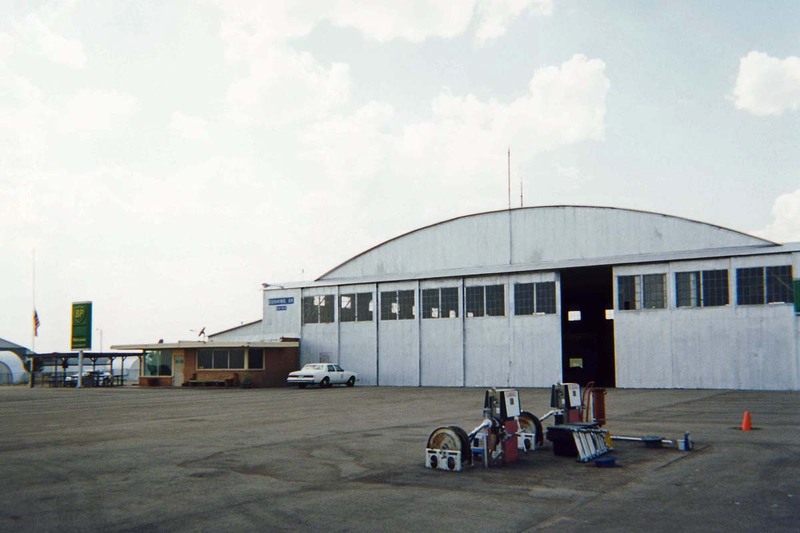 Since then, it has served as a municipal airport, still named Davis Field (MKO). 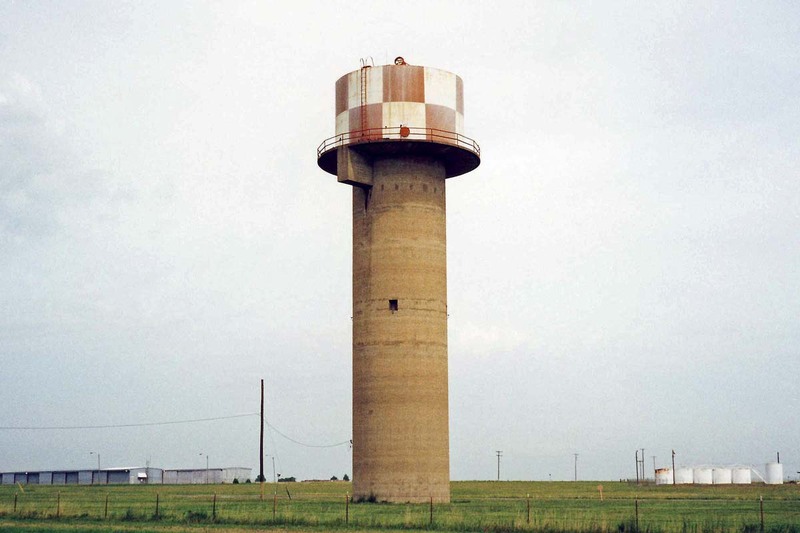 The checkerboard water tower is an unusual design -- the tower is concrete, the same design I saw at Dalhart AAFld. 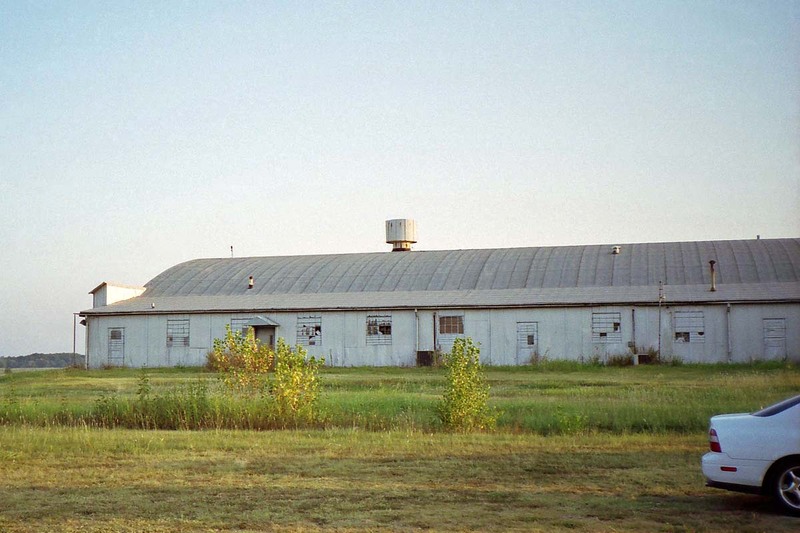 One W.W.II vintage hangar and a few other buildings remain; and a faded sign hinted of more recent use by the Army National Guard. In fact, there were several Army twin-prop airplanes on the ramp. A contractor I spoke to said they were just visiting, and were not based on the field. 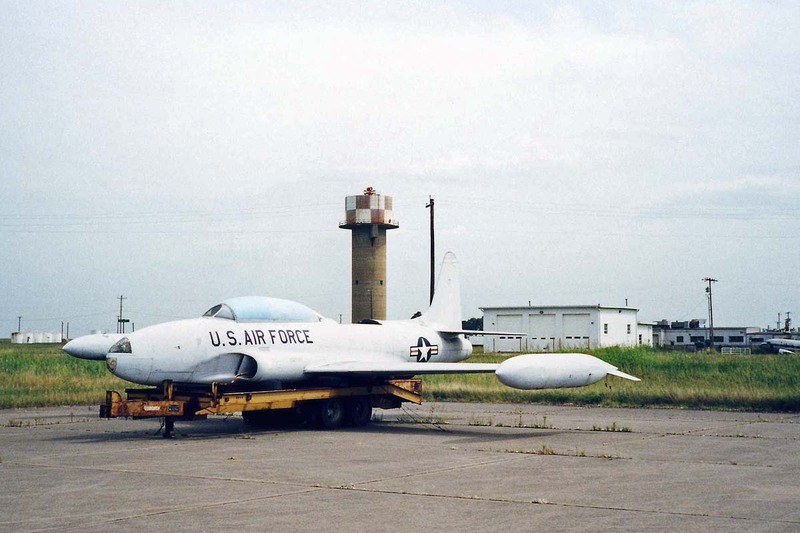 Another USAF remnant was a T-33, parked on a trailer. The same gentleman told me it had been on a pylon out at highway 64, but had to be temporarily moved due to utility construction along the highway. Heading north into town, I looked for Hatbox Field, 35-44-30, 95-24-15. 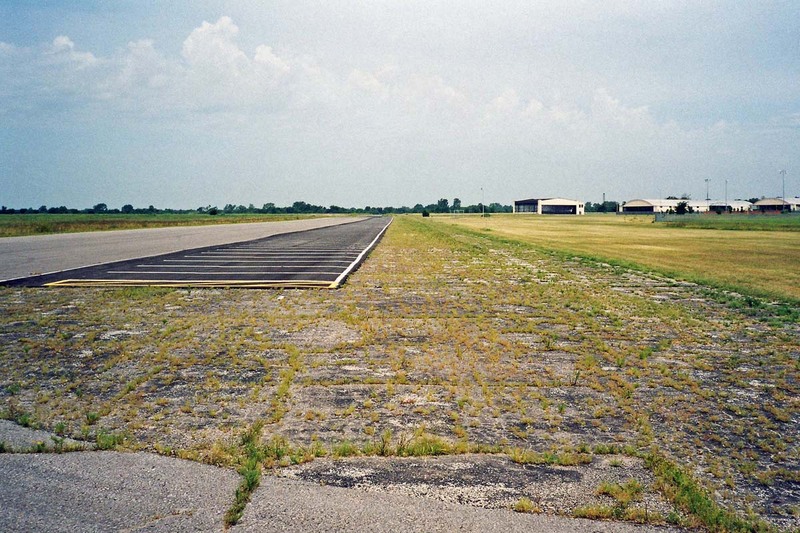 My first view of the airfield was the southeast end of runway 29 (note the X indicating a closed runway). Painted markings on the side of the runway indicate it may be used as parking for nearby school ball fields. 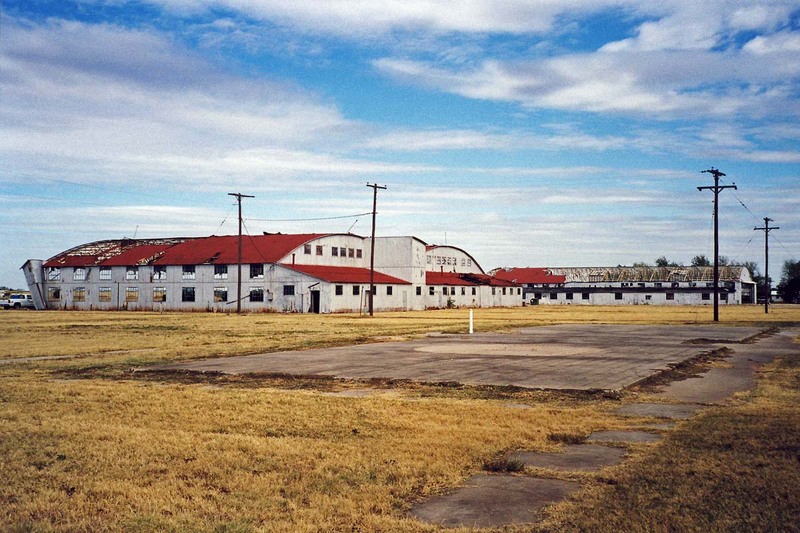 Then I drove around to the main airfield area; one hangar was stuffed with about four or five twin-prop aircraft in US Army markings. 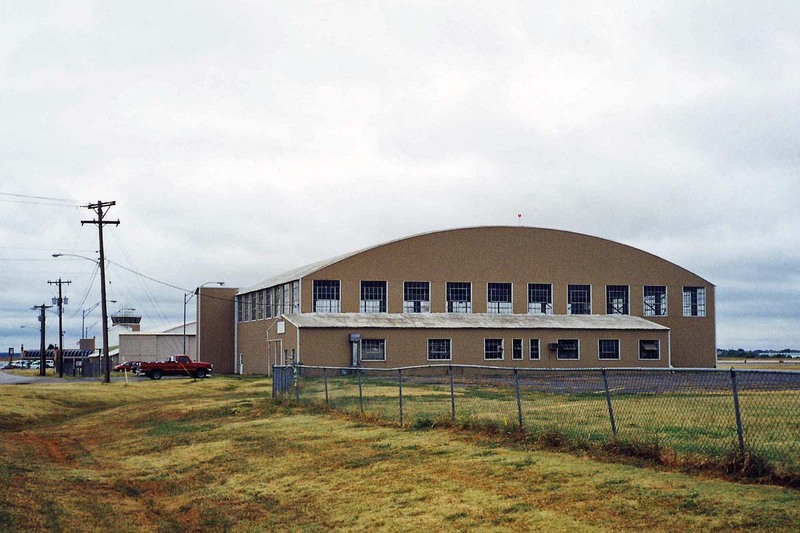 Two larger hangars were in use for industrial purposes. A small FBO office sat nearby. Data on the AirNav web site, dated 15 Jun 2000, shows the airport open (including runway 29) so the shutdown was very recent. 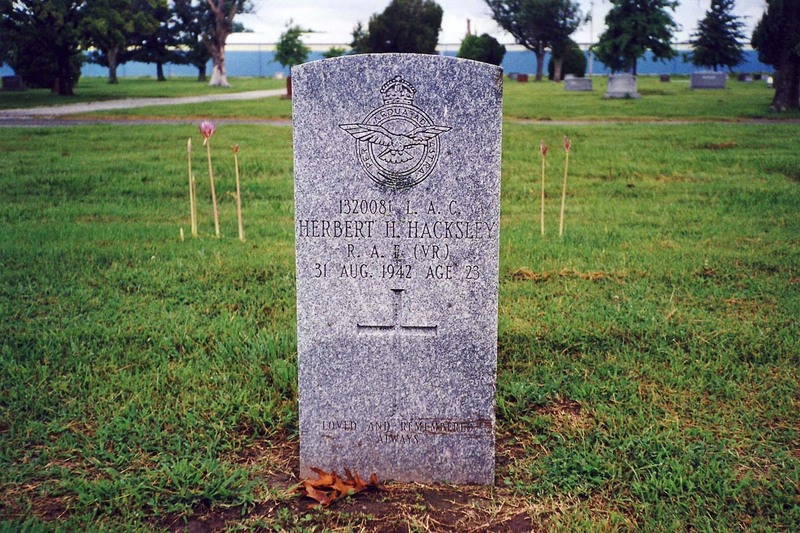 Hatbox was an AAF contract flying school during the war. 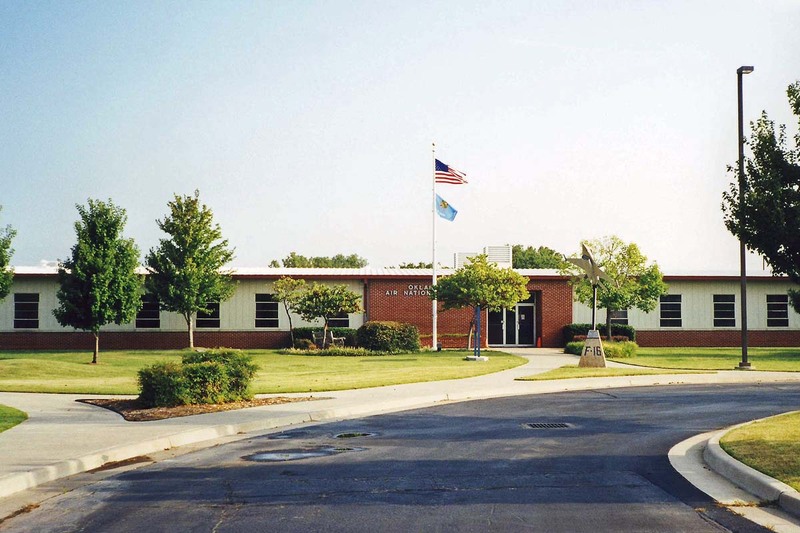 Spartan Aircraft Company opened the school on 16 Sep 1940, and it served until sometime in 1944. I arrived in Tulsa at 1230, in time to take a long nap before working an overnight shift. 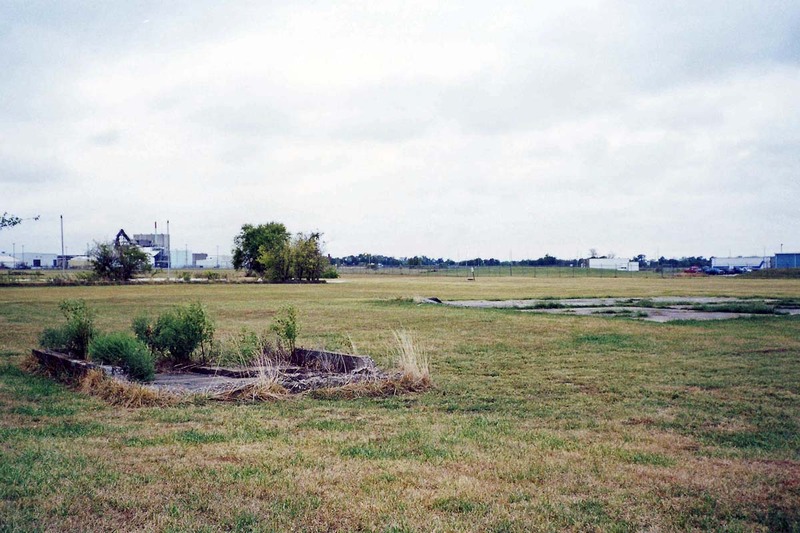 I did take note of Air Force Plant #3 (2504, ACFH), located on the southeast part of Tulsa International Airport, at 36-11-27, 95-52-36. 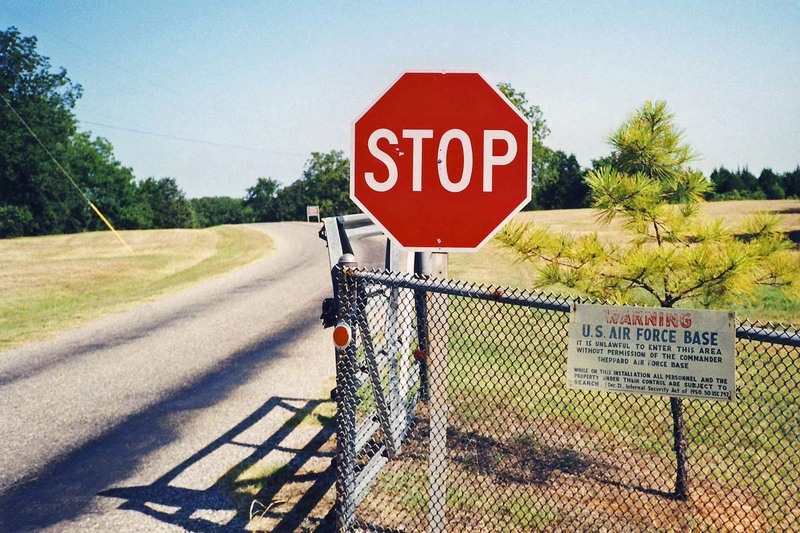 As recently as 1999, the perimeter fence was still sprinkled with standard USAF Controlled Area signs. 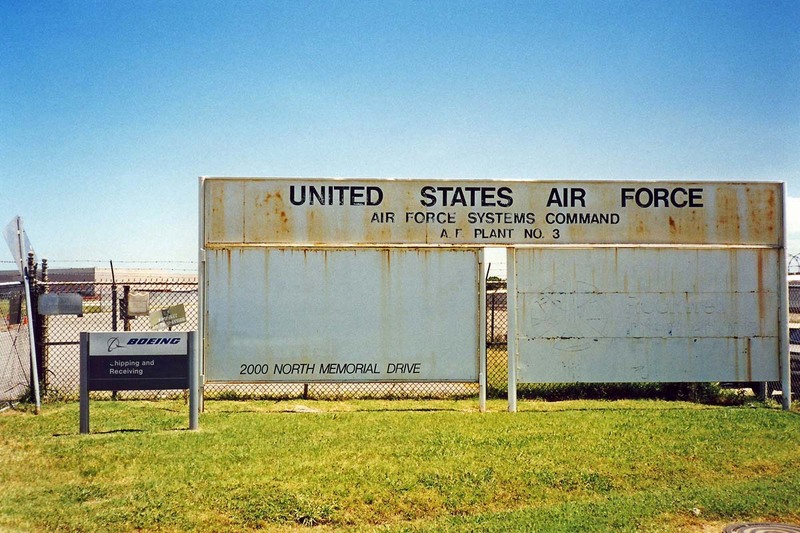 Those signs were gone now, but I did notice an old Air Force Systems Command sign still standing -- quick, take a picture before they paint over it! (Note: the sign was removed before August 22nd!) 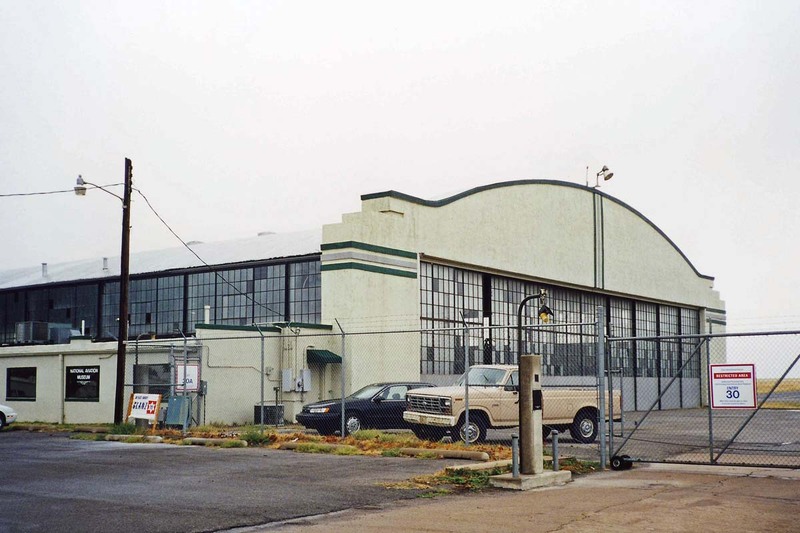 This industrial site was home to Aircraft Assembly Plant #3 during W.W.II, with Douglas Aircraft Company building bombers for the war effort. 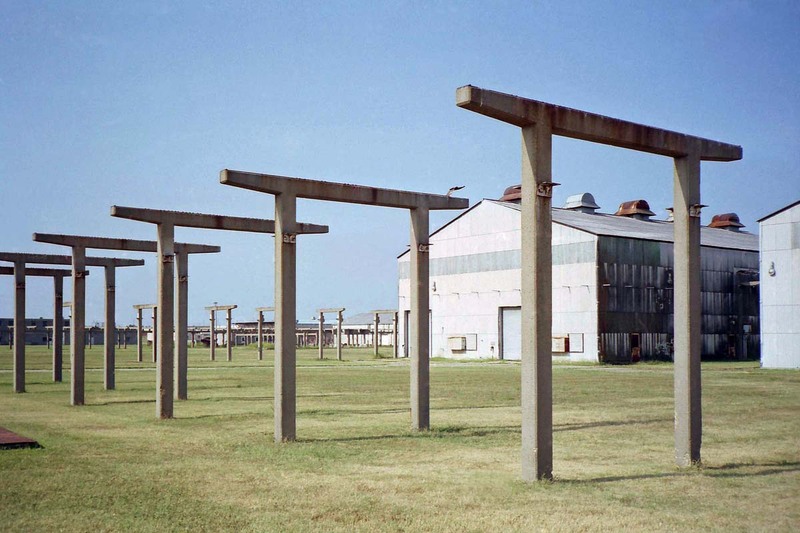 It was shut down after the war, but was reactivated a few years later to produce B-47 bombers. 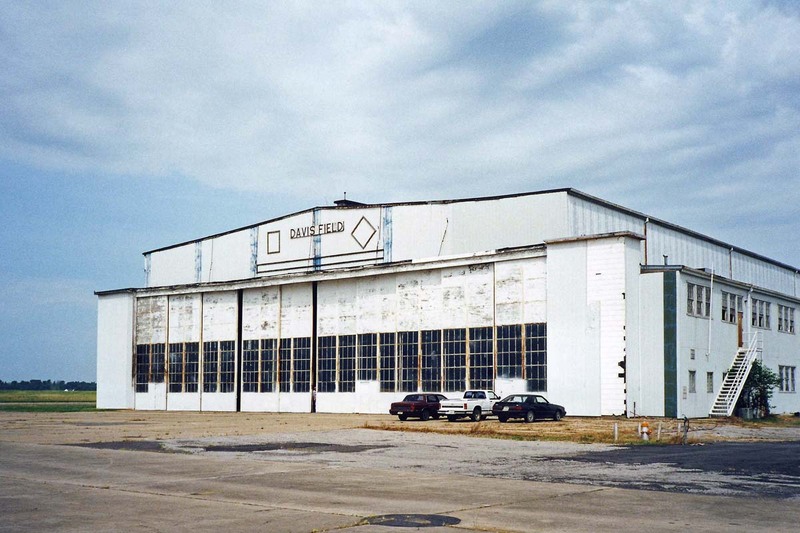 McDonnell Douglas stopped operations in the plant in Jun 1994, and in late 1999 the US Senate approved transfer of the plant (337 acres, 24 buildings) from USAF to the City of Tulsa. 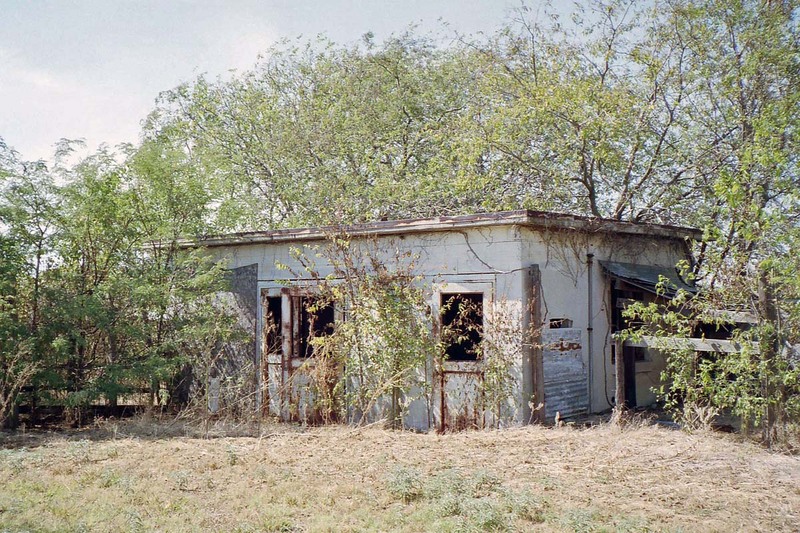 Also still standing are several Guard Houses - Type 2 along the east side of the property. 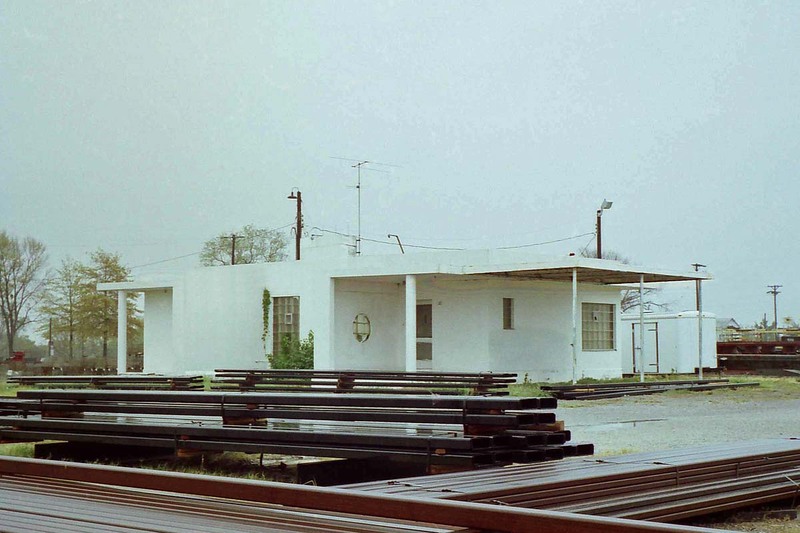 The prominent feature of this installation is the 4000' long assembly building, seen here behind a Guard House. 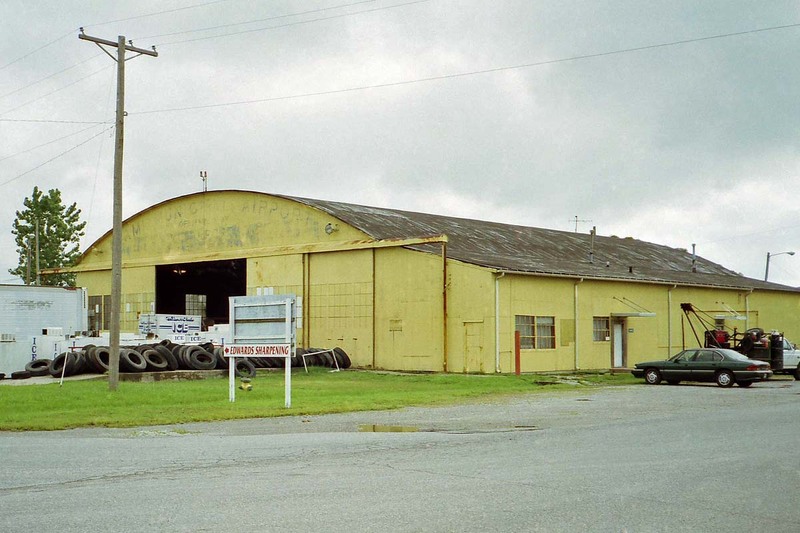 Another former depot facility lies on the northeast part of the airfield at 36-12-33, 95-52-33. 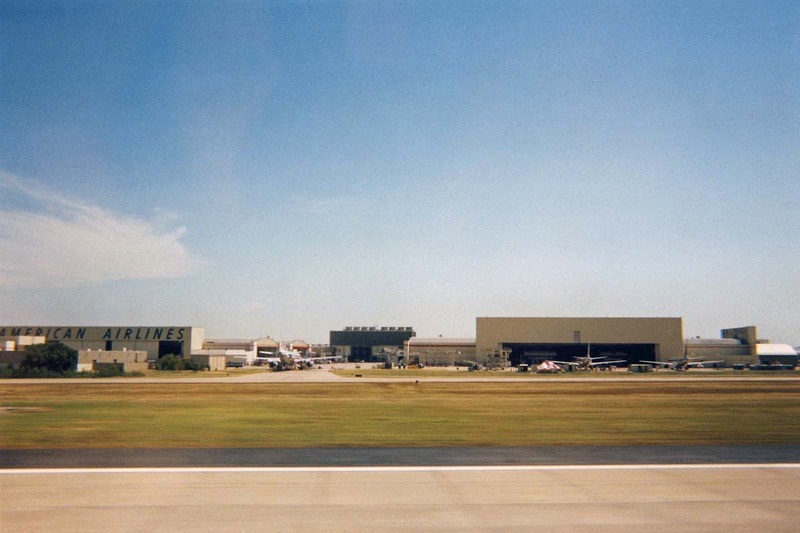 The original matched set of hangars, one with the American Airlines sign, are surrounded by newer construction. 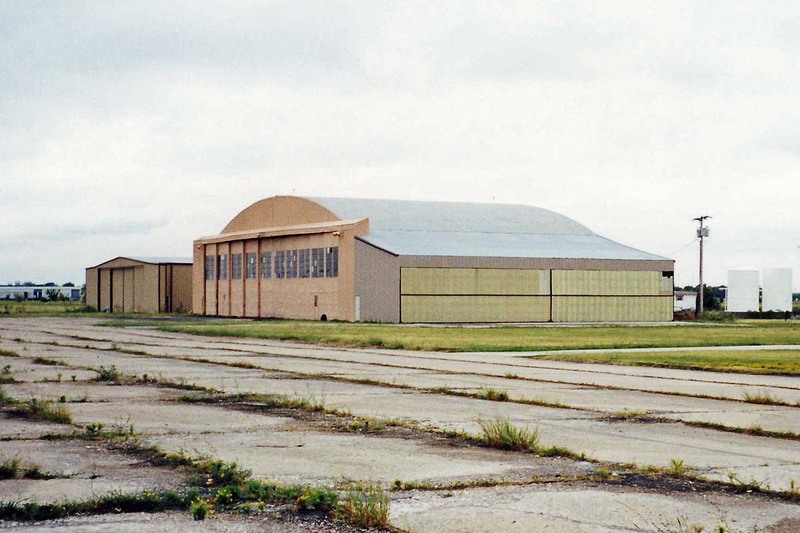 Back in W.W.II, these two large hangars were the key elements of AAF Modification Center #16, operated by Douglas Aircraft. 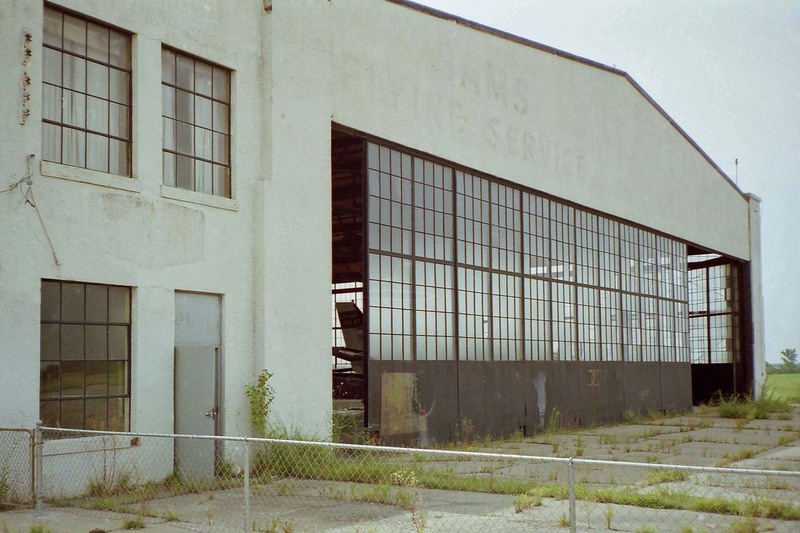 Signage indicates this area is now the American Airlines Maintenance and Engineering Center. 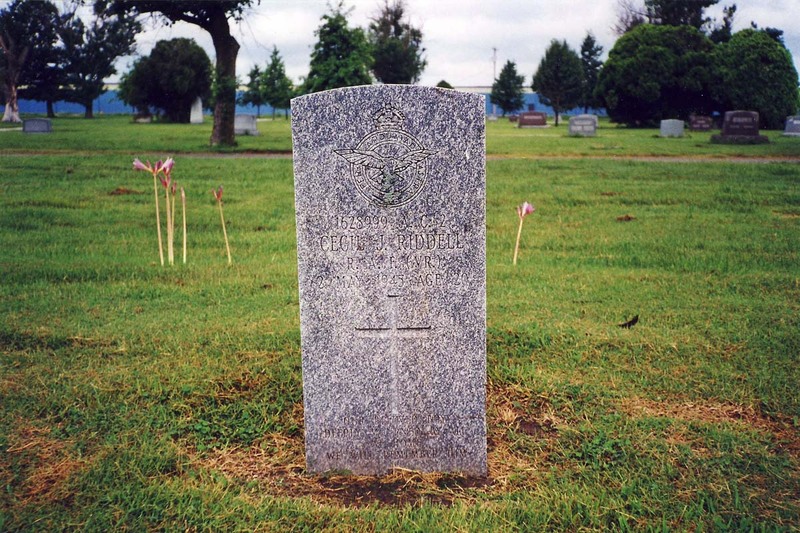 American has been using this former AAF installation since 1946. After a twelve-hour night shift, I took another nap and hit the road about 1330. I first headed north, to Bartlesville. 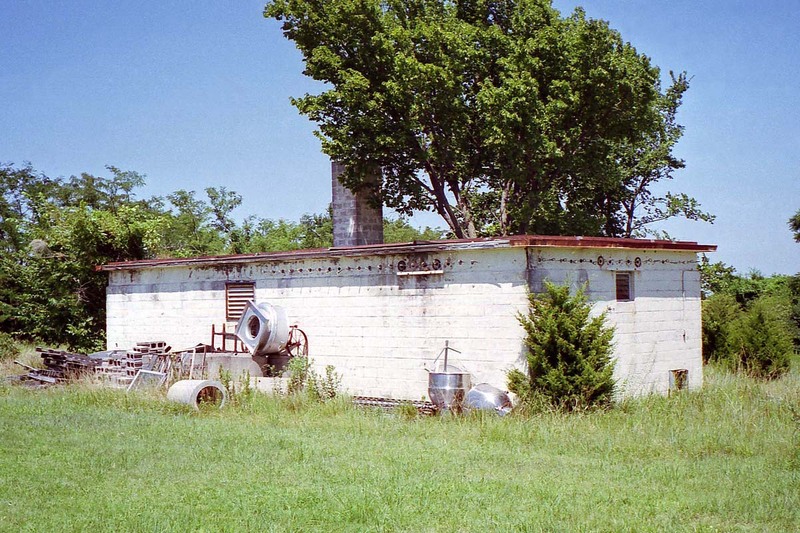 West of town, I found the former Bartlesville AFS (1415), 36-45-39, 96-02-10. 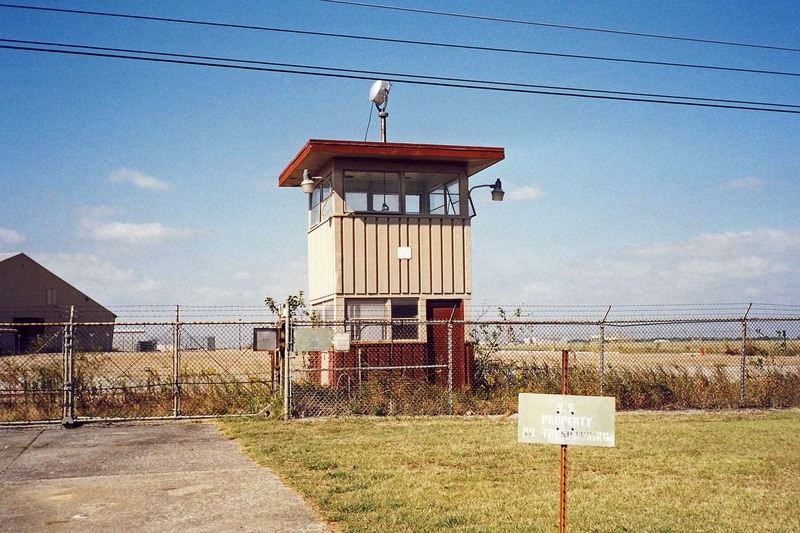 This radar site was operational form 1951 to 1961. 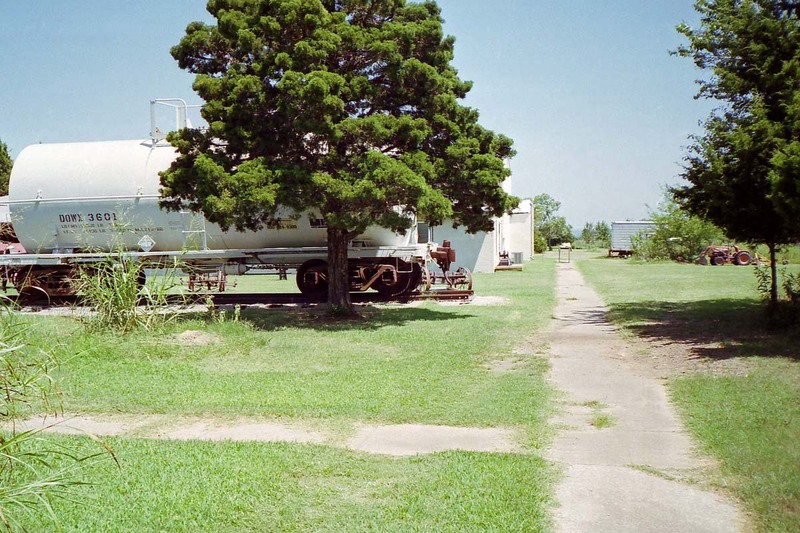 In 1961, the 88.89-acre site with improvements (plus a .06 acre easement for the water pump station) was sold by the General Services Administration for $106,000. Now a mix of commercial and residential uses, it has changed enough that its military background was not obvious. 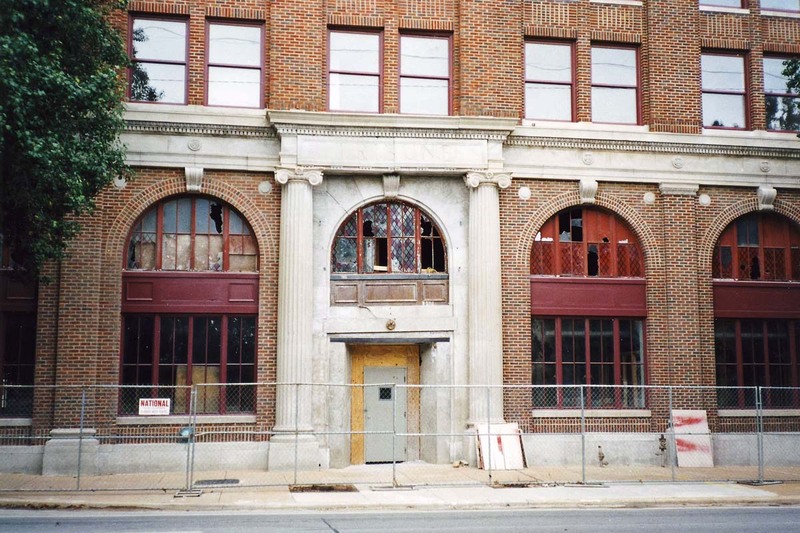 I did go inside the operations building, now home to the Red Dirt Soap Company. Access to the former search radar was blocked by fence and gate, but I was able to see the tower foundation behind the fence. The multipurpose recreation building is occupied by Keepsake Candles. 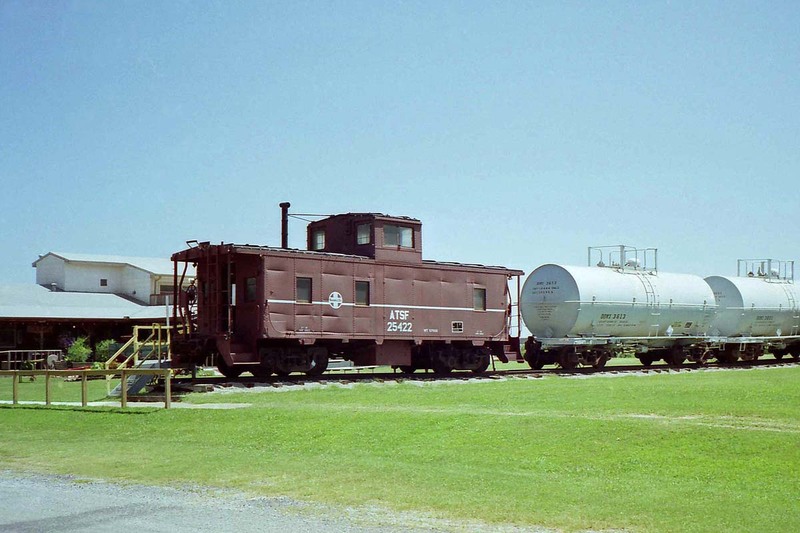 An interesting addition was a railroad caboose and two tanker cars! Parked on a section of track where barracks used to stand (note the sidewalk in the foreground of this shot, it originally led to a dormitory), they had been trucked up the hill several years ago. 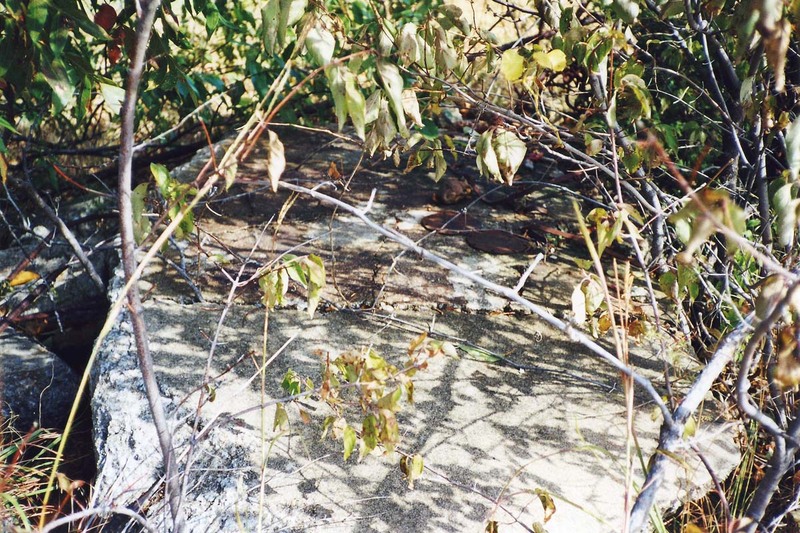 An aerial photo displayed in the caboose shows that the site was quite barren of vegetation when it was operational -- it sure has plenty of trees now. And quite a nice view. 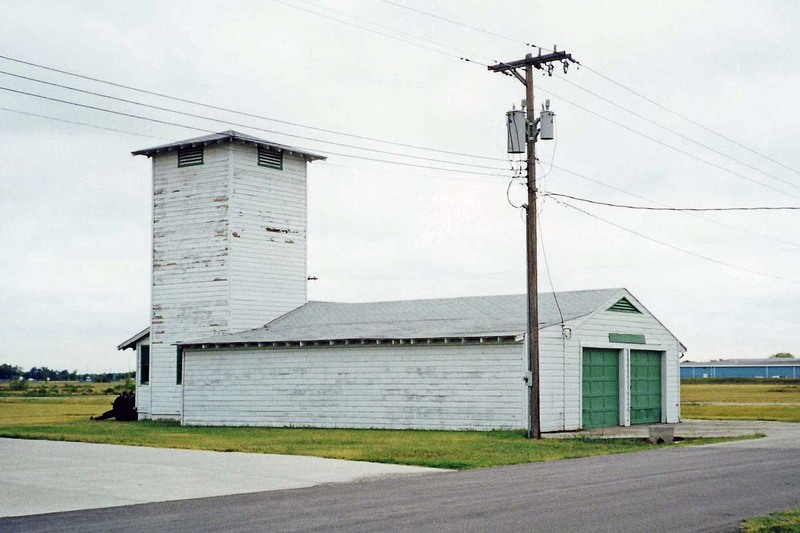 Other buildings still standing are the water pump station, auto maintenance shop, power plant, communications building, and this one (possibly the fire station). 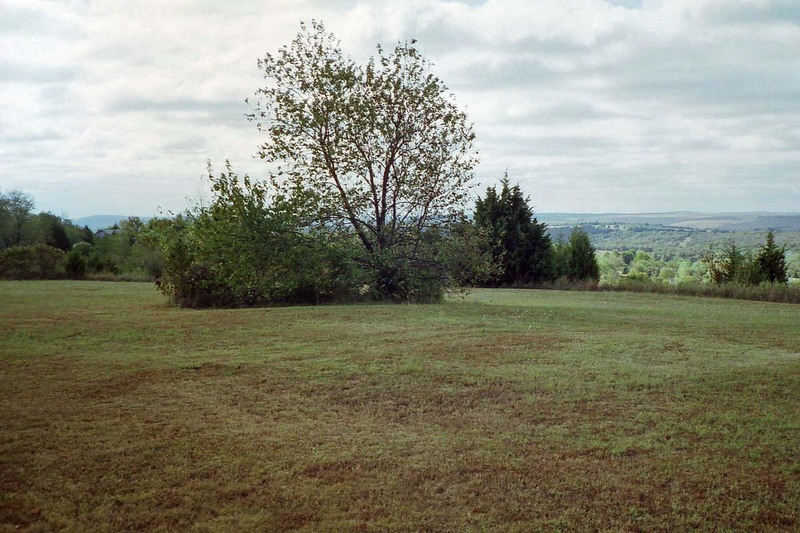 This clump of brush may have been the location of the height finder antenna tower. 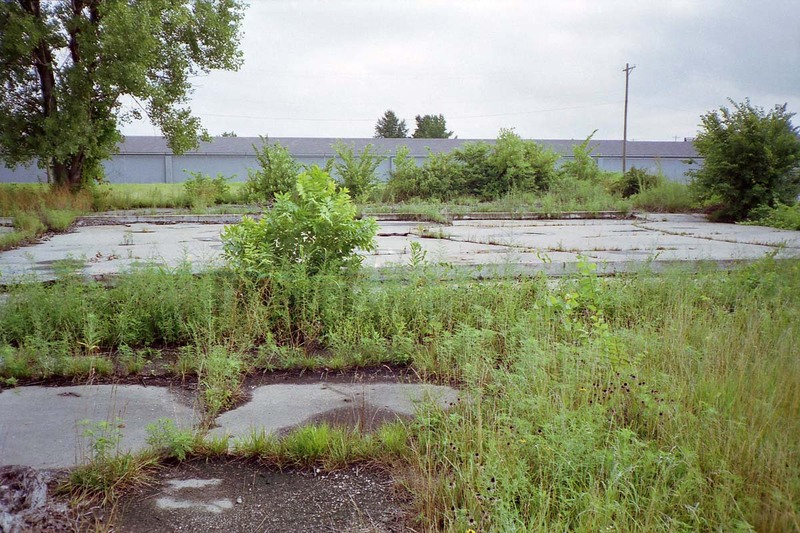 When you look close, you see that the weeds conceal a pile of broken up reinforced concrete. After this visit, I headed home, bringing this trip to a close. 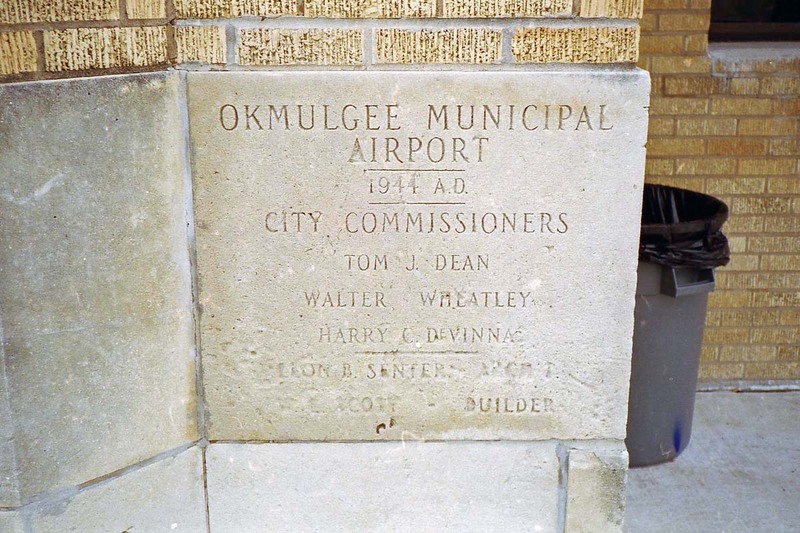 Only one stop on this drive from DFW to Tulsa, Okmulgee Municipal (OKM), OK, 35-40, 95-57. 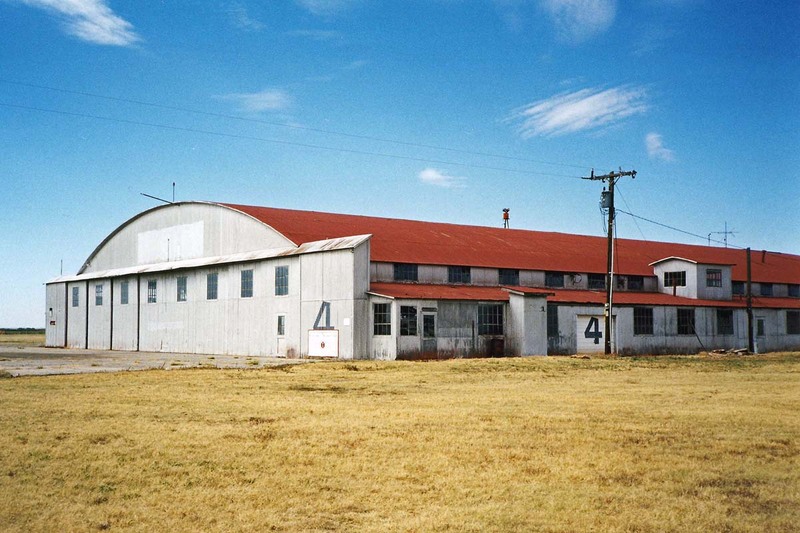 During W.W.II, the Army Air Forces had a contract glider school in Okmulgee. 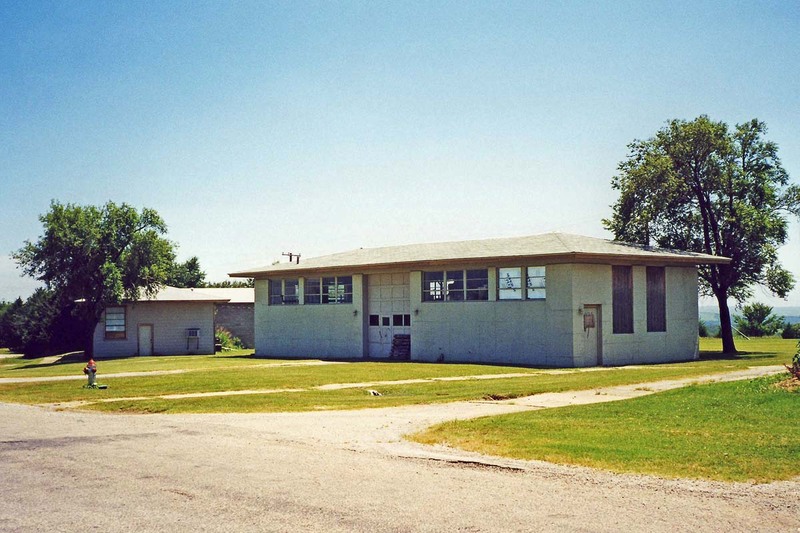 The Sooner Air Training Corporation operated the school. 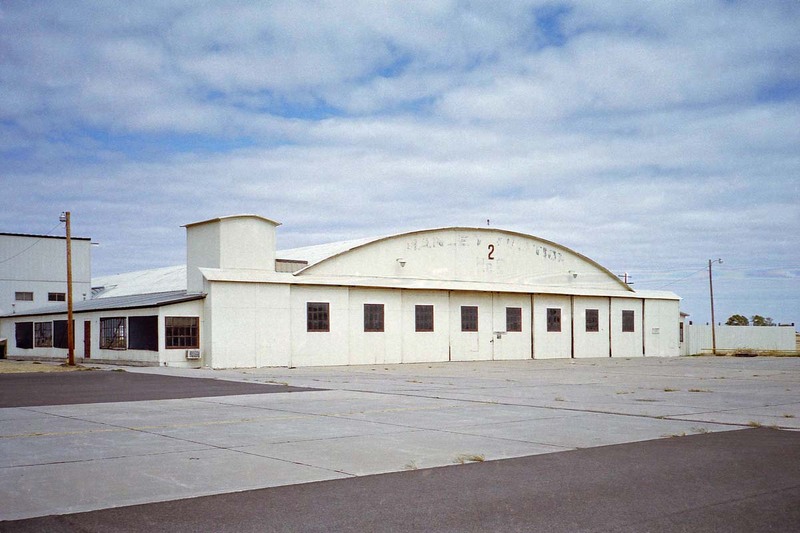 The main hangar at the airport was built late in the war, in 1944. I have not determined if the glider school was on the grounds of the present airport, although it seems likely. I checked out of the Sheraton at a leisurely 0715, and headed to Miami, OK. 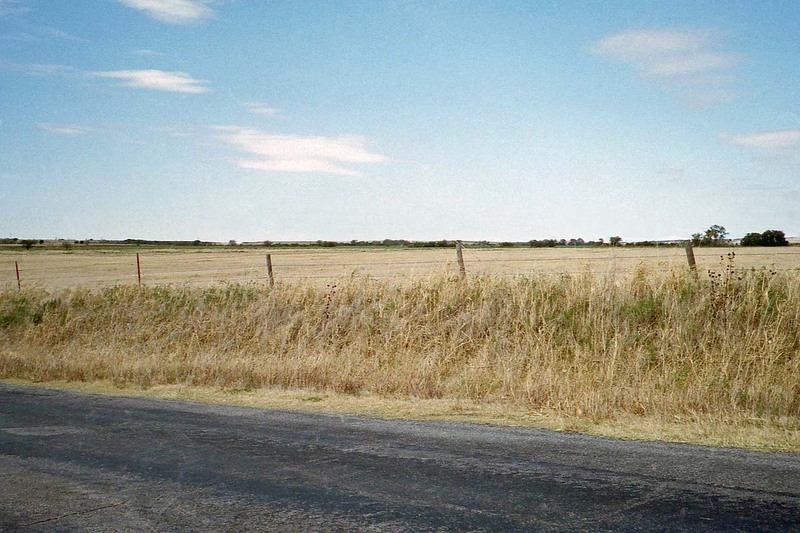 I used the old US Route 66 as much as possible; part of it is now marked as "Historical Route 66" which made it easy. In Miami, my objective was Miami Airport, home to British Flying Training School No. 3 during W.W.II. 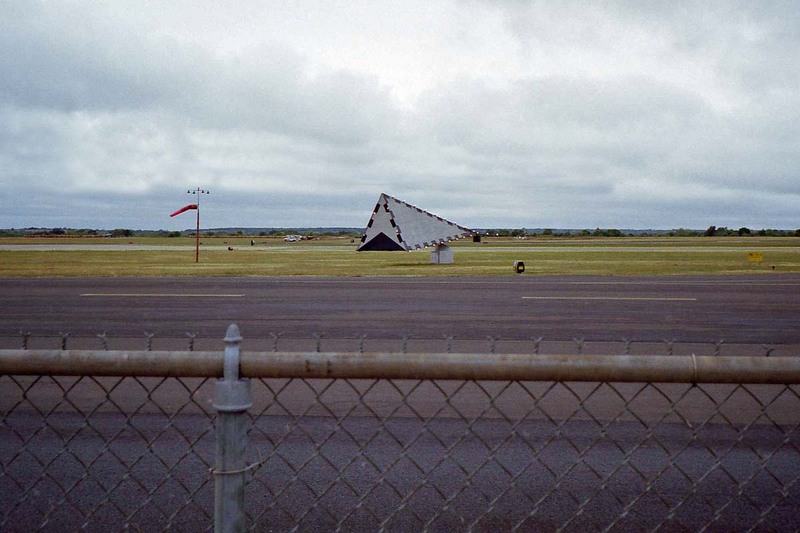 This was an AAF contract flying school. The airport is still active, as Miami Municipal (MIO), 36-54-45, 94-53-00. Thanks to some planning assistance from Tony Broadhurst, I knew where to look for the flying school buildings. They are located outside the fence of the current airport. 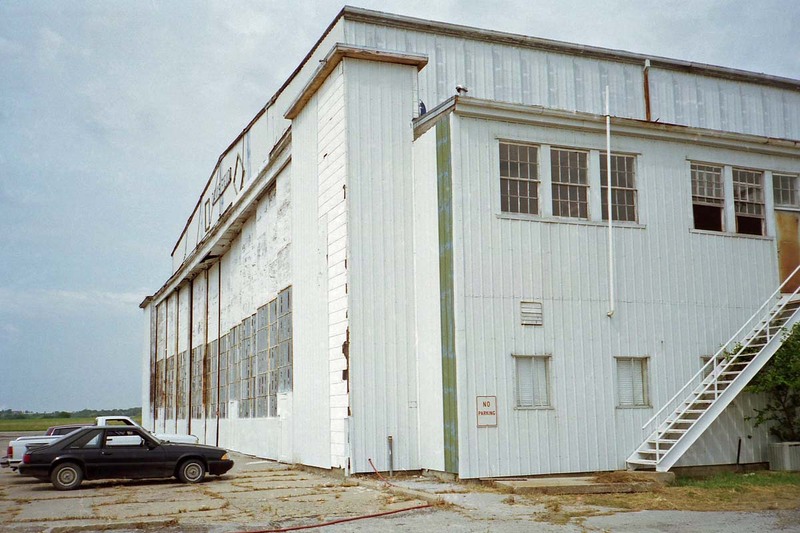 The original hangars are used for industrial purposes, and the faded airport lettering is still visible on one of them. 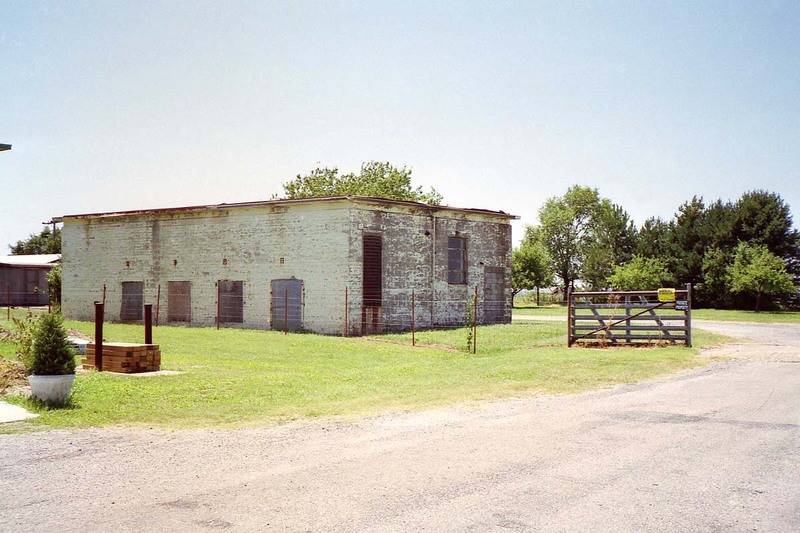 The barracks still stands, but an automotive shop is located where the administration building once stood. 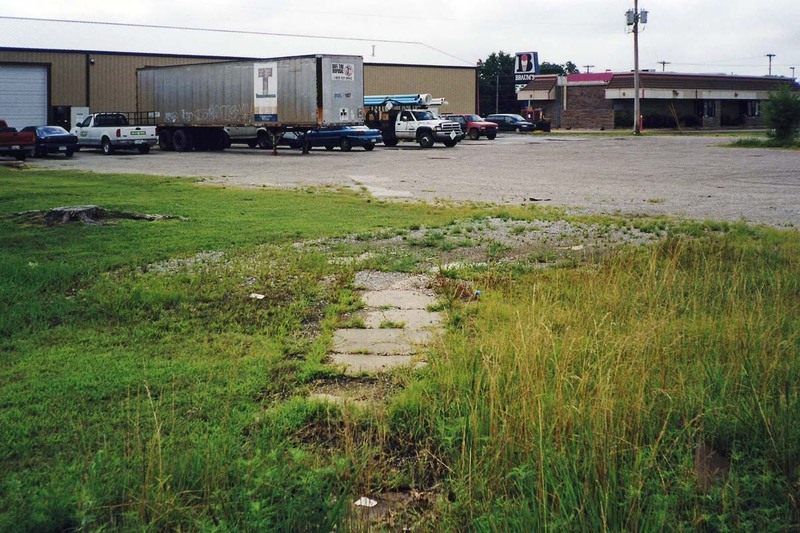 There are remnants of the sidewalk that led from the dining facility to the administration building. Foundations are evident for the dining facility, school building, and gym. 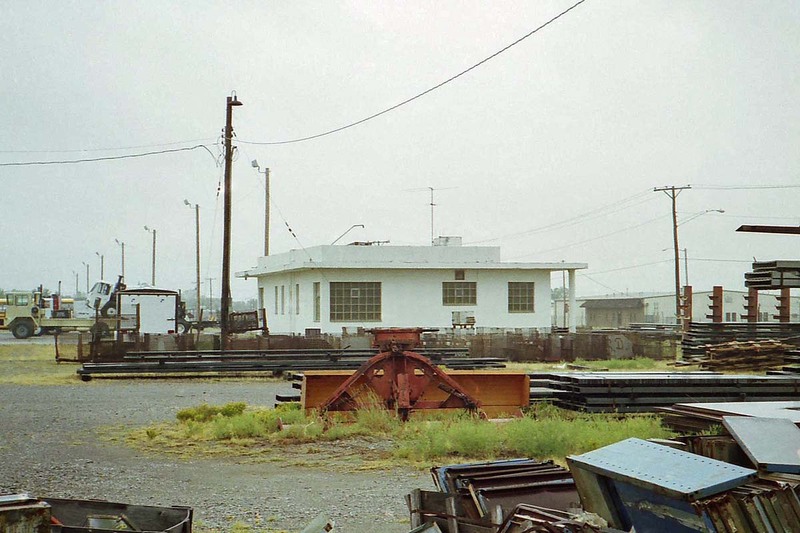 The railroad spur is still in place and looked like it had occasional use. 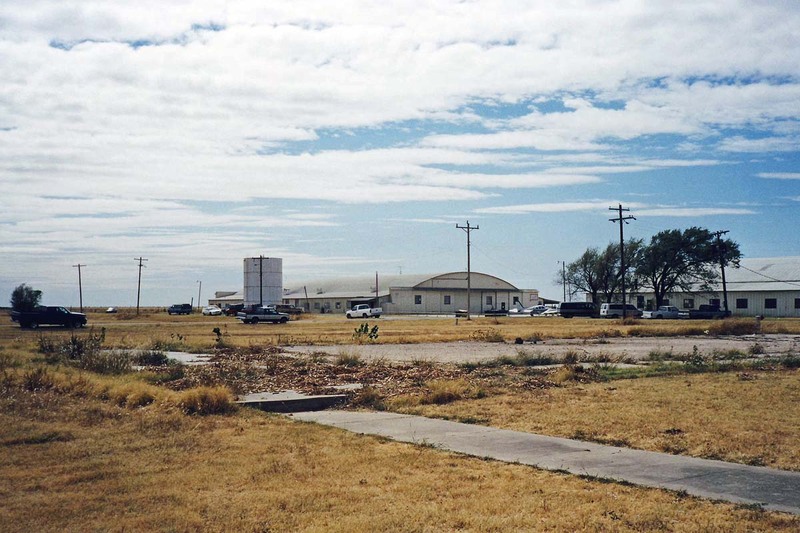 It is interesting to note that the main road in front of the flying school was US Route 66, and the administration building was converted from a failed motel/garage complex (complete with gas station island in front). 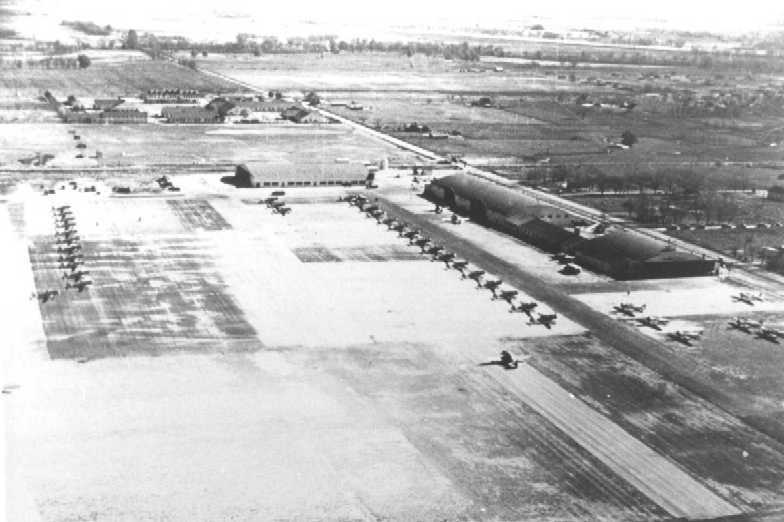 An aerial photo by Albert Pegg, taken while he was in training (and used with his permission), shows the hangars from a different angle -- the shorter hangar to the right is the one with the faded markings I mentioned above. From Miami, I ventured east in search of Ottawa Gap Filler Annex. I had determined the approximate location (36-51-36, 94-47-10) from GSA disposal documents available at NARA - SW Region. Unfortunately, this site is now "landlocked" behind private property so I was unable to see any evidence of the facility. At this point, I was close to the Missouri border, so a visit to Neosho, MO, and Air Force Plant #65 (5357, ACHW) seemed in order. 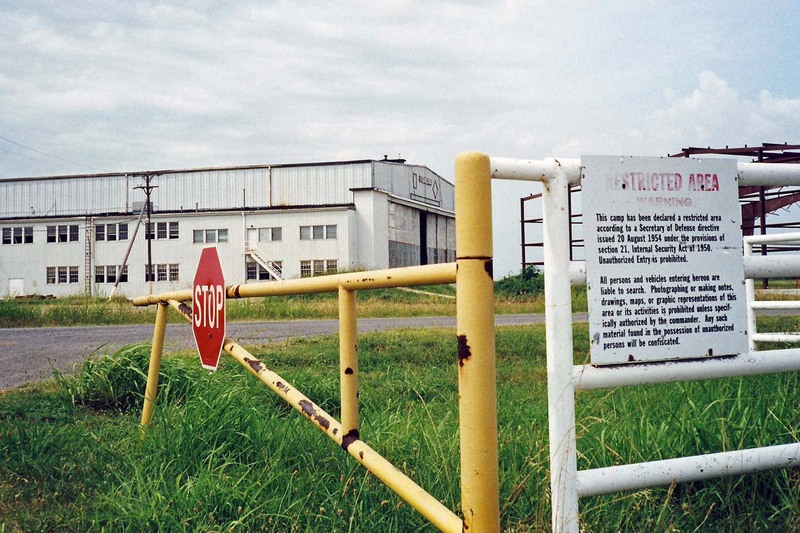 Located on part of the former Fort Crowder, North American Aviation ran this government owned plant. Their Rocketdyne Division tested rocket motors here. I don't know the exact period of use, but believe it to be from sometime in the late 1950s until about 1970. 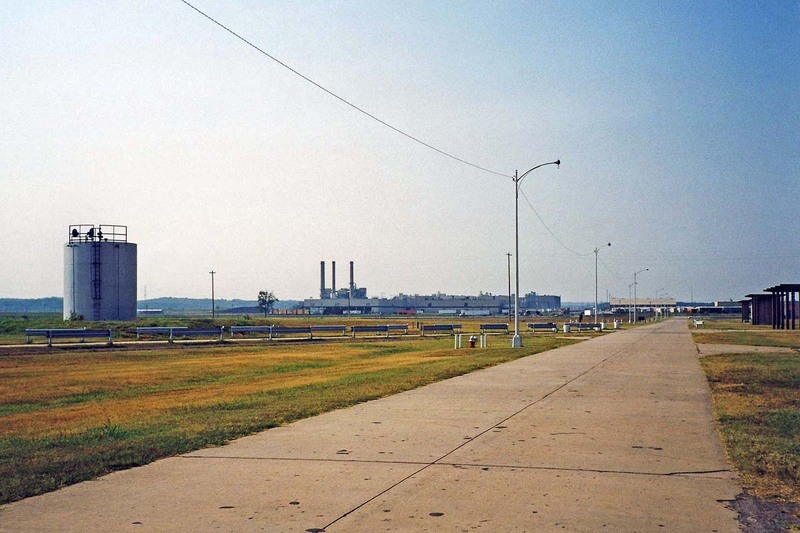 The plant consisted of two main areas, connected by a rail spur. 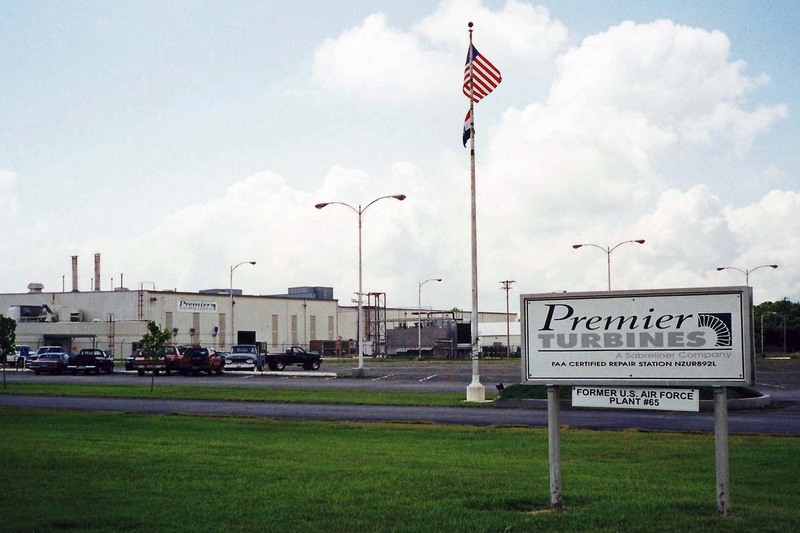 This large building, at 36-49-55, 94-21-33, is now used by Premier Turbines. Their sign gives a hint at the facility's military past. 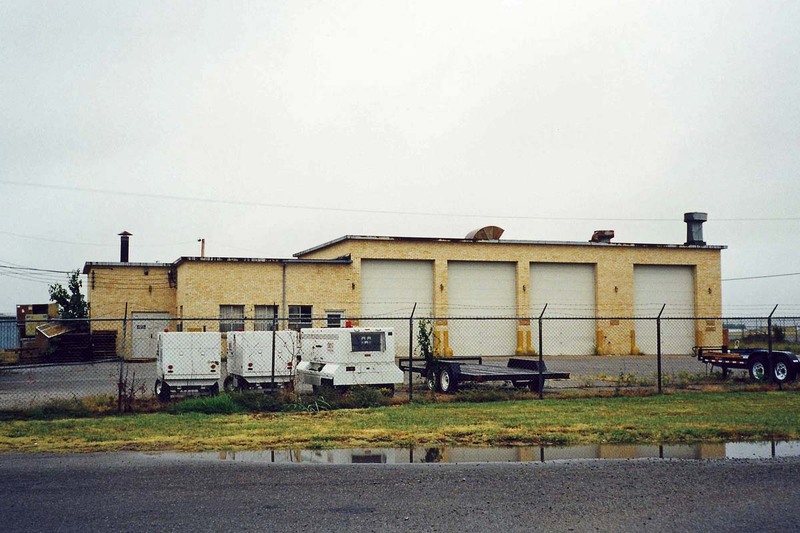 A larger plant complex lies to the ENE of this building, connected by a rail spur, but that area is not accessible by vehicle. From Neosho, I headed home. On one of my rare weekends off, I took a little side trip. Since it was sandwiched between several Tulsa trips, I include it here. 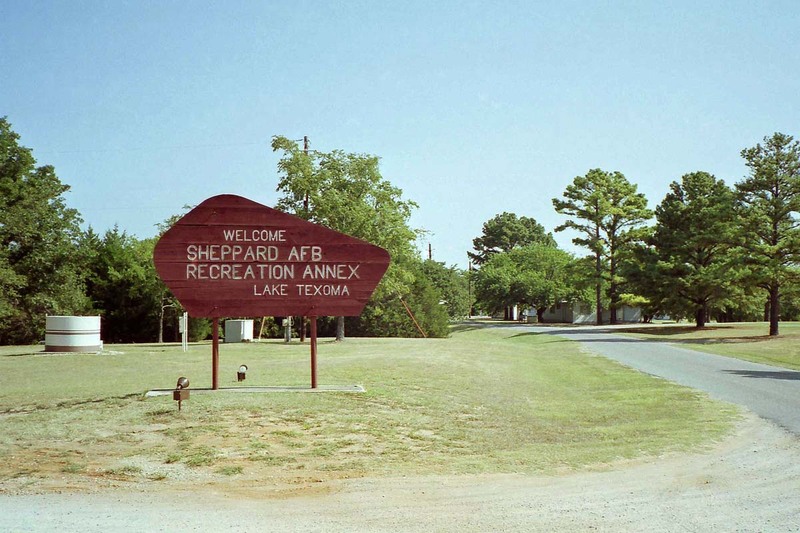 Sheppard AFB operates the Sheppard Recreation Annex (VPFP), on Lake Texoma, at 33-52-48, 96-53-41. 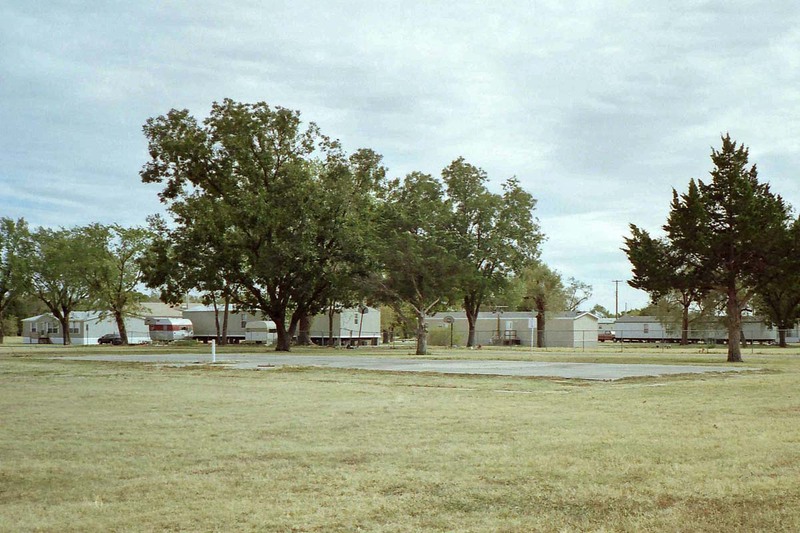 This recreation area, with cabins, boats, camping spaces, a lodge, and a 2,400' grass airstrip (note the windsock, barely visible against the trees), has been operational since at least the mid 1970s. 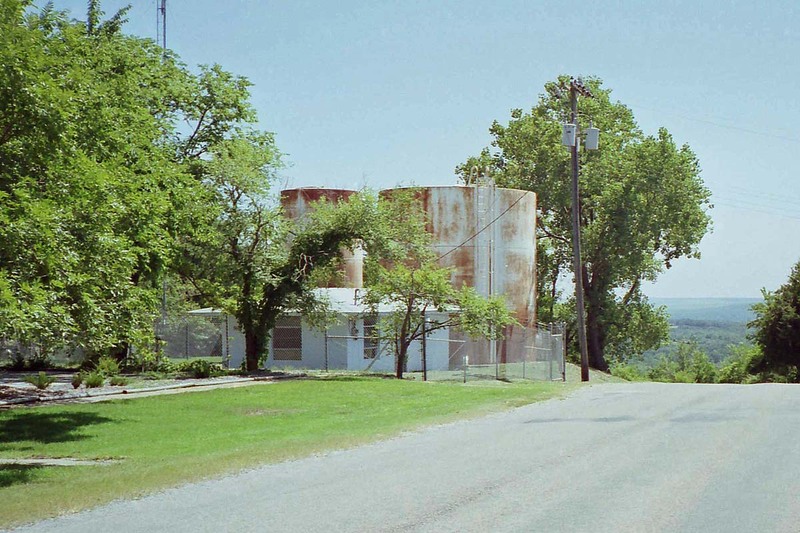 Enroute from DFW to TUL, I stopped at the former Muskogee High Energy Fuel Plant. 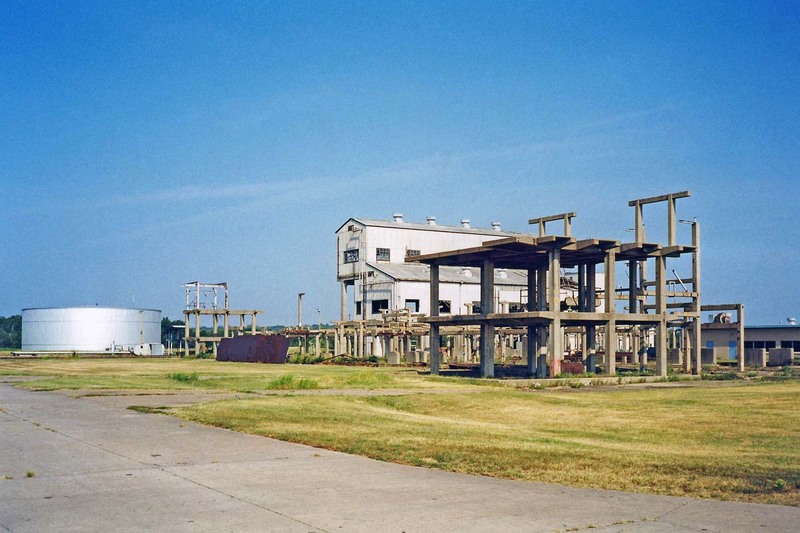 This former chemical plant produced "Boron based fuels" for the Air Force and the Navy. 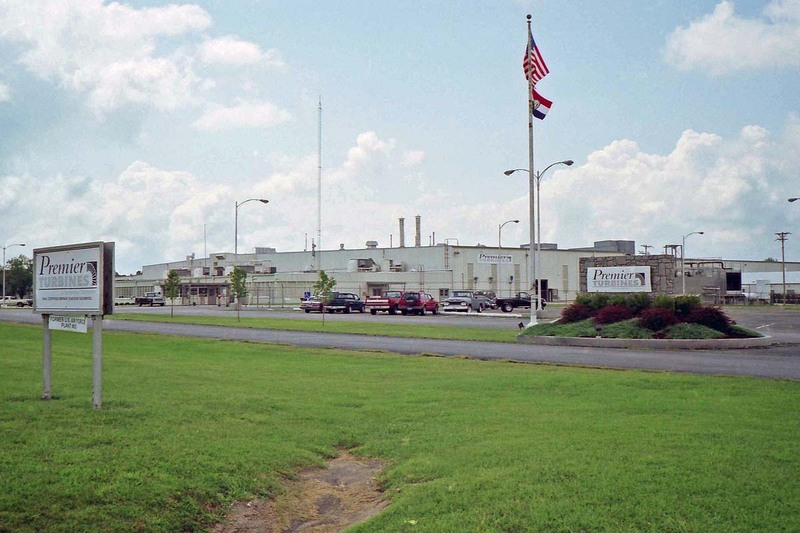 The land was acquired in 1956, and the plant was constructed in 1959. 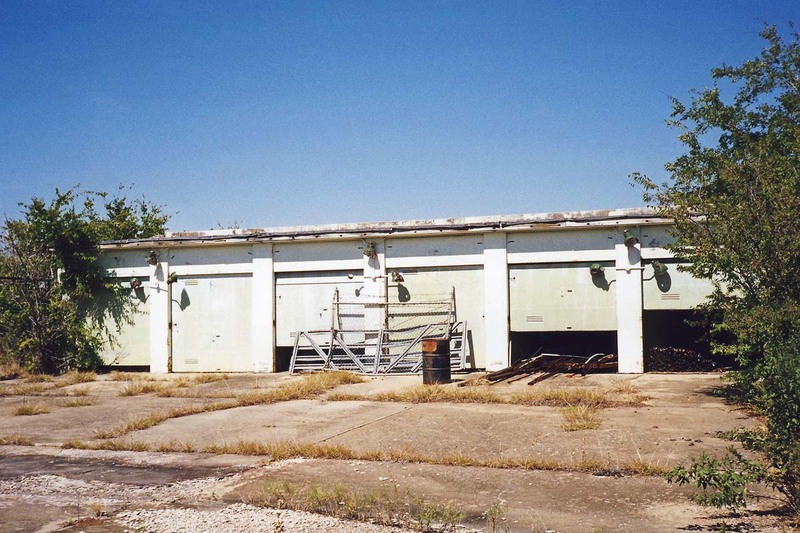 It operated under Navy control until the Air Force assumed control of the plant in 1960. 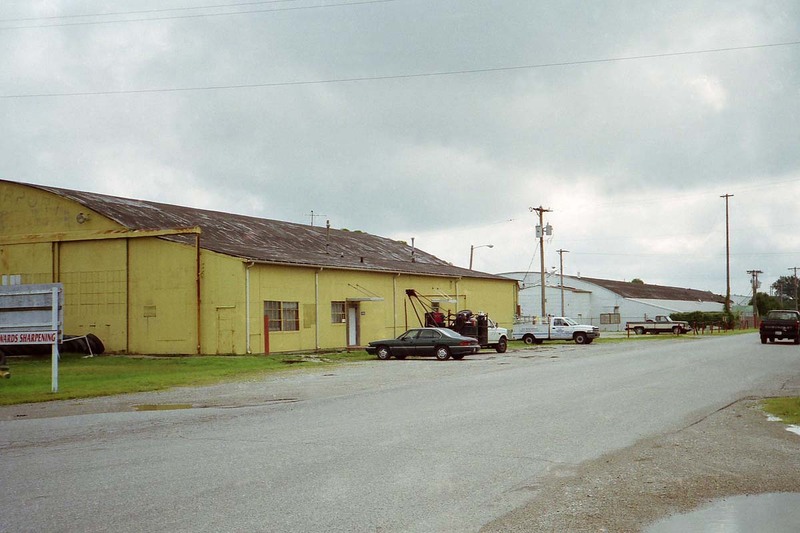 Callery Chemical Company operated the plant. It ceased operations and went on a stand-by basis in Mar 1962, and was disposed of in 1964. 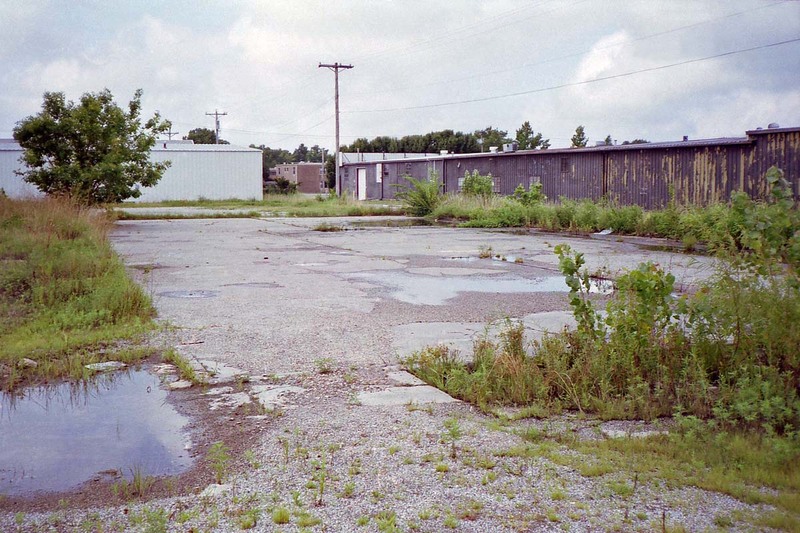 Now, it is a partly abandoned industrial park, 35-44-45, 95-17-55. The sign at one entrance indicates Frontier Terminal. 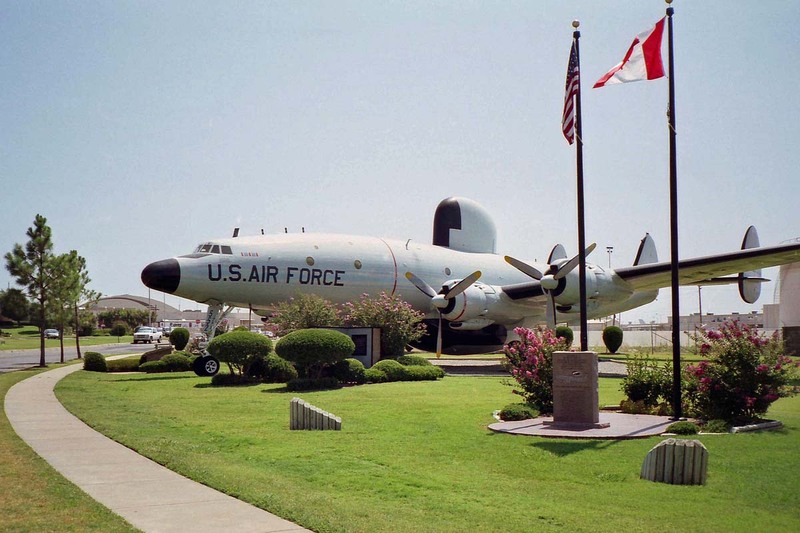 I visited the Oklahoma Air National Guard base at Tulsa International Airport (XHZG). Lt Col Willie Braggs III was kind enough to give me a tour of the base, which I greatly appreciate. 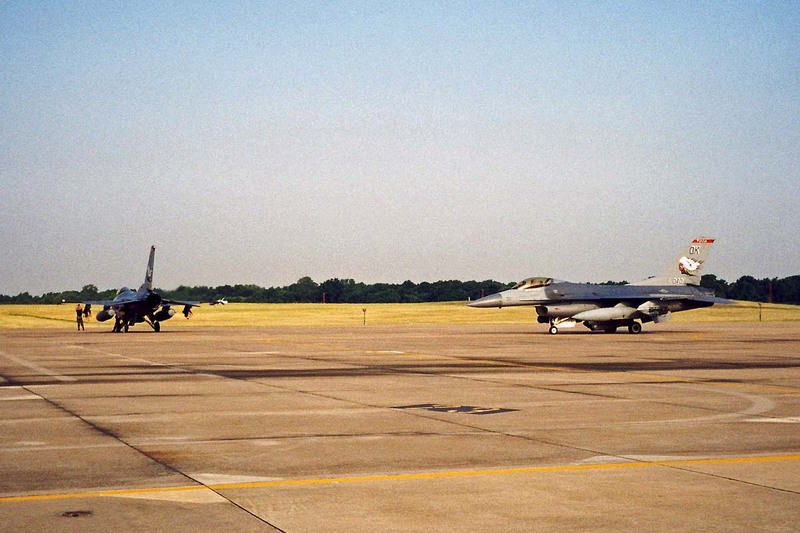 We went to the edge of the flight line and watched a pair of F-16s taxi out from their distinctive metal shelters. 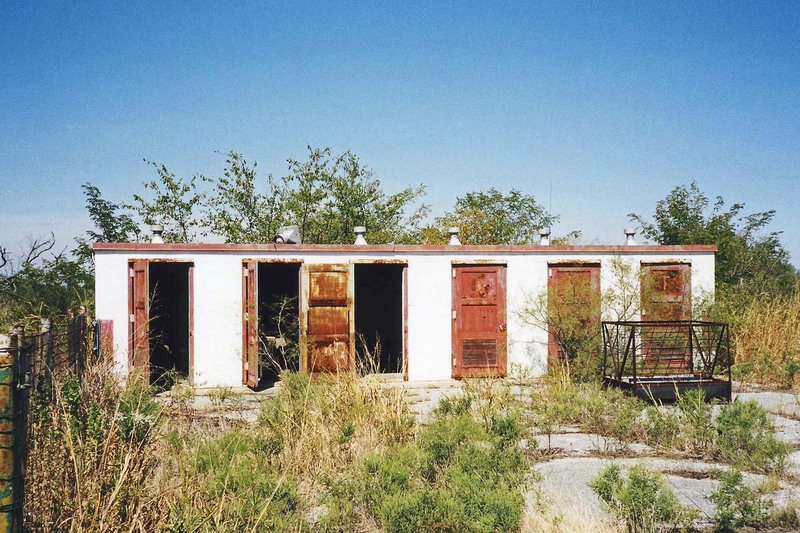 These shelters were a local initiative, built in the early 1990s. Col Braggs and I each started our Air Force careers back in the 1970s, and we discussed how far the Guard has come in terms of equipment, missions, and respect. I was impressed with everything and everyone I saw. I recall the "old days" when Guard troops looked a bit shabby in uniform, but the NCOs and officers I met here were as spit and polish as any on active duty. 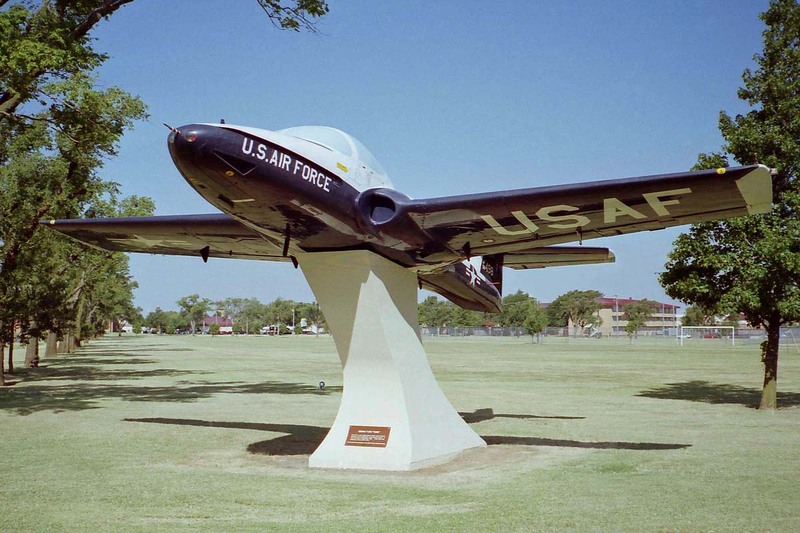 At the northeast corner of the base, an F-86D, F-100D, and A-7 stand guard, representing the previous aircraft of the 125th Fighter Squadron. And of course, I visited their BX while I was there! 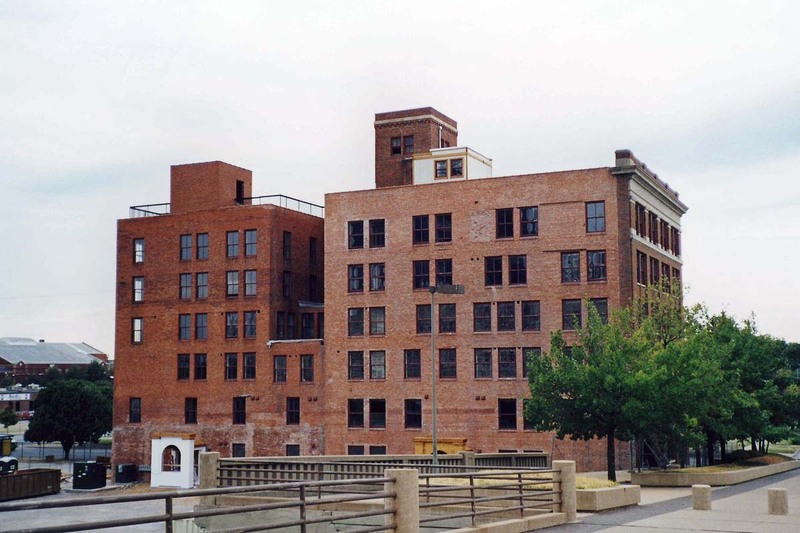 The headquarters building is soon to be replaced by new construction. 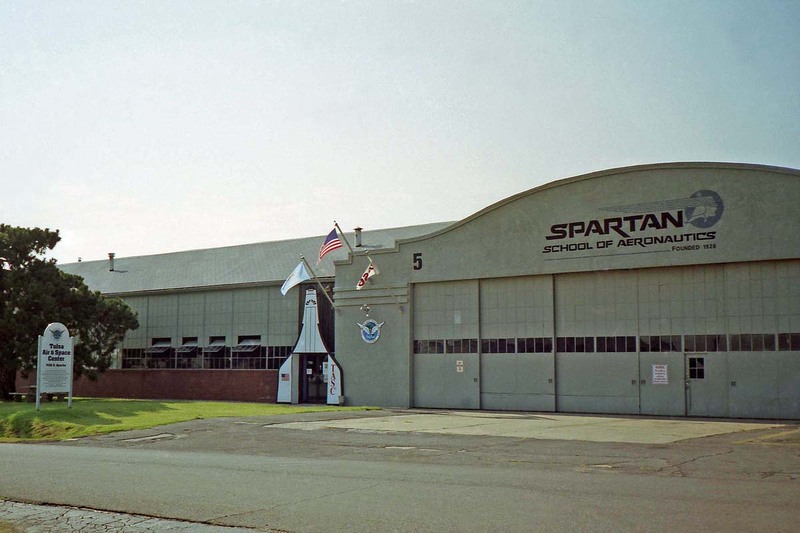 I also sought out the Spartan School of Aeronautics, which operated a contract flying school at Tulsa Municipal Airport during W.W.II. 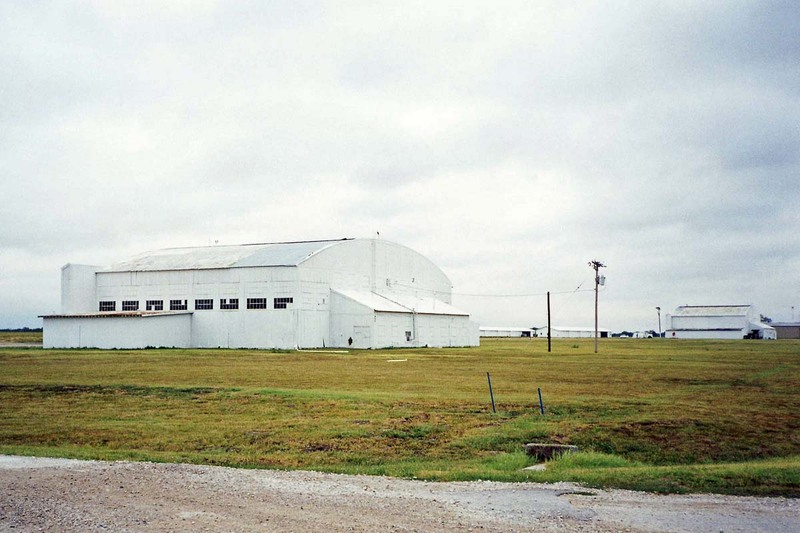 It is still in operation, with several hangars and other buildings in use. 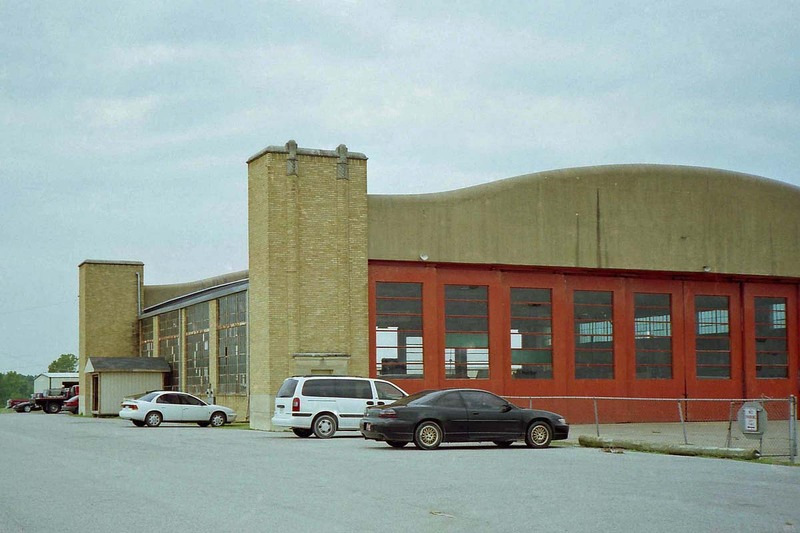 Early in W.W.II, this was a British flying training school. 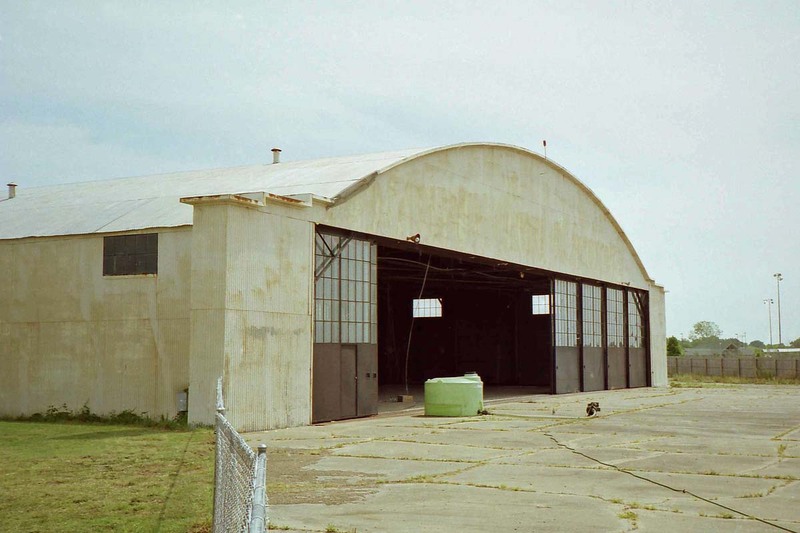 One of the Spartan buildings is the temporary home of the Tulsa Air & Space Center, at 36-11-30, 95-53-47. 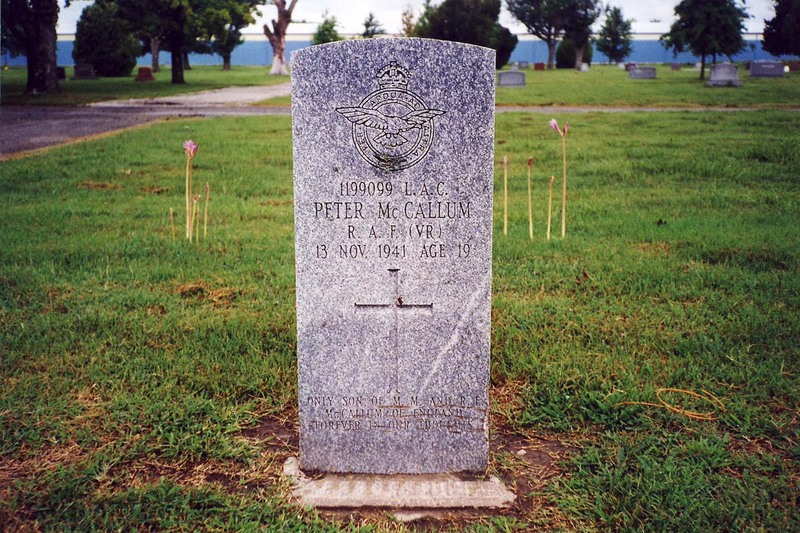 As a tie-in with the RAF flying training, I looked for the lone RAF cadet buried in a Tulsa, in the Tulsa Memorial Park cemetery. 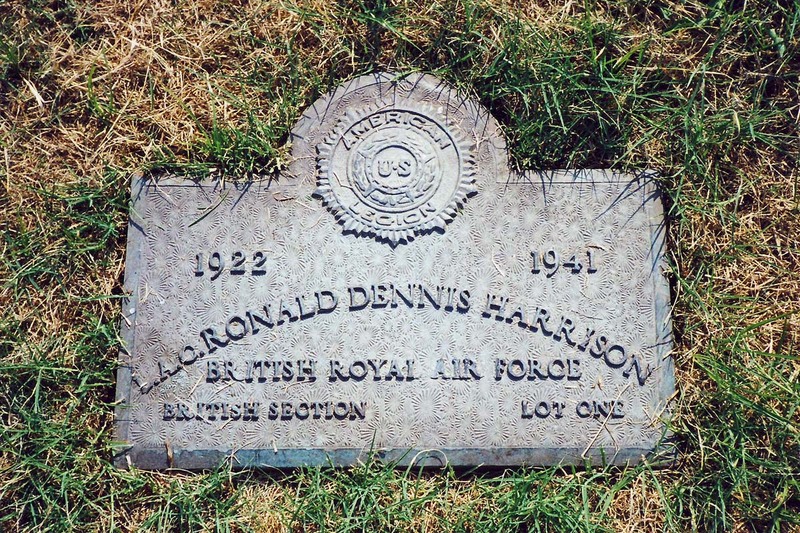 He was Ronald Dennis Harrison, and died during training in 1941. 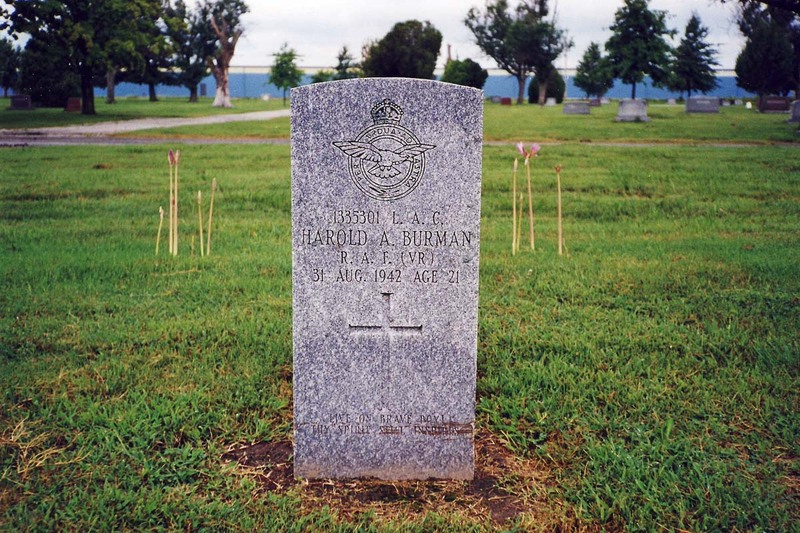 His grave is in the American Legion section, and has an American Legion style stone; quite different from the standard RAF design markers I have seen at Terrell, TX, and Miami, OK. 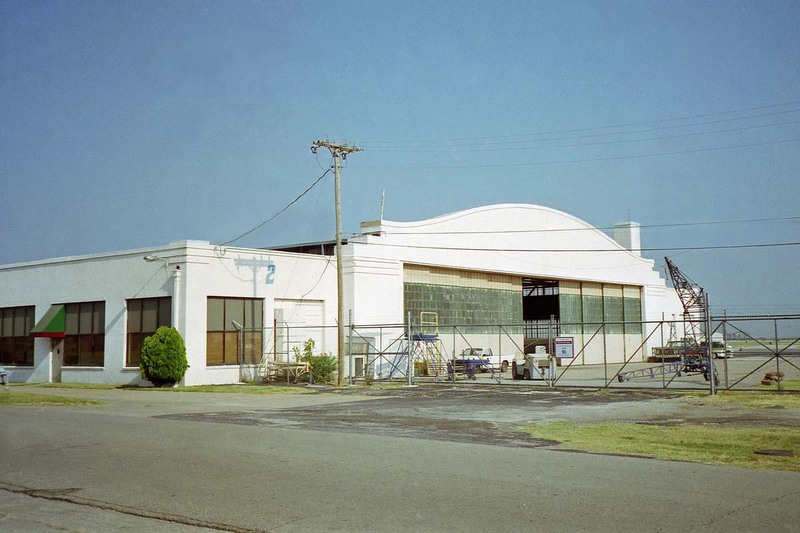 Disposal documents for Tulsa Transceiver Control Station (4918) give its address as 1226-1228 East 2nd Street. 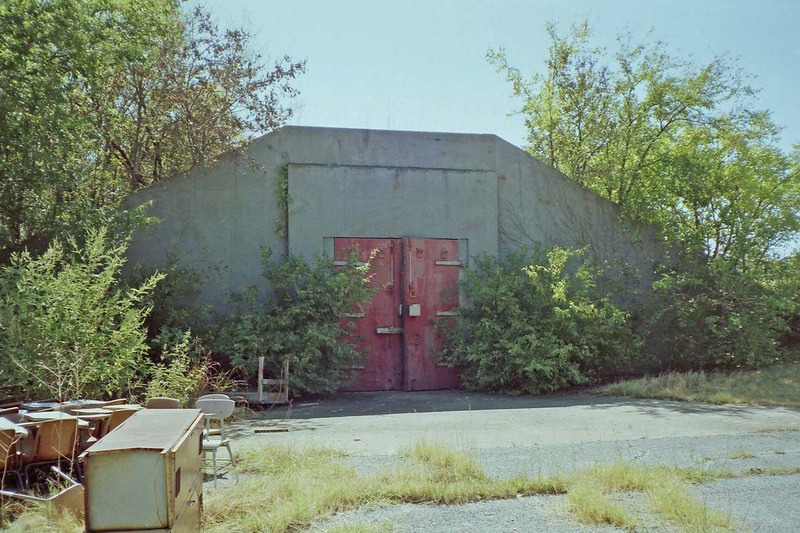 I found a likely building at 1232, and found out it was indeed the location of the leased USAF facility, 36-09-26, 95-58-36. 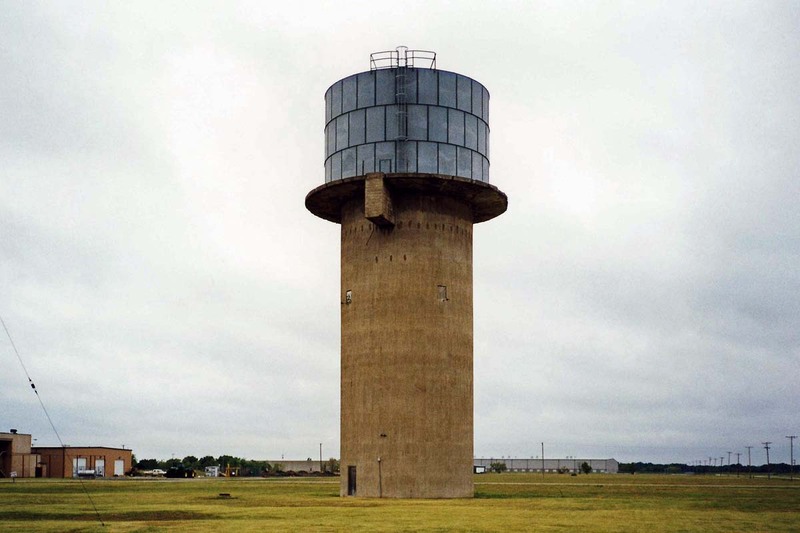 Operational from 1956 to 1962, this installation consisted of 5,200 S.F. (later increased to 7,000 S.F.) of space -- essentially the entire second floor of this two-story building. 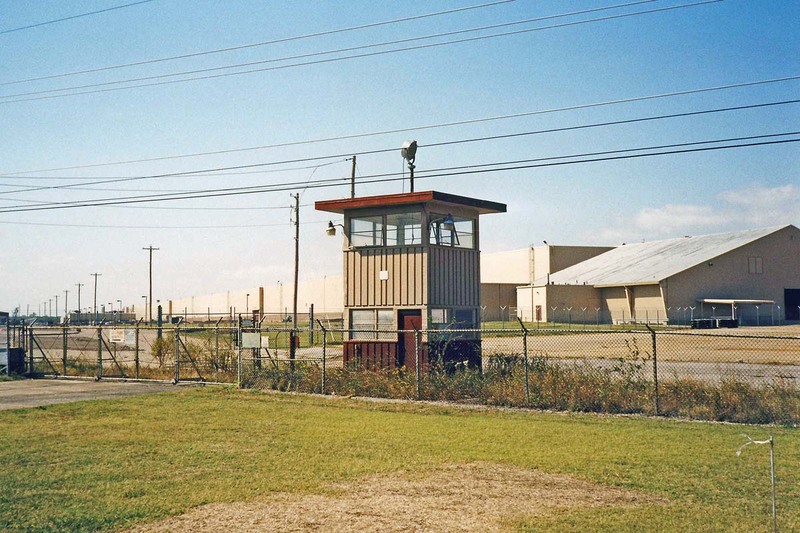 (The windowless section on the right was added after USAF use.) Also included were 395 S.F. 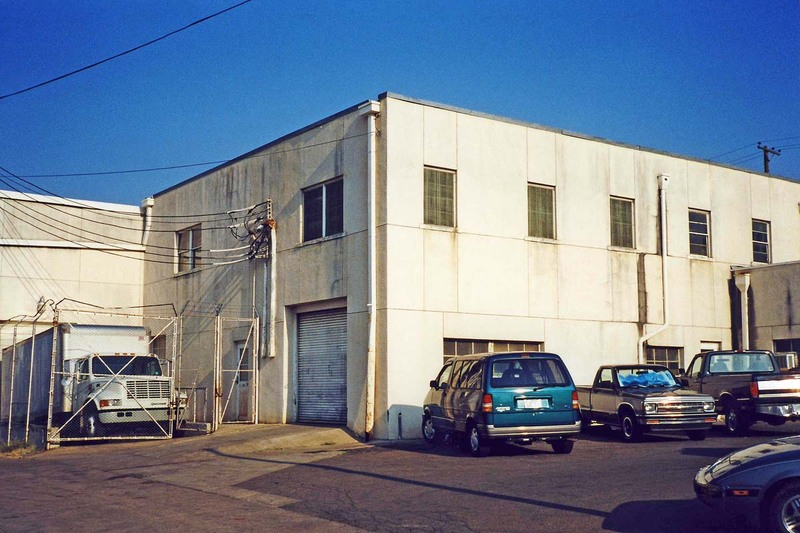 of parking space in back of the building, and air conditioning to be provided by the lessor. 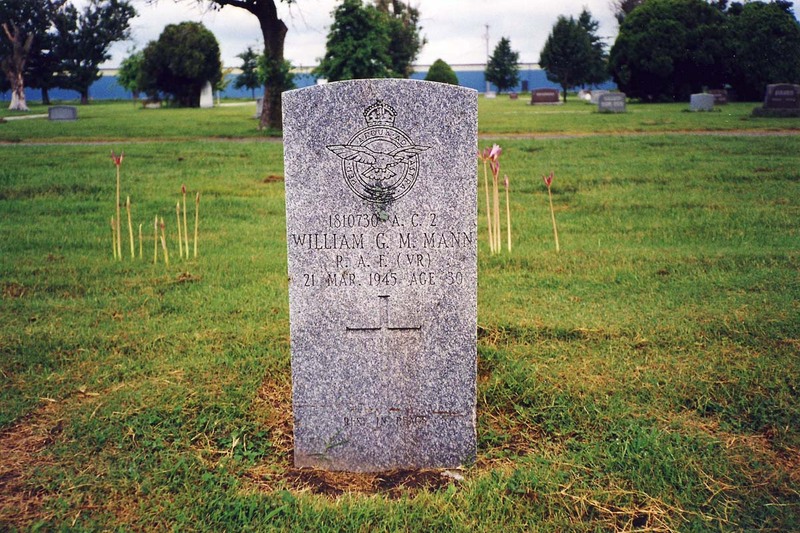 Official records tell me this was an Air Material Command operation, later transferred to Military Air Transport Service, but don't hint at its mission. 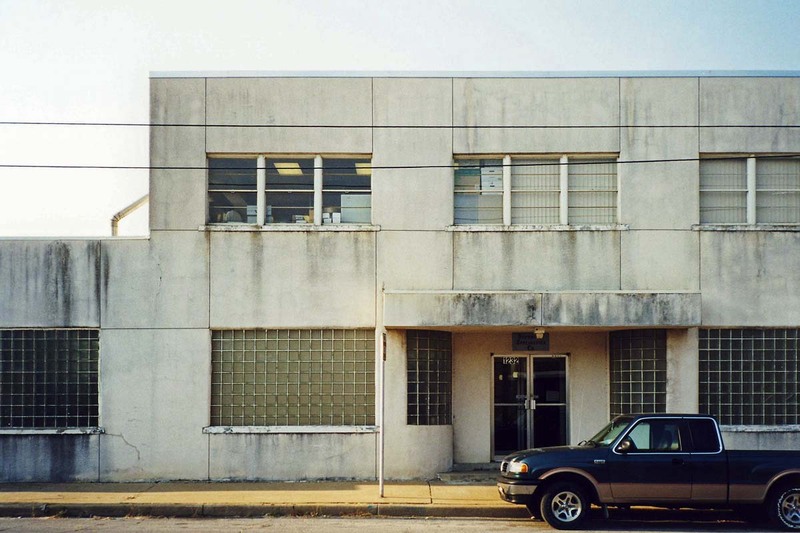 I talked with the present owner of the building, which houses Southern Specialty Services Corp. 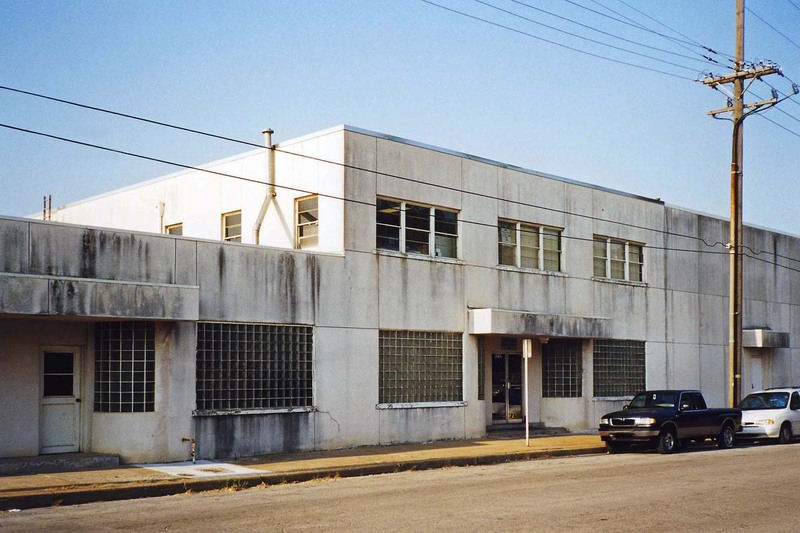 He was familiar with the AF operation, though it ended several years before he bought the building. 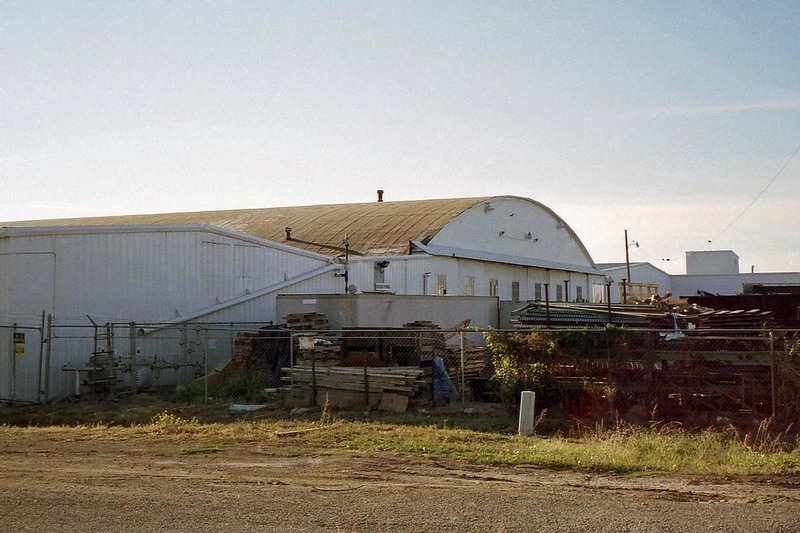 Apparently, the second floor was packed with computer equipment (he specifically mentioned punch card readers) and operated 24 x 7 receiving and updating information on the USAF spare parts inventory, under management from Tinker AFB. I talked with the only remaining employee who was there at the time, and he confirmed this assessment. He recalled giving special attention to the air conditioners, to keep the cold air flowing to their tenant. He remembered a 20-ton unit and a 30-ton unit operating constantly (even in winter) to keep the computer equipment cool. 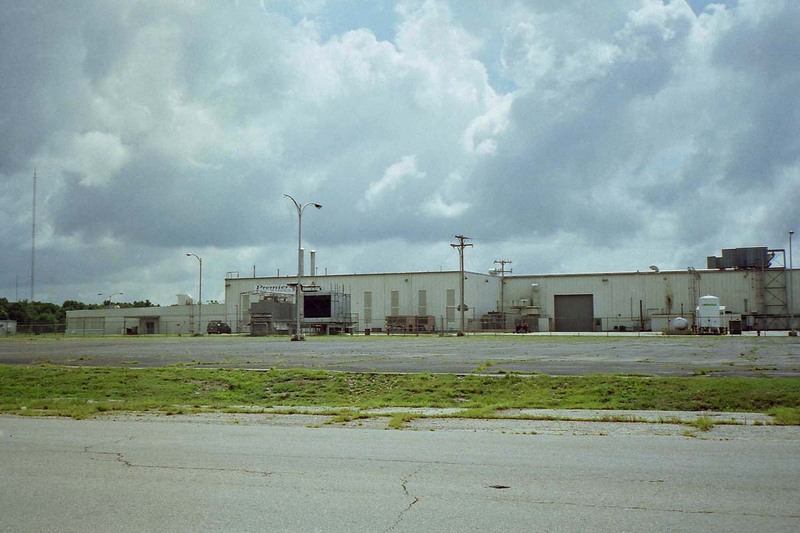 The USAF installed an emergency generator outside the southeast corner of the building. 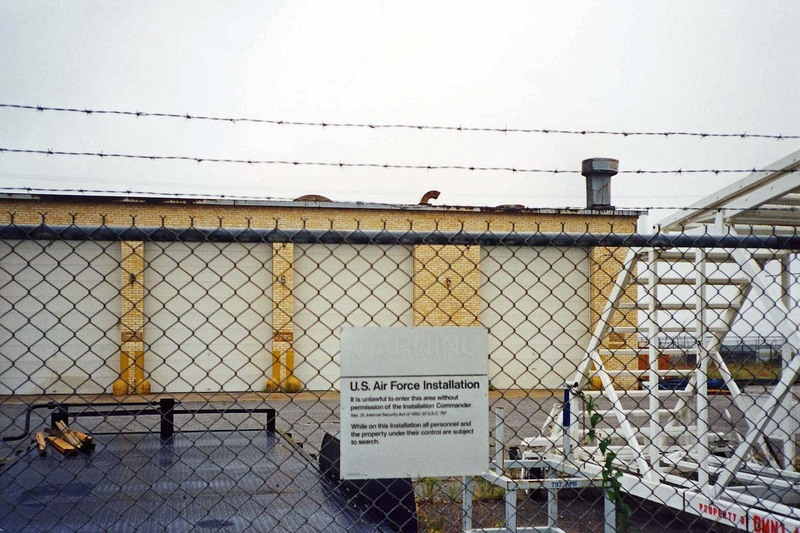 The only remaining physical clue of USAF use is the stub of a power cable, going into the building at the former generator site. 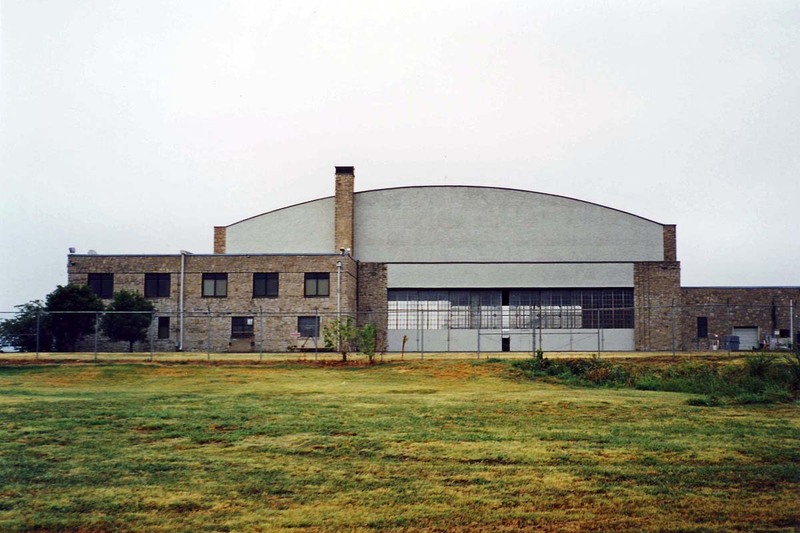 This facility may have played a role in the COMLOGNET system. 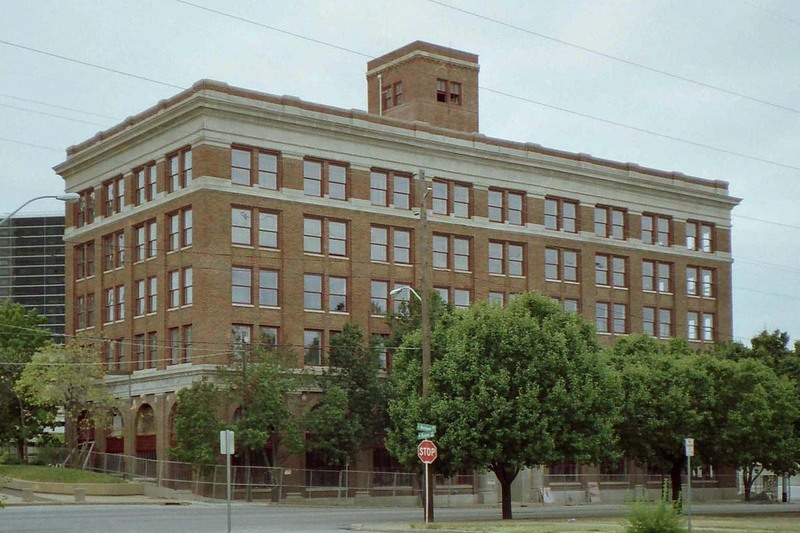 Just on the next block to the west, sits a Southwestern Bell telephone company building. 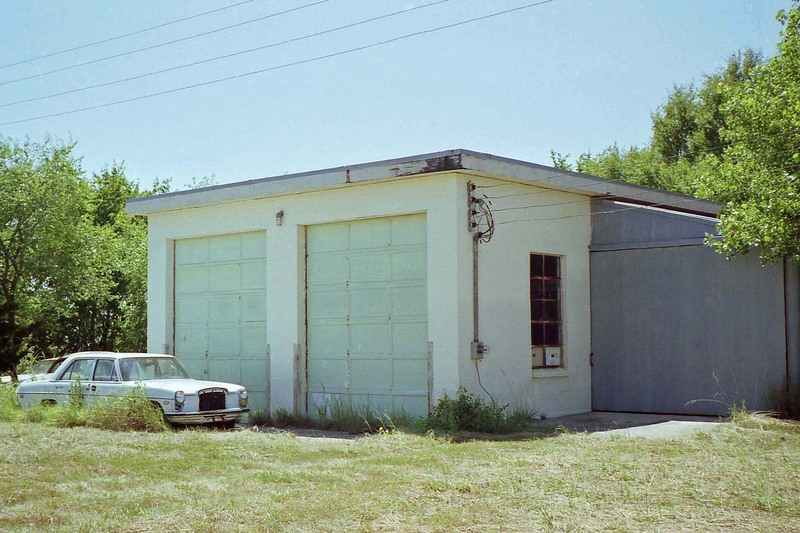 I was curious about data circuits for the Transceiver Control Station -- I stopped in and asked the old timers but none were familiar with the AF operation, or were aware of any special circuits running to the site. 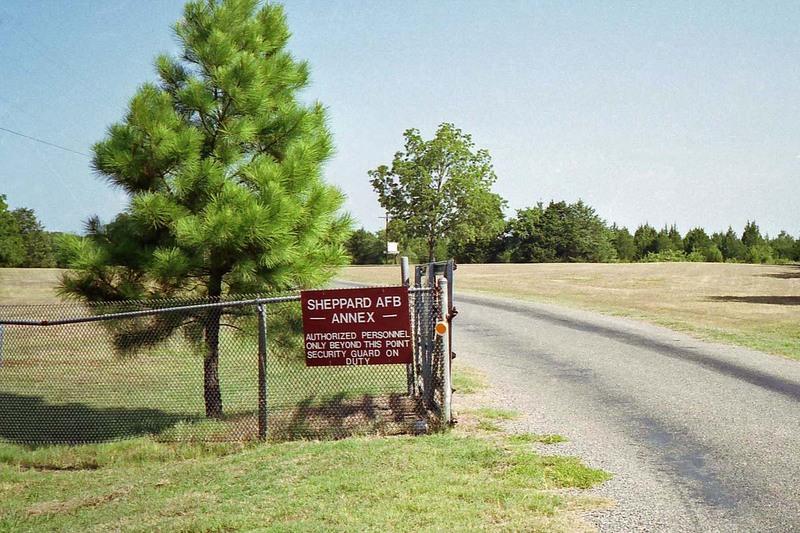 Just a couple miles away, I found the former site of Headquarters, Air Corps Technical Training Command (and later, home of 3rd District, Army Air Forces Technical Training Command), at 36-09-25, 95-59-32. It was at 20 East Archer Street, until it was discontinued on 7 Jul 1943. Presently, this office building is being renovated. Time to go home! I was able to get on the road early, so I made a full day of it. 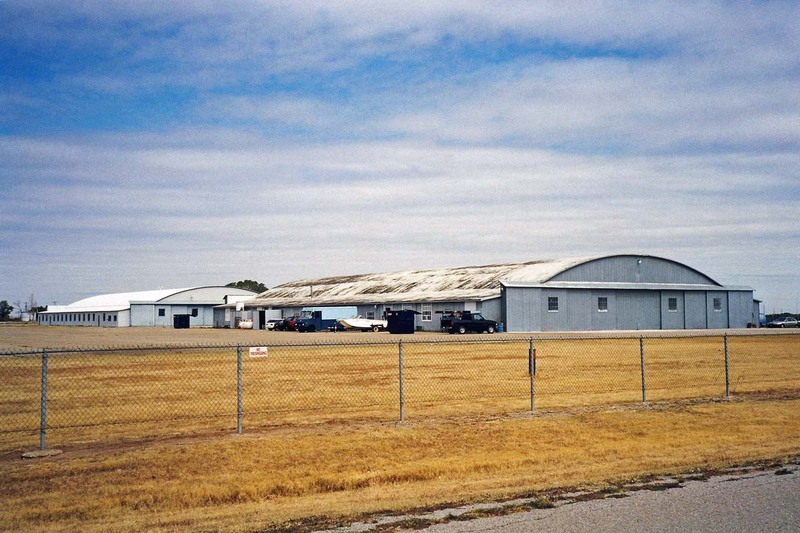 First stop, Ponca City Municipal Airport, home to an Army Air Forces contract flying school (British Flying Training School #6) during W.W.II. 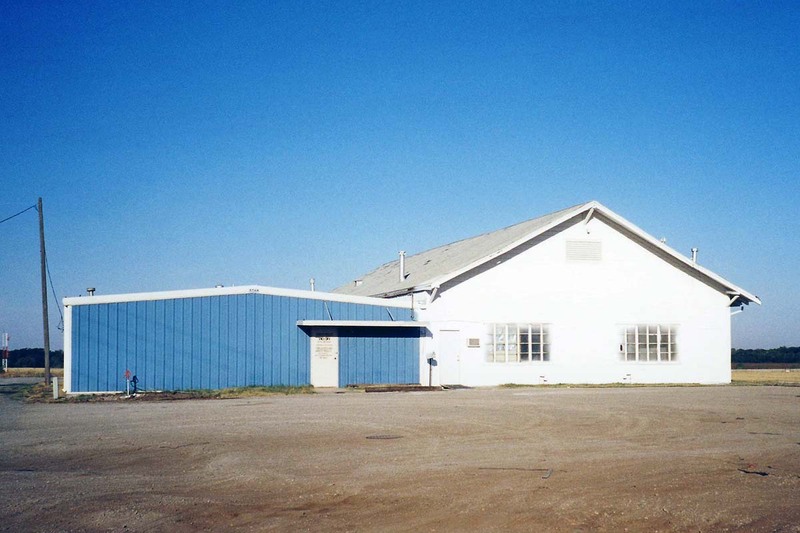 Darr School of Aeronautics operated the school. 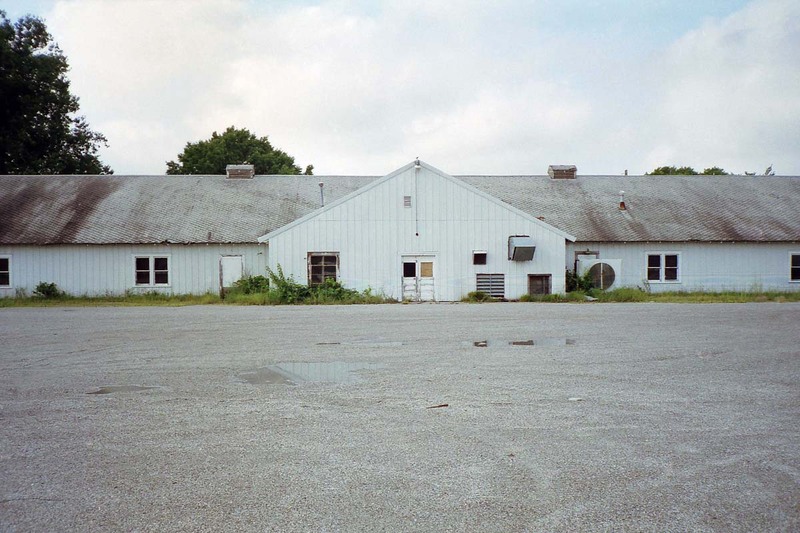 The former school area, at 36-44-10, 97-05-46, is now called Darr Industrial Park. 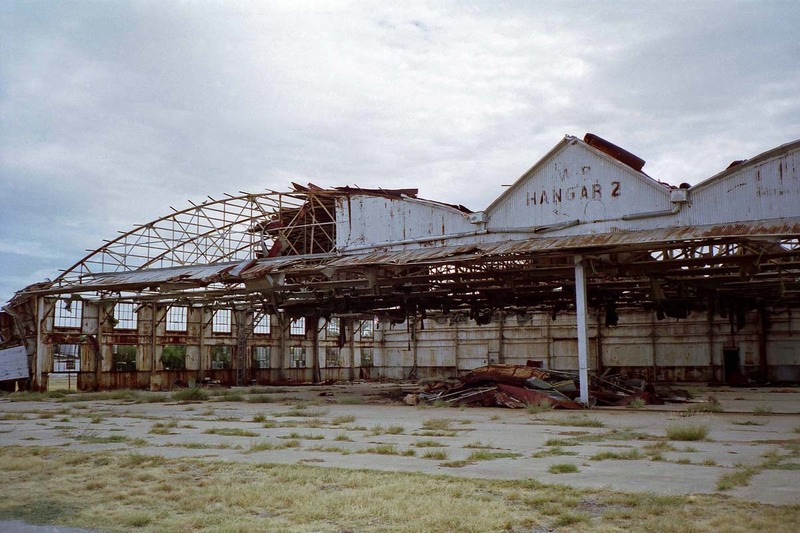 All three hangars are still standing, two heavily modified but one (number 3) fairly intact. 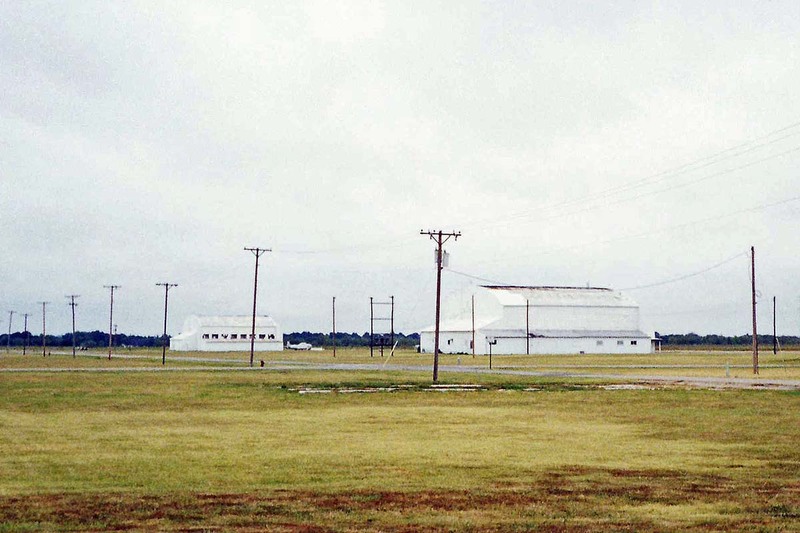 A TerraServer view from 1995 shows many of the W.W.II buildings still standing -- sadly, only the modified link trainer building remains today. 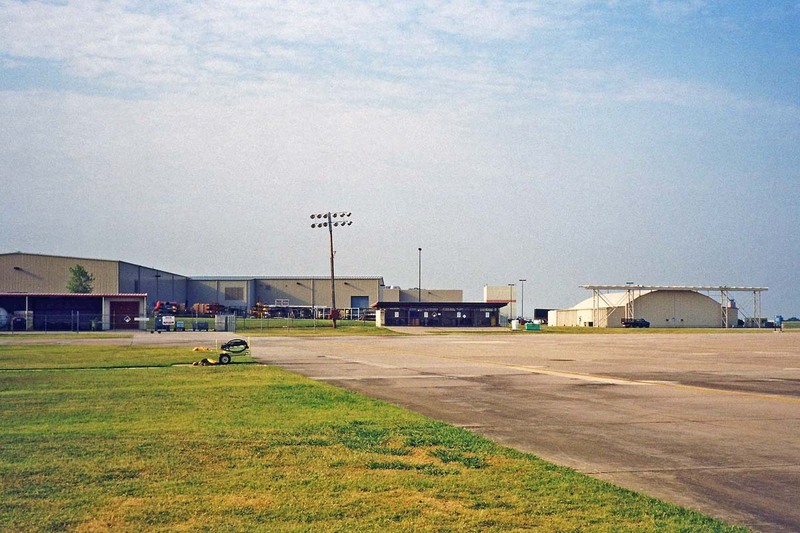 The airport is still in operation, FAA code PNC. 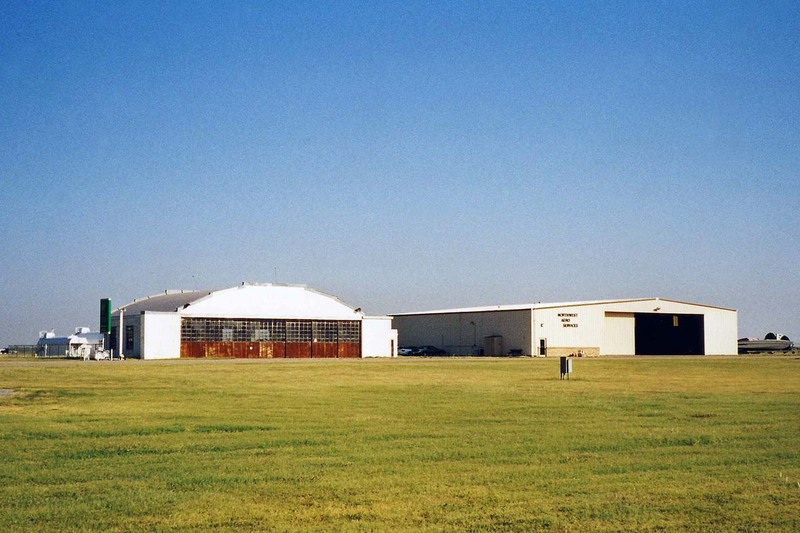 Next stop, Perry Municipal Airport (also called Noble Army Air Field), 36-22-30, 97-17. 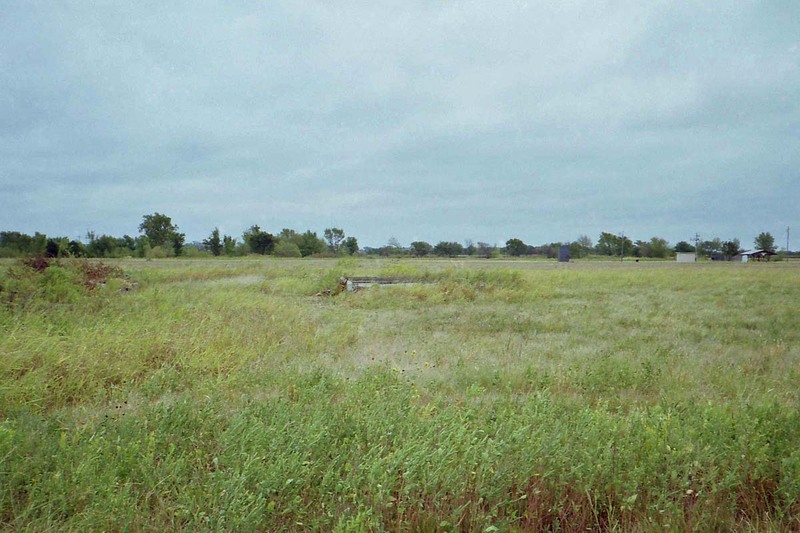 This was an auxiliary field during W.W.II, first to Will Rogers Field, then Enid AAFld. 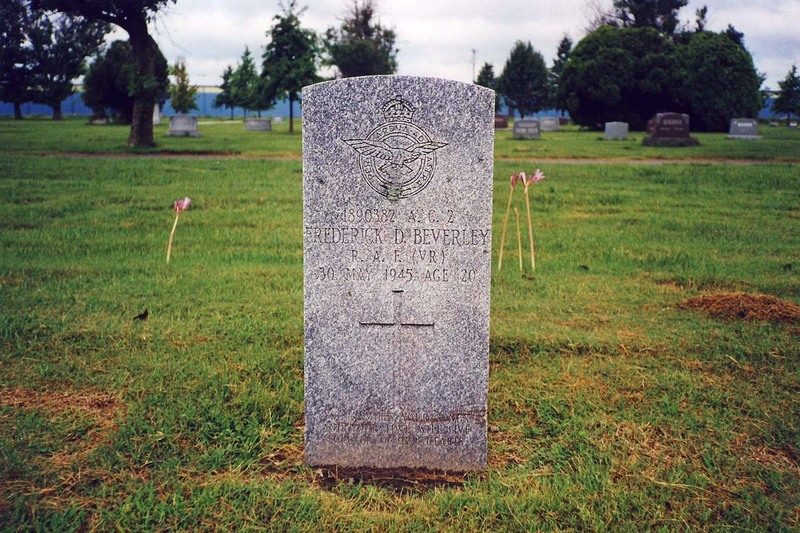 It was redesignated Perry AF Auxiliary Field, and served under Vance AFB in the 1950s. 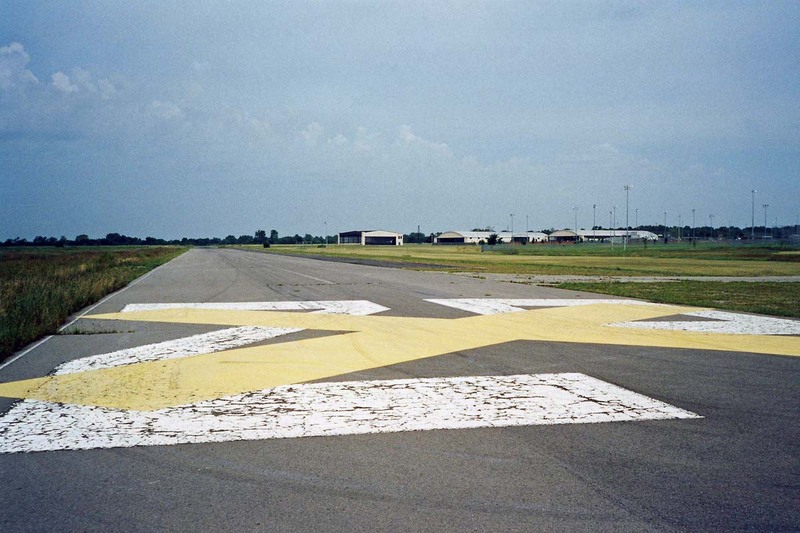 Still an active but quiet airport (FAA code F22), nothing remains from the W.W.II era except the runways. 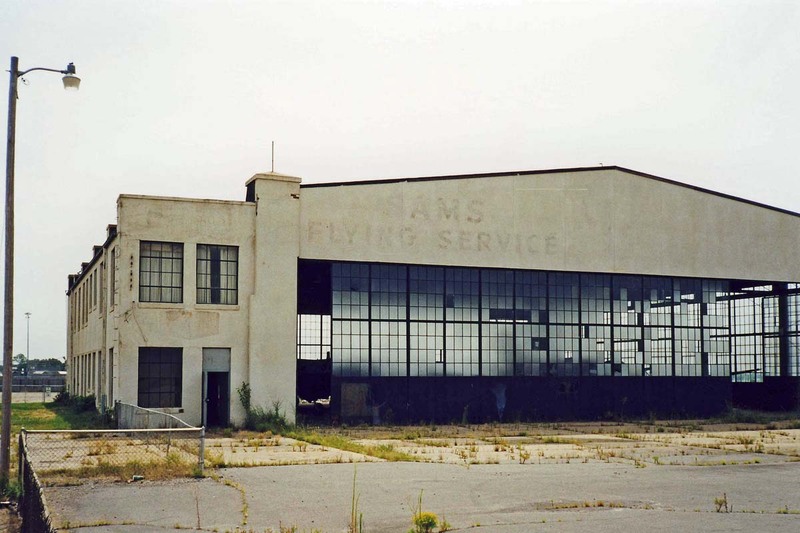 A gentleman with the FBO believed that a few metal buildings were all that stood during W.W.II, with all present buildings being built later. 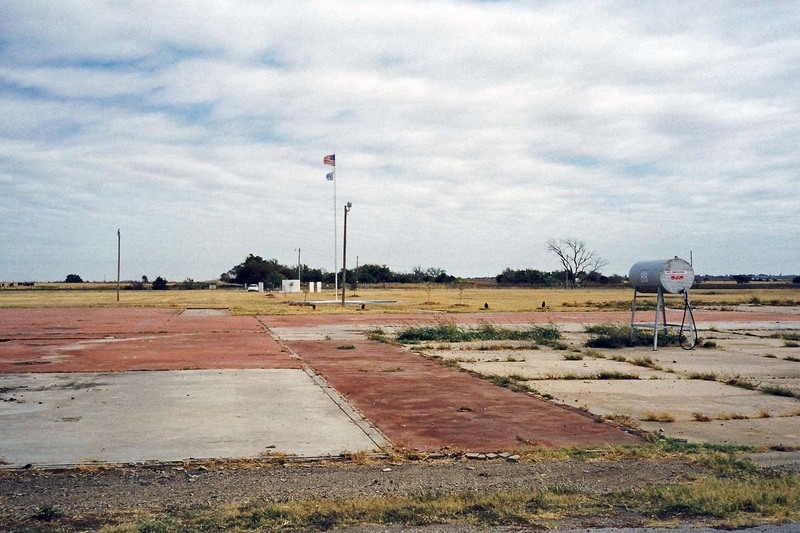 Woodring Municipal Airport (WDG) was formerly Woodring AF Auxiliary Field, 36-22-45, 97-47-30. 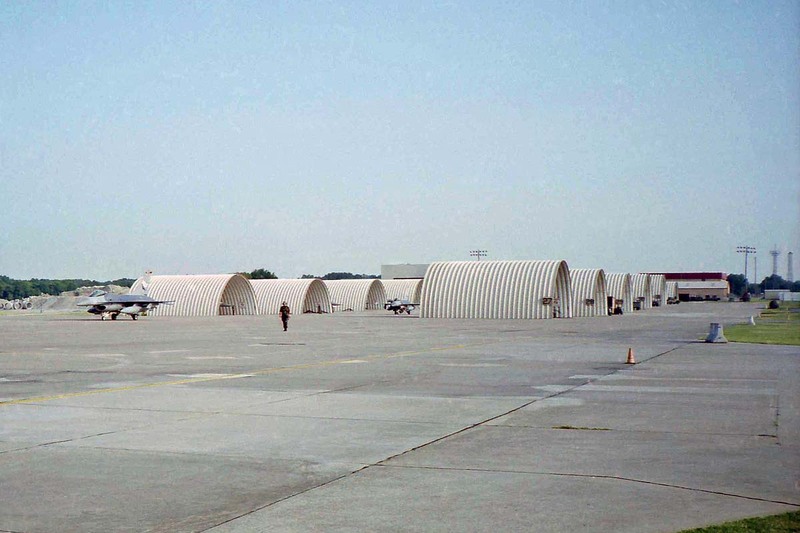 An F-4 pulls gate guard duty, and some hangars suggest a military connection. 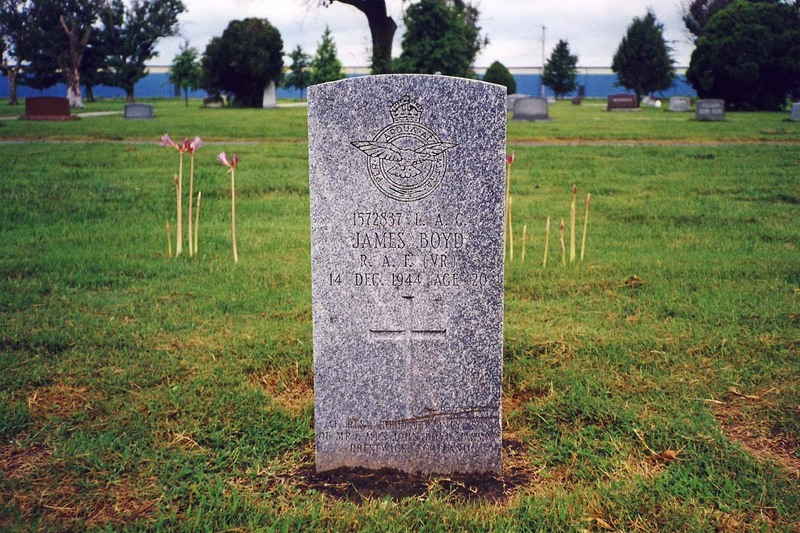 This was an auxiliary to Enid AAFld / Vance AFB during W.W.II and also during the Korean War era. A T-37 landed while I was at the airport, so I suspect there is still a joint use arrangement with nearby Vance AFB. 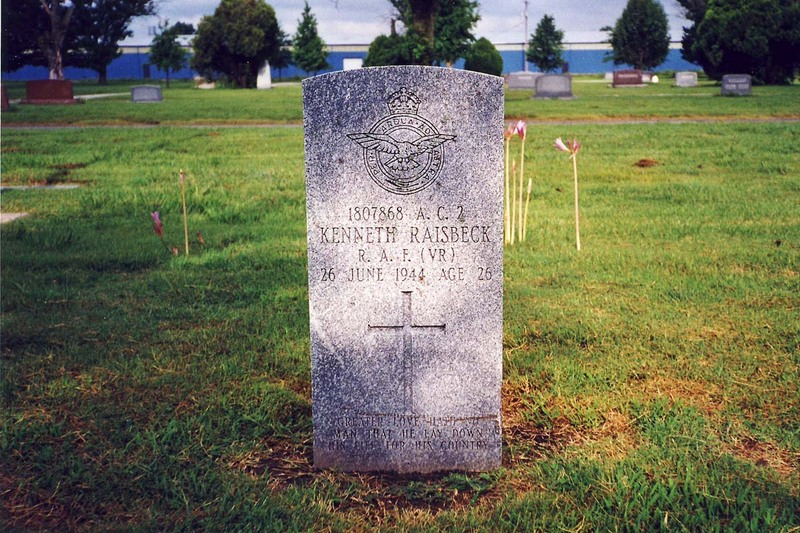 Vance AFB (XTLF) was my next stop. 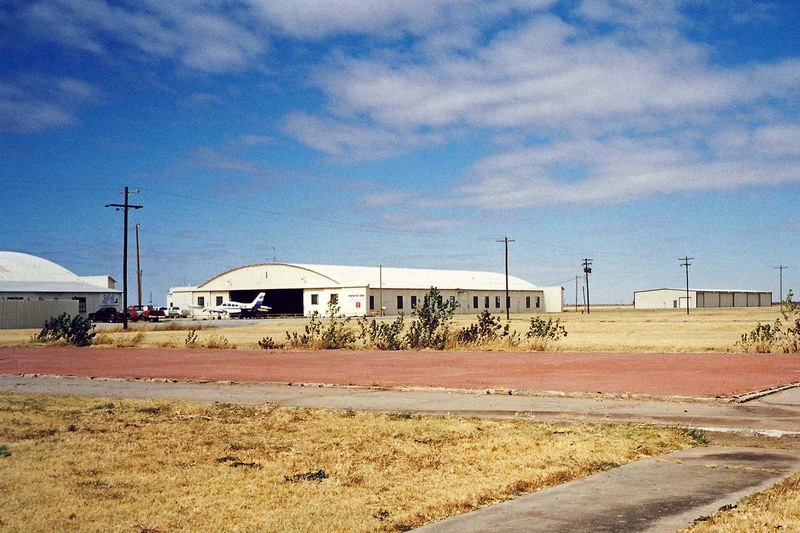 A W.W.II flying school, first known as Air Corps Basic Flying School, Enid, then Enid AAFld. 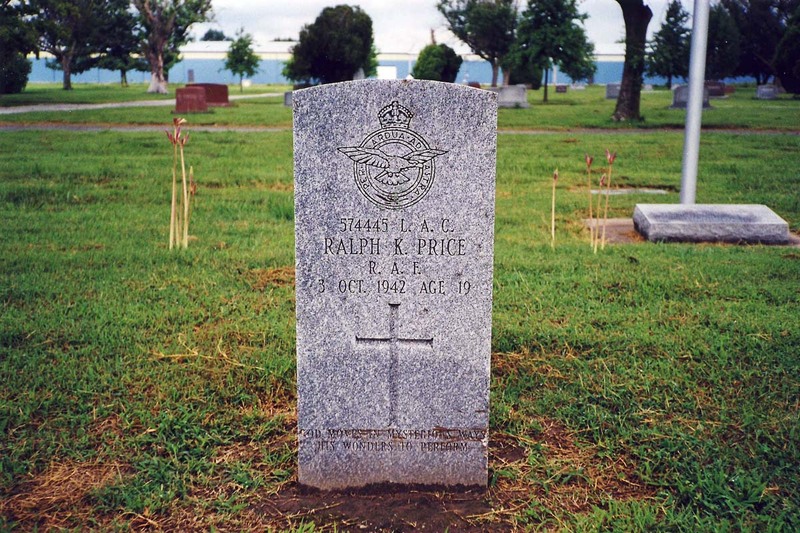 It was inactivated on 31 Jan 1947, redesignated Enid AFB on 13 Jan 1948, and reactivated on 1 Aug 1948. 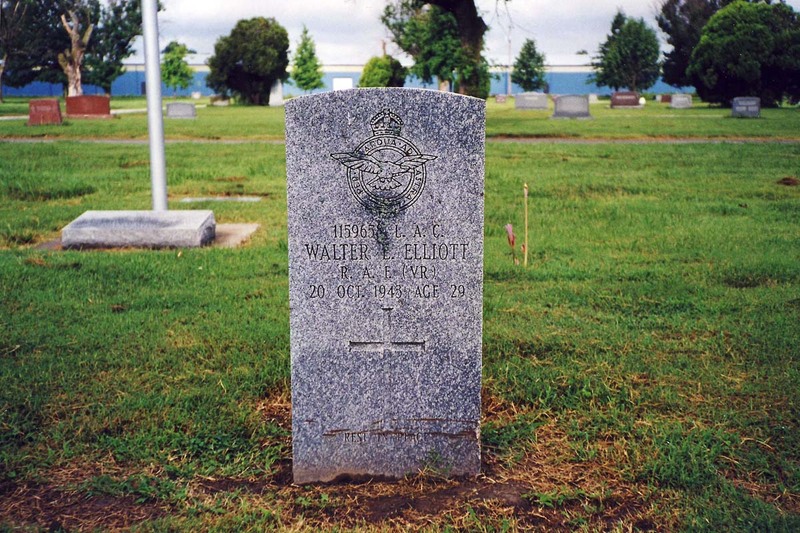 It was redesignated Vance AFB on 9 Jul 1949. 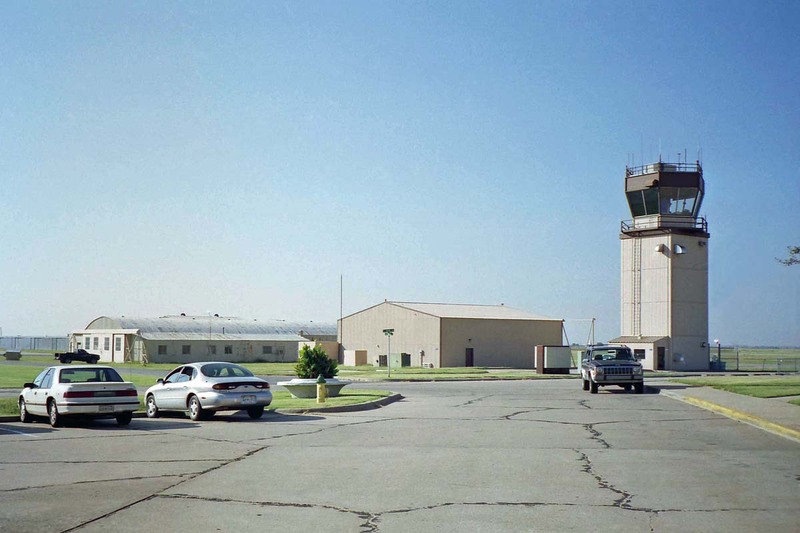 It is still an active pilot training base under Air Education and Training Command, and is notable for being largely a contractor-operated base. Plenty of T-37s, like this one on display, were screeching overhead. Vance has had two middle marker annexes over the years. 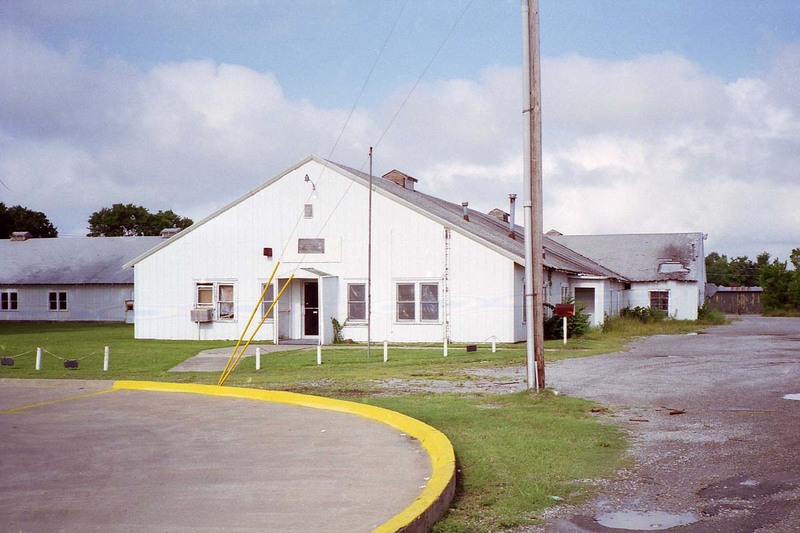 Vance ILS Middle Marker Annex #1 was assigned on 31 Oct 1956, and was incorporated into the base on 26 May 1971. 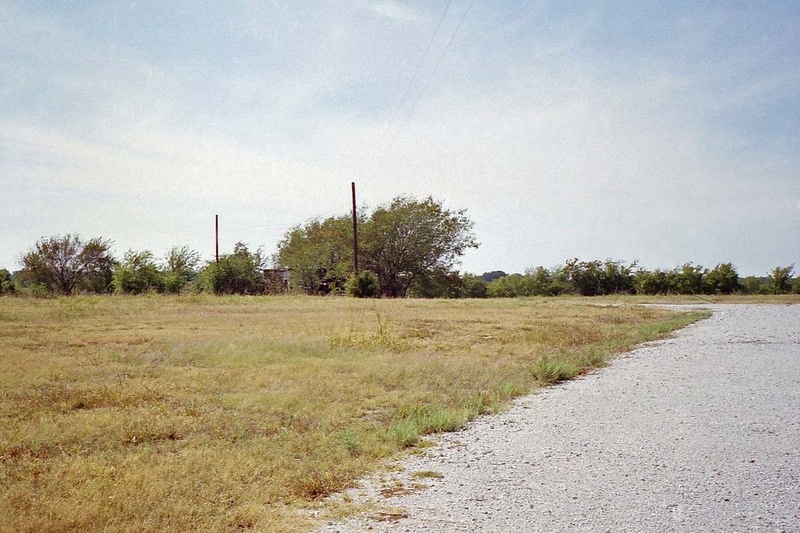 Nothing is visible of this former site, at 36-19-10, 97-55-24. 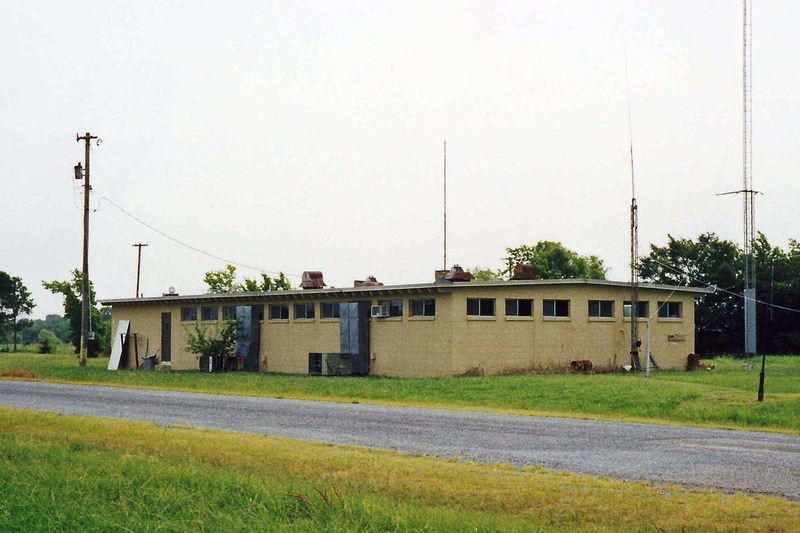 Vance ILS Middle Marker Annex #2 (XTLN) was also assigned in the 1950s, and is still active. 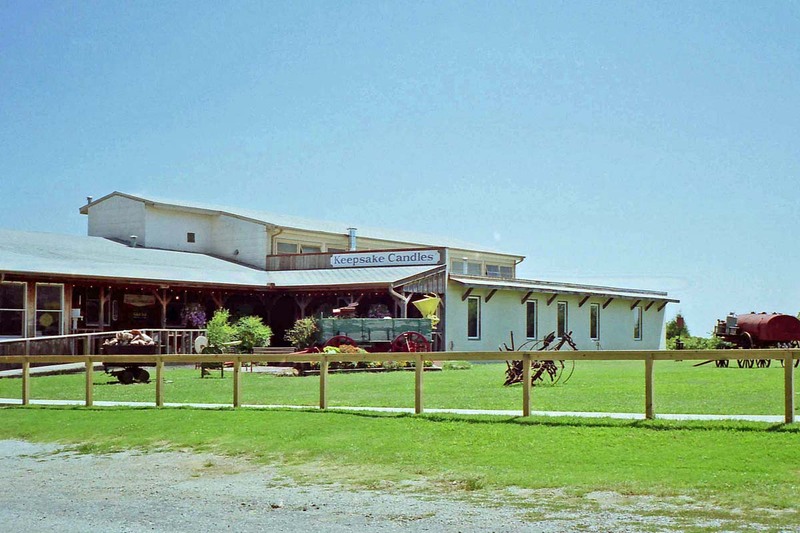 It is visible from nearby roads. 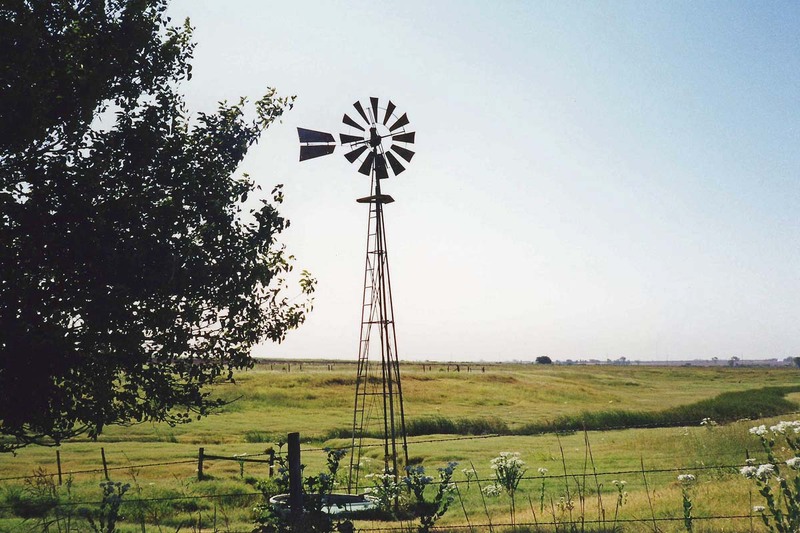 I saw this quaint windmill near the middle markers. 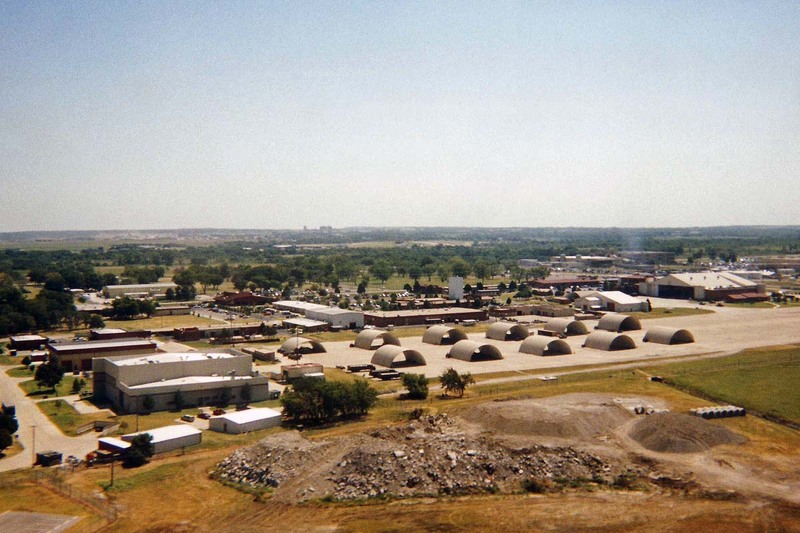 After the "Sleepy Hollow" atmosphere of Vance, the crowded layout and confusing streets of Tinker AFB (WWYK) were a bit of a shock! 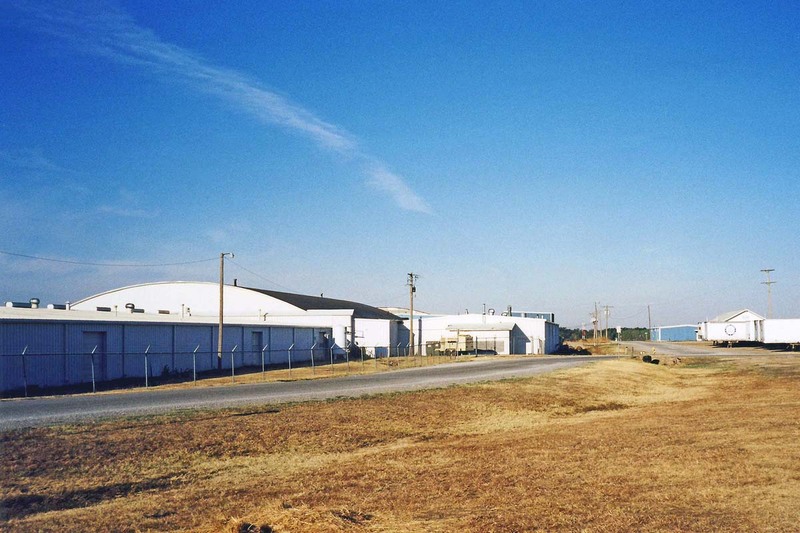 Located at 35-25, 97-24, Tinker is a busy base, home to depot maintenance and AWACS, among other missions. Saw this nice EC-121 on display. 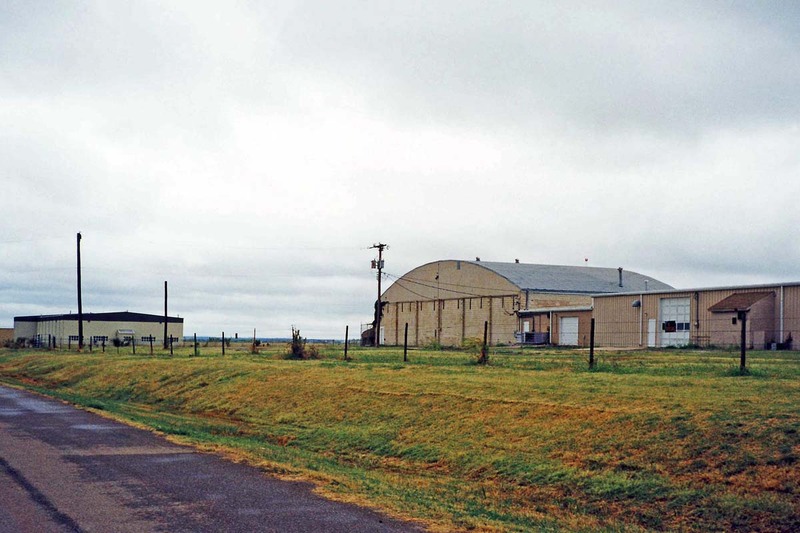 Barely a mile away from the base boundary, Oklahoma City Air Force Station (2253, SHCZ) still serves as a general support annex of Tinker AFB. 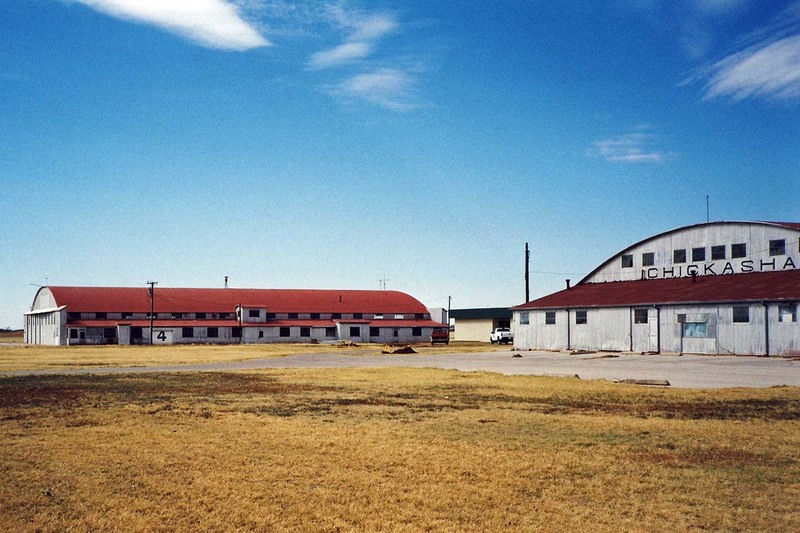 It is now home to the 38th Engineering Installation Wing, among other units. 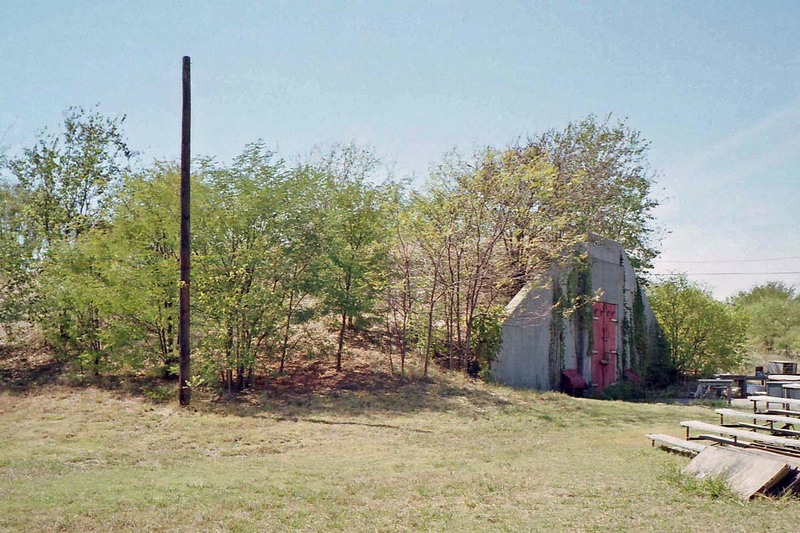 This was originally an Aircraft Warning and Control radar site, from about 1956 to 1970. 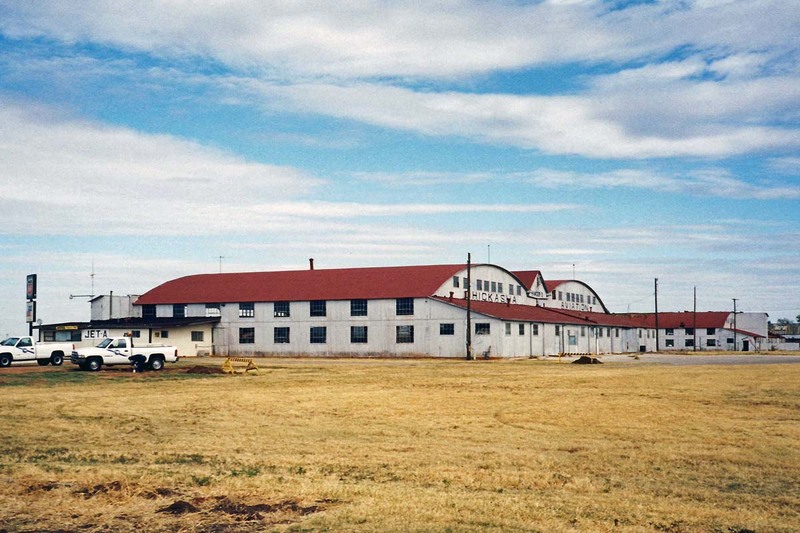 Some of the old 1950s barracks remain in use by various units. 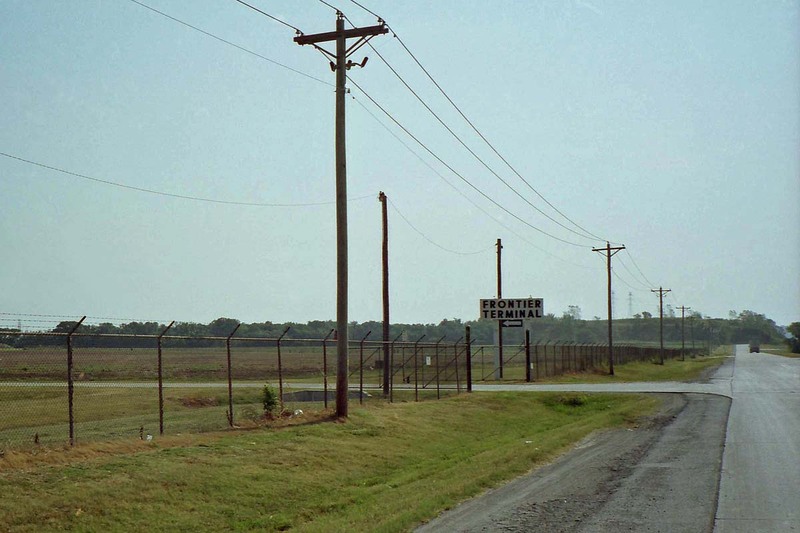 North of Tinker, just across I-40, a VORTAC facility is visible from the highway. 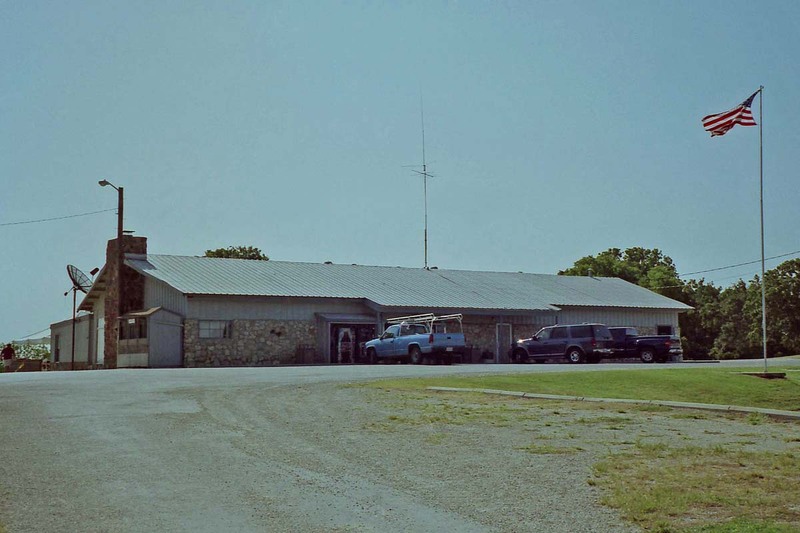 I identified this as a USAF facility from the AirNav web site, at 35-26-11, 97-22-46. Getting a closer look, I found it to be on a larger installation, which I am tentatively identifying as Tinker Training Annex (SHDF). The sign identifies it as Glenwood Training Annex, but I have not yet found this designation in any official documents (it may be a recent change, or informal usage). 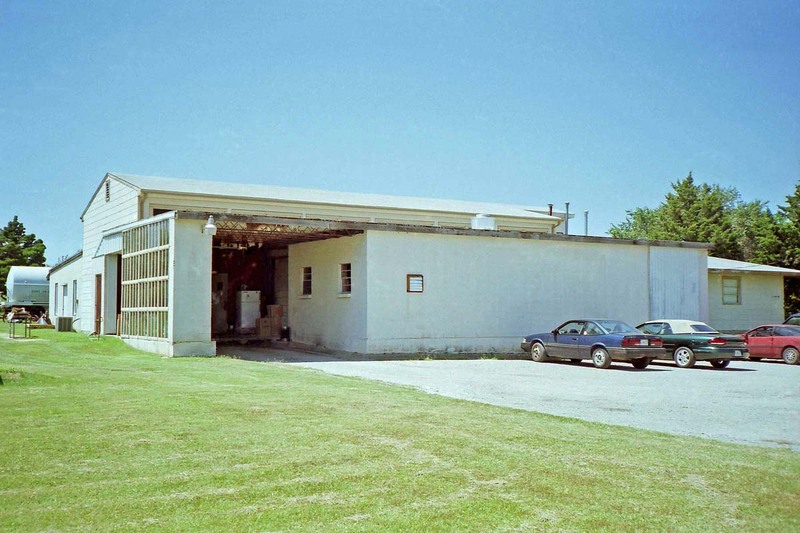 This property was originally designated Oklahoma City Transmitter Annex, then Oklahoma City Communications Facility Annex, and on 1 Jul 1969 it was redesignated Tinker Training Annex. 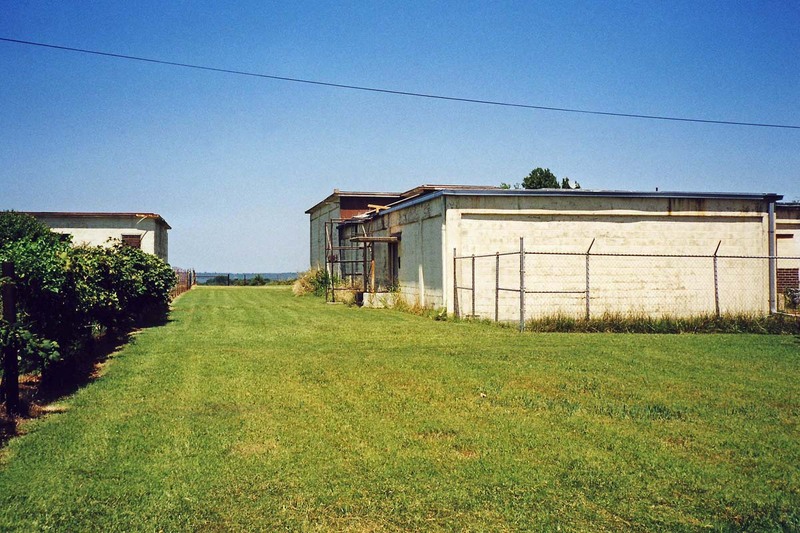 The perimeter fence cuts across roadways, and it looks like much of the annex was once a housing subdivision. I'm guessing this area was razed as a noise abatement project, as this area is very close to the north end of the main runway. 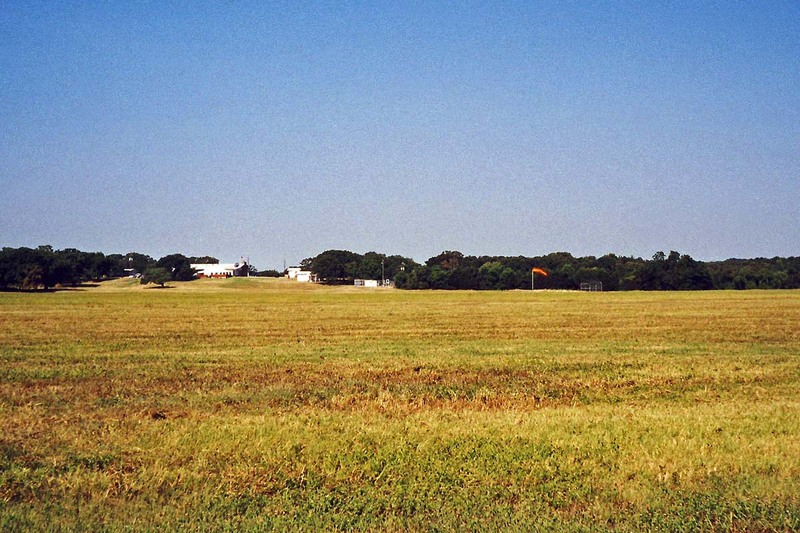 The ILS middle marker beacon for runway 17 is also on this property, though I could not see it from the road. I saw another piece of property I have not yet identified. 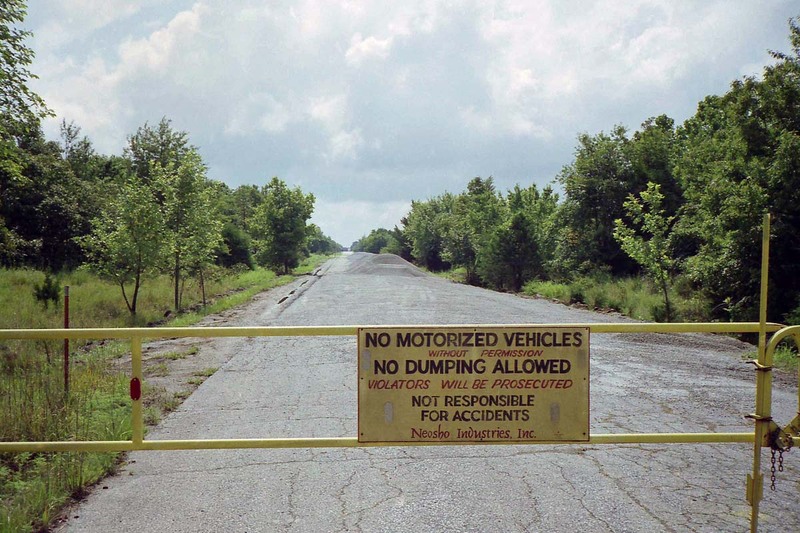 It is just east of Tinker, and lies between Oklahoma City AFS and I-40. 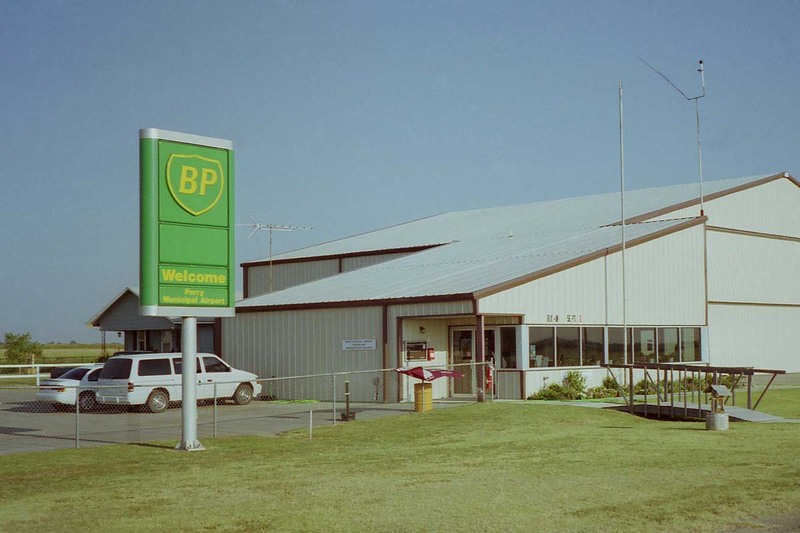 The sign identifies the facility as Consolidated Fuels. 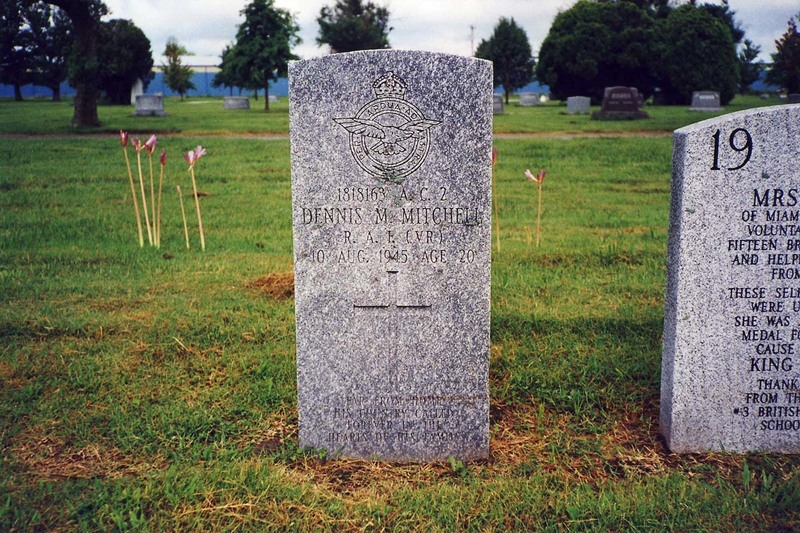 More research is needed to see if this is carried as part of Tinker AFB proper, or as a separate annex. 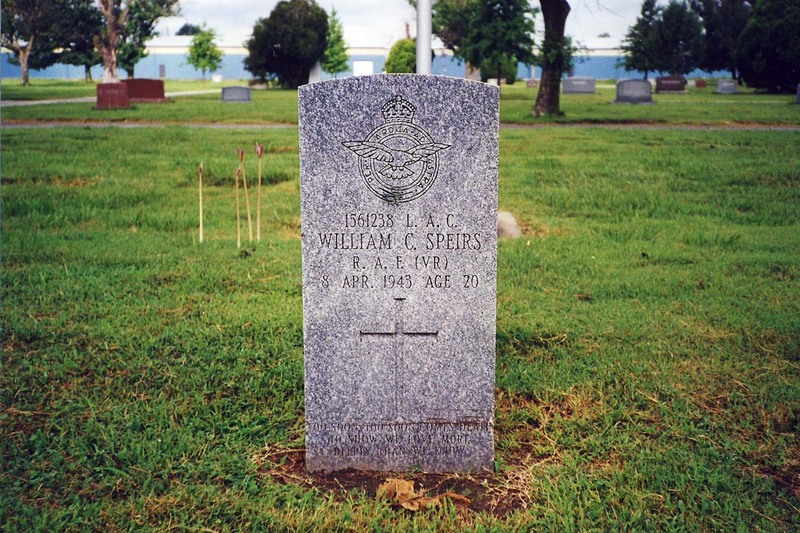 Spartan did more in Tulsa than just train pilots for the Army Air Forces. 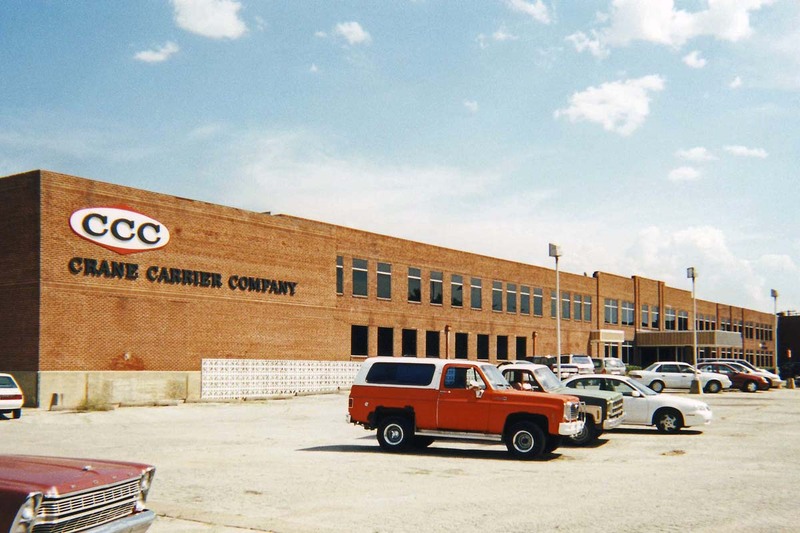 A short distance south of their training facilities, at 36-10-57, 95-54-12 the former Spartan factory is now used by Crane Carrier Company. 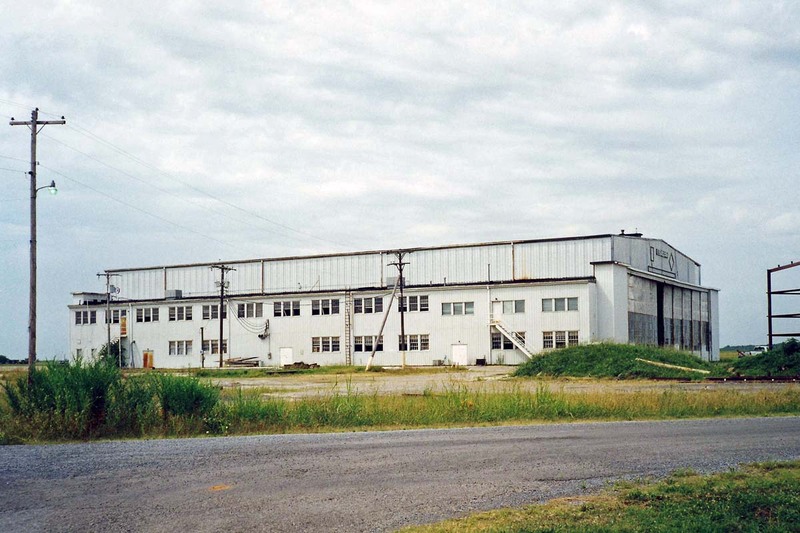 Spartan produced civil aircraft here, and during W.W.II they produced parts for military aircraft. 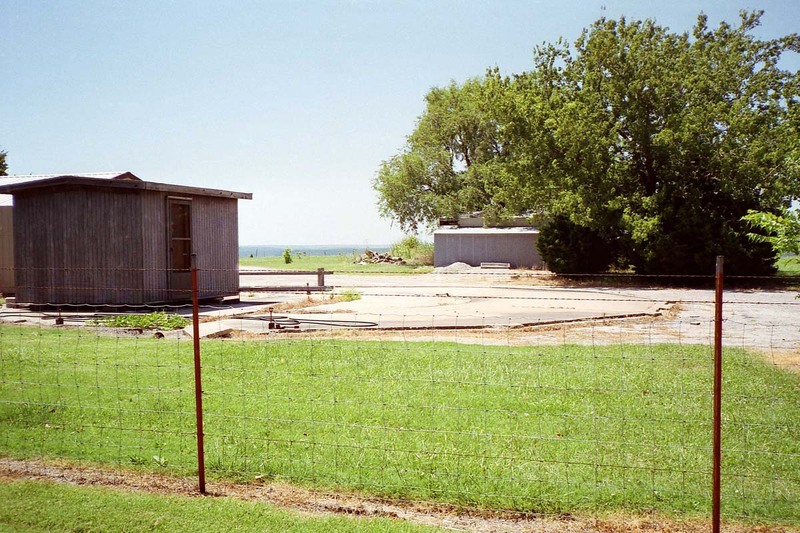 Also on the former Spartan complex sits the "bombproof house" built for Spartan head J. Paul Getty. 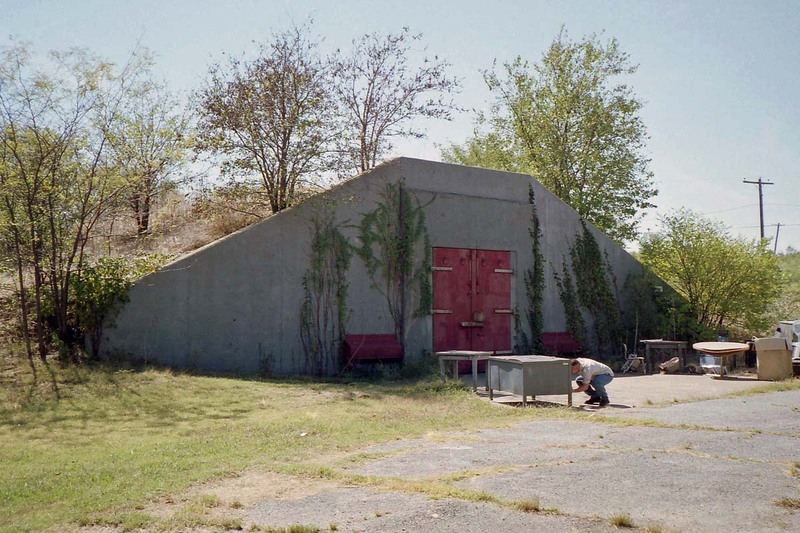 It is reported to have 18" reinforced concrete walls, although from the outside it appears to be a simple cinder block structure. 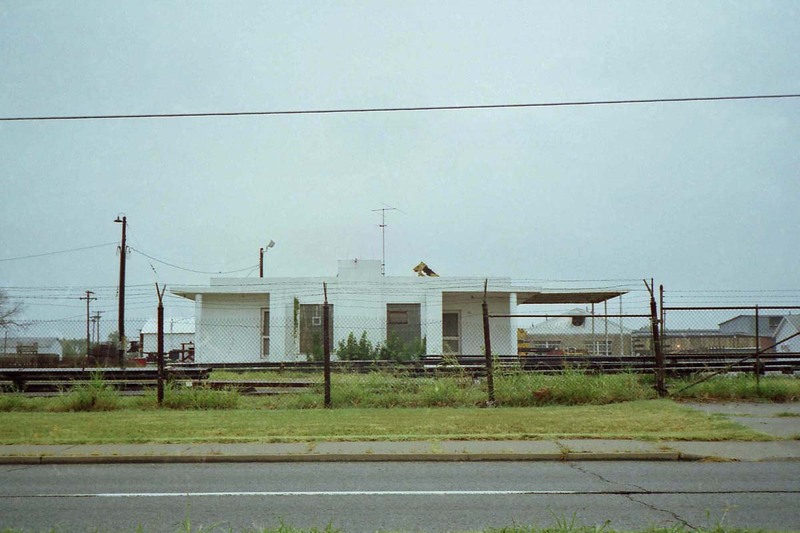 It still stands, in a storage yard, at 36-11-03, 95-54-03. Multiple sources also suggest this house had an access tunnel leading to the factory. I did not attempt to confirm the tunnel or the wall thickness. 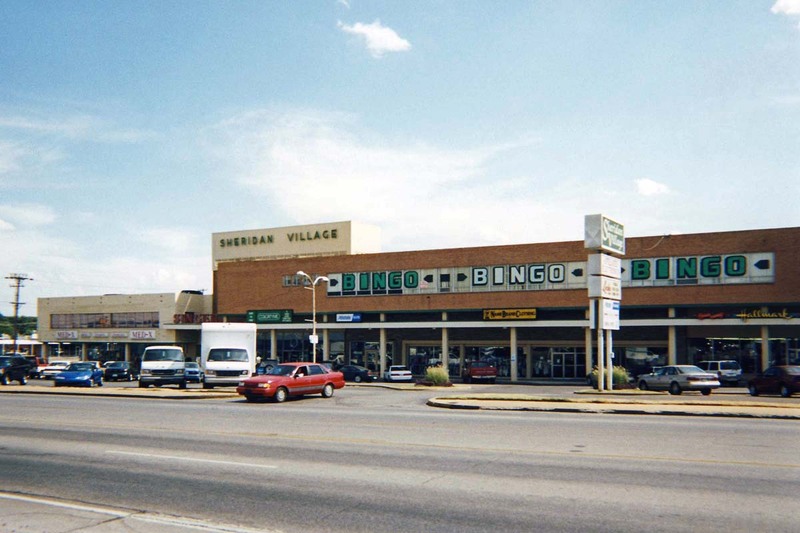 The Sheridan Village Shopping Center (suite 201) was home to the Tulsa Air Reserve Center from 1959 to 1962. 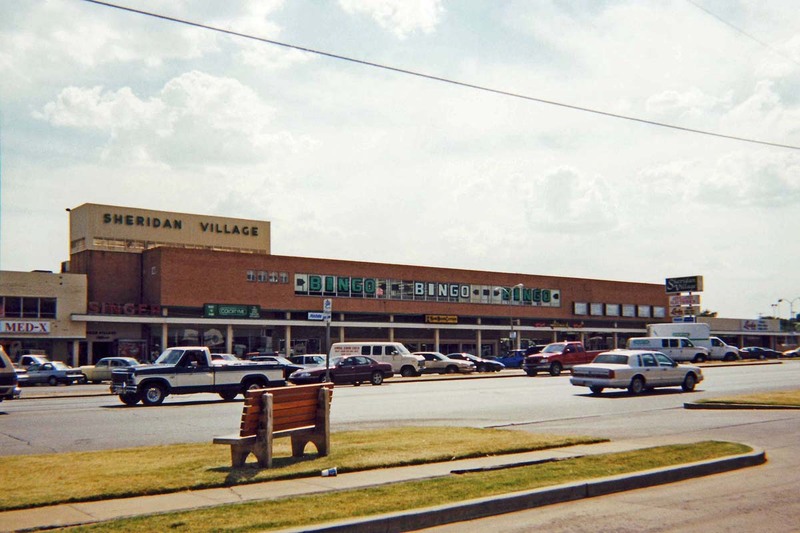 The shopping center is still operational, 36-09-37, 95-54-20. 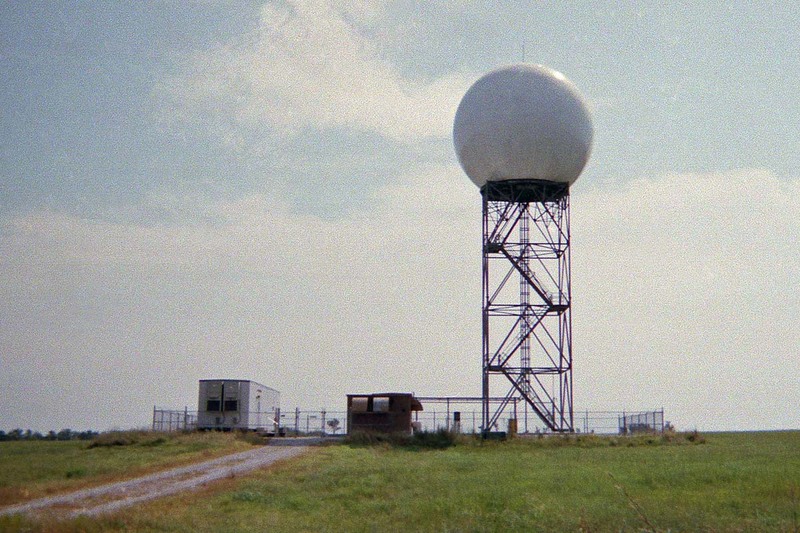 A few miles east of town, at 36-10-30, 95-33-53, the Tulsa NEXRAD Site is a NOAA-operated facility. 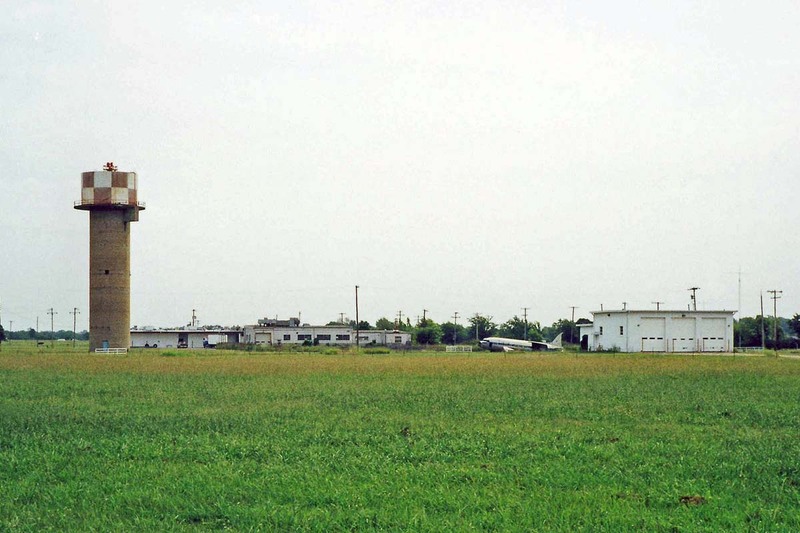 With the exception of signage it looks like any of the USAF operated NEXRAD facilities. 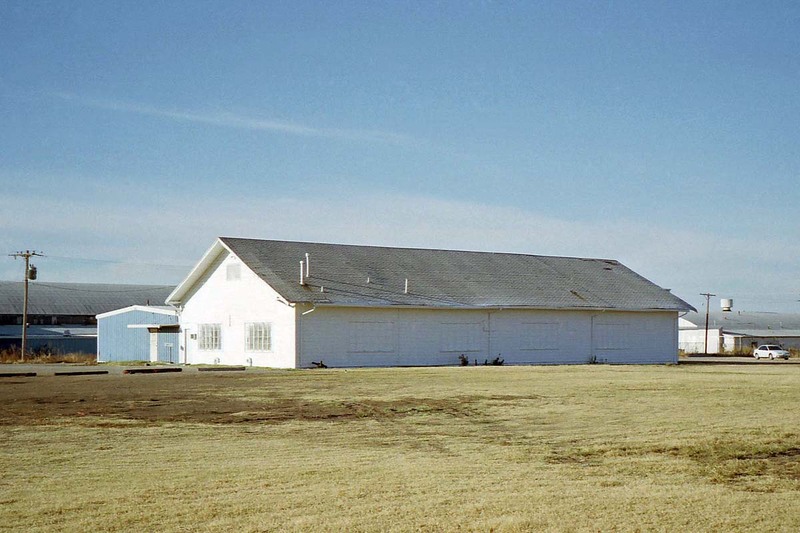 About an hour west of Tulsa, the former Cushing AAFld still serves as Cushing Municipal Airport (CUH), at 35-57, 96-46-30. 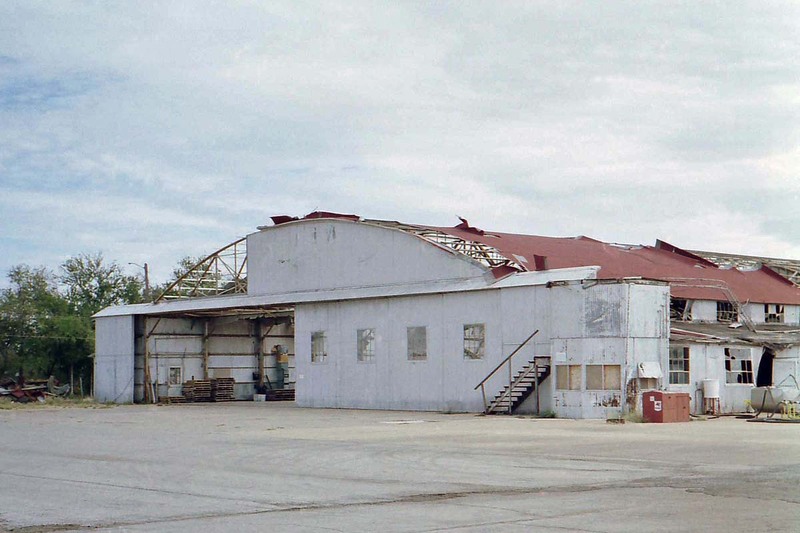 One hangar remains that the FBO believes dates from W.W.II; the present FBO office was added some time later. At the time of my visit it was 109 degrees Fahrenheit! 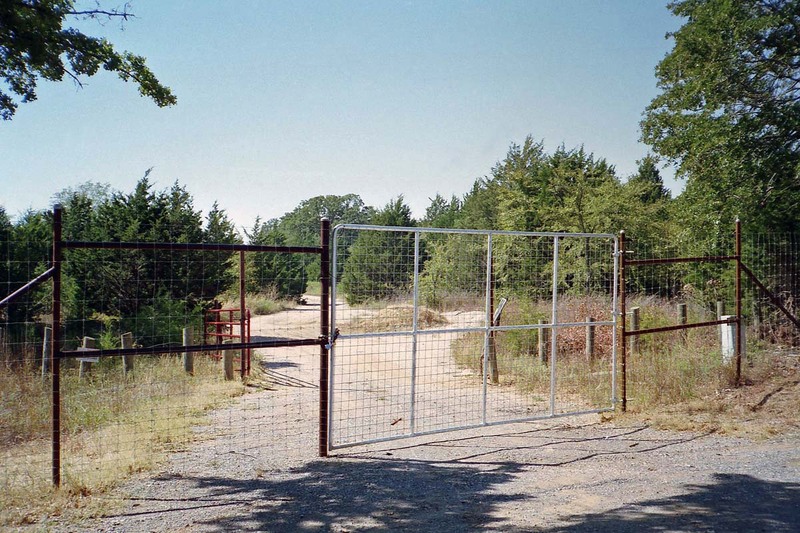 Thanks to GSA disposal documents at NARA-SW Region, I found the location of Perrin Radio Range Annex, OK. I have driven past it several times without realizing it (I've been trying to pinpoint this site for years). 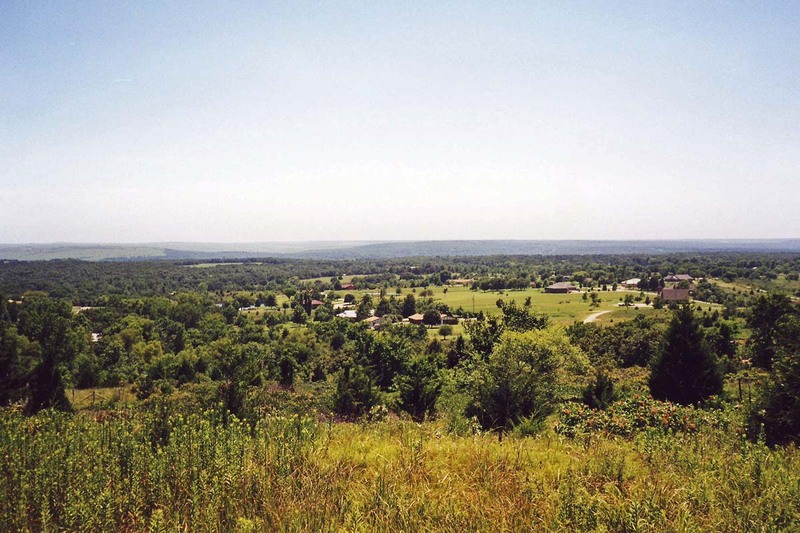 It is on the west side of US Highway 75, 33-53-05, 96-29-35, 2 miles north of Colbert. 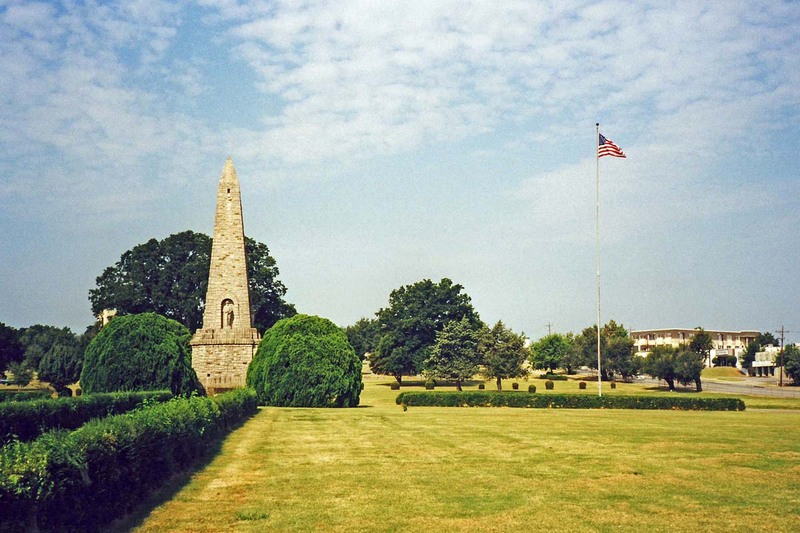 This NAVAID served Perrin Field during W.W.II, and was disposed in 1944. While looking around on the part of Tulsa IAP used by the Army Air Forces in W.W.II as Tulsa AAFld, I was surprised to find fairly new USAF signs on the fence surrounding this building. The signs were the Nov 81 edition. 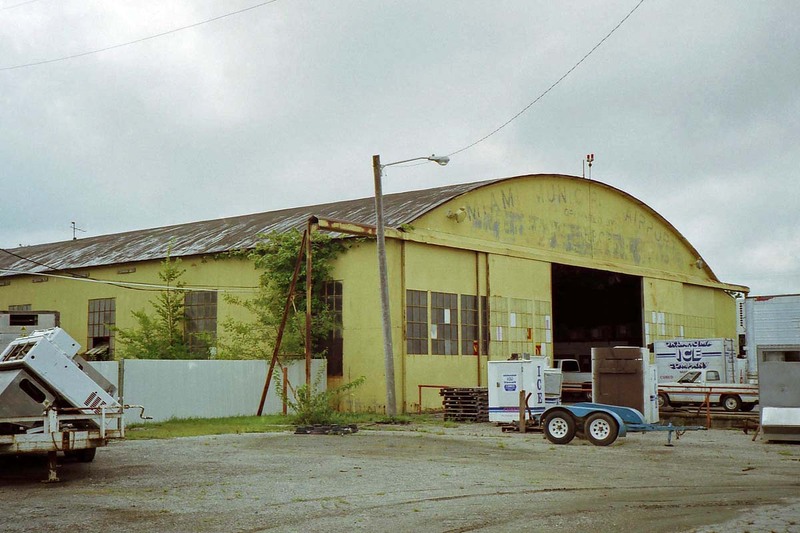 Located at 36-12-02, 95-54-13, this area is now used for storage by an aviation business. 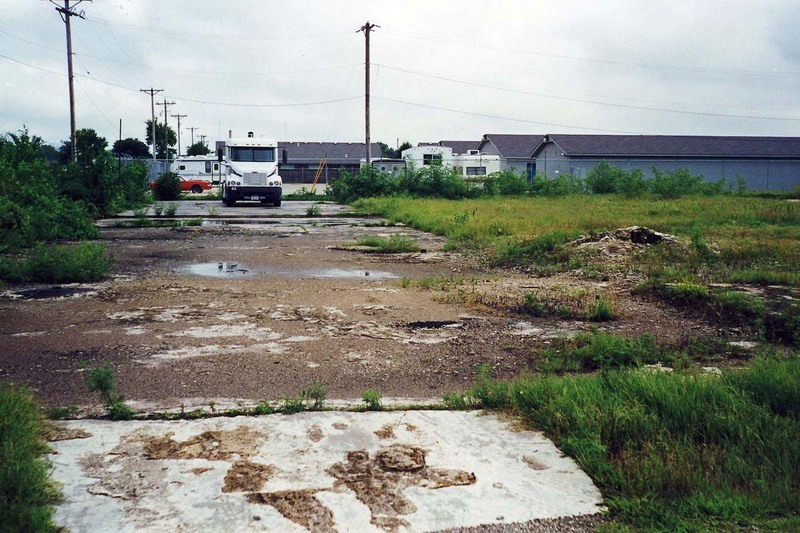 Further investigation showed this to be the original site of the Air National Guard unit, prior to their current base (built circa. 1960). 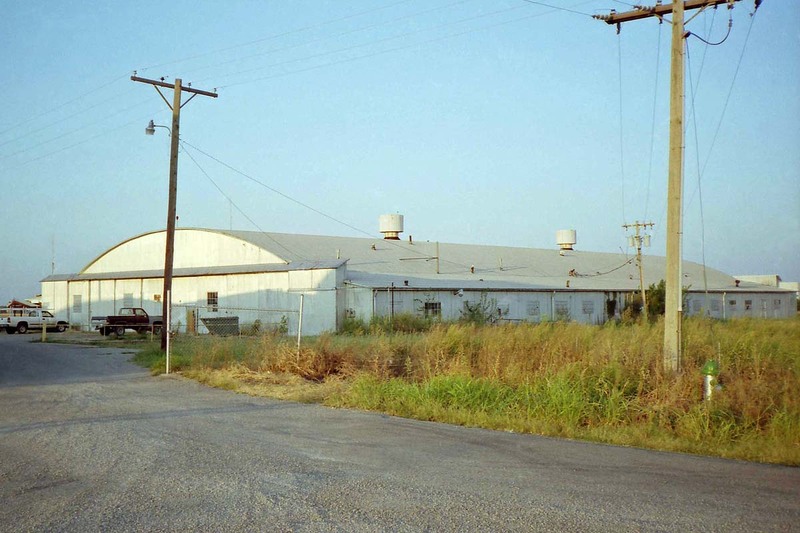 The ANG continued to lease some of the land and buildings until approximately 1995. 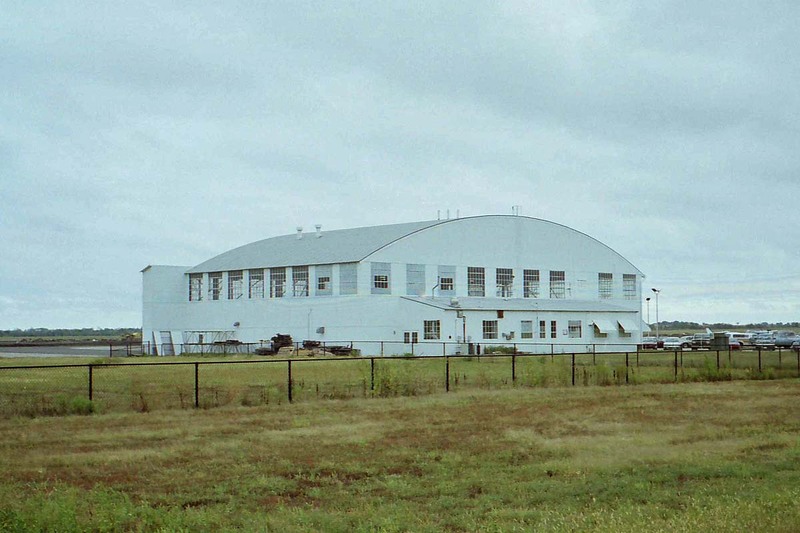 This hangar, to the west of the airport terminal, was part of the AAF facility in W.W.II, as was this one, and this one. 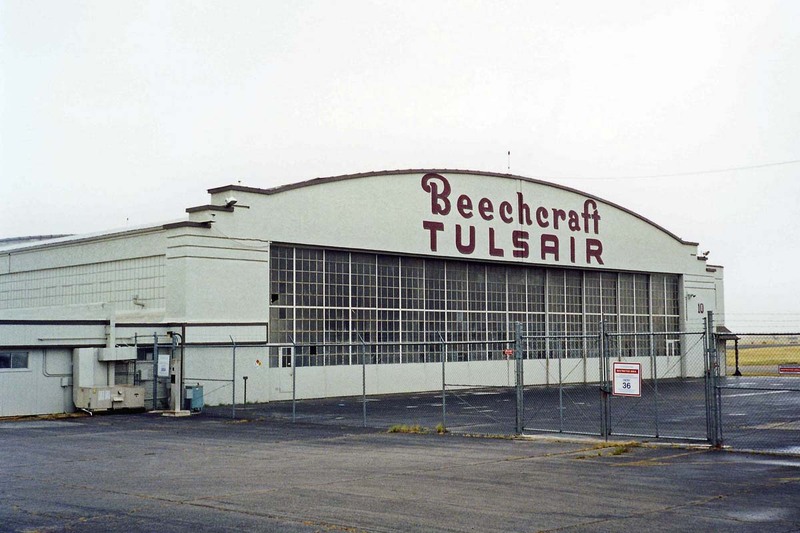 Beechcraft uses much of this property today, along with several other aviation concerns. 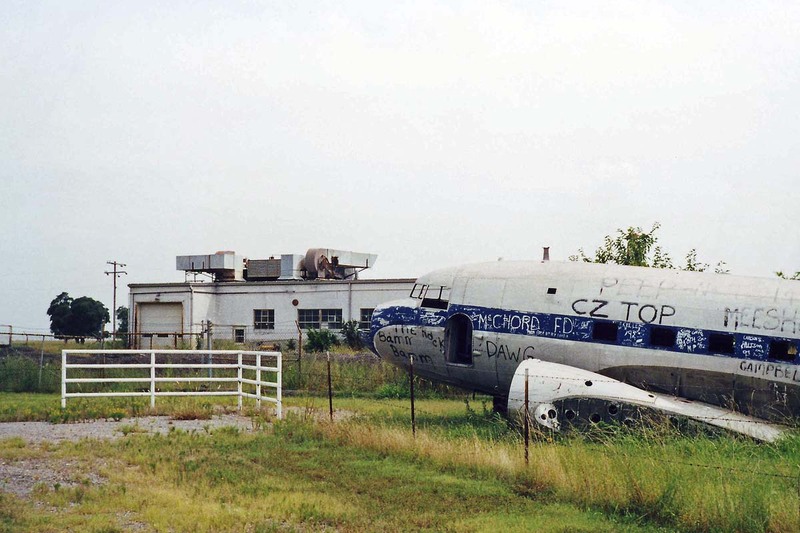 I tracked down the location of the former Tulsa Commercial Airport, 36-03, 95-54. W.W.II airfield directories list it as having Army use. It is now a residential area. I saw no remnants of airport use. Heading out of Tulsa to the west, I went to Stillwater. 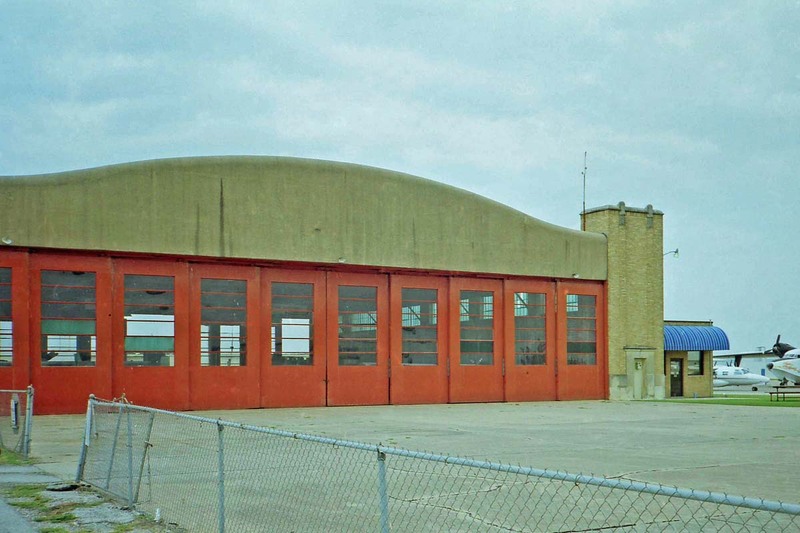 The former Stillwater NAS, 36-08-45, 97-04-45, is now their municipal airport (SWO). 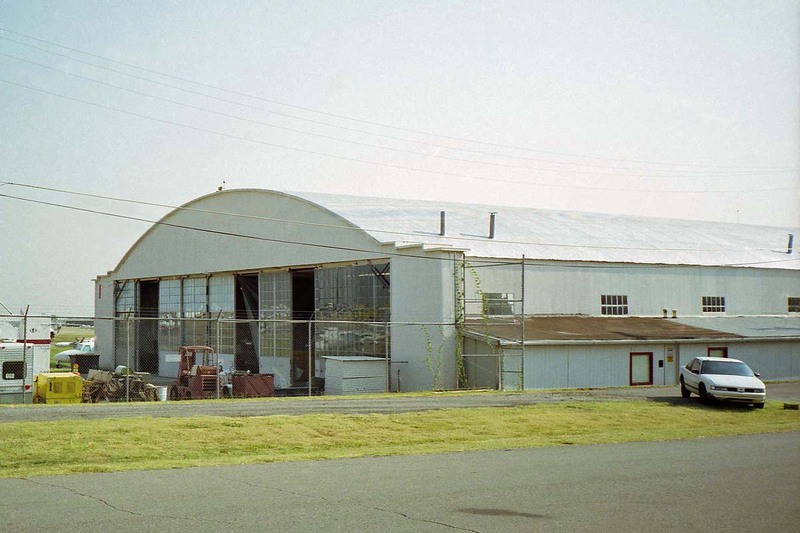 A few W.W.II era buildings remain, such as these hangars. The wind tetrahedron is lighted, for night use. 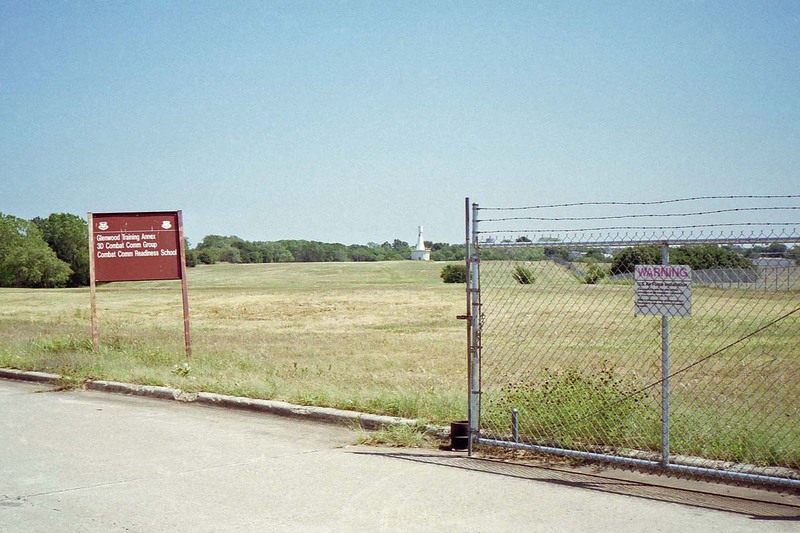 This airfield was briefly owned by the Army Air Forces immediately after W.W.II. 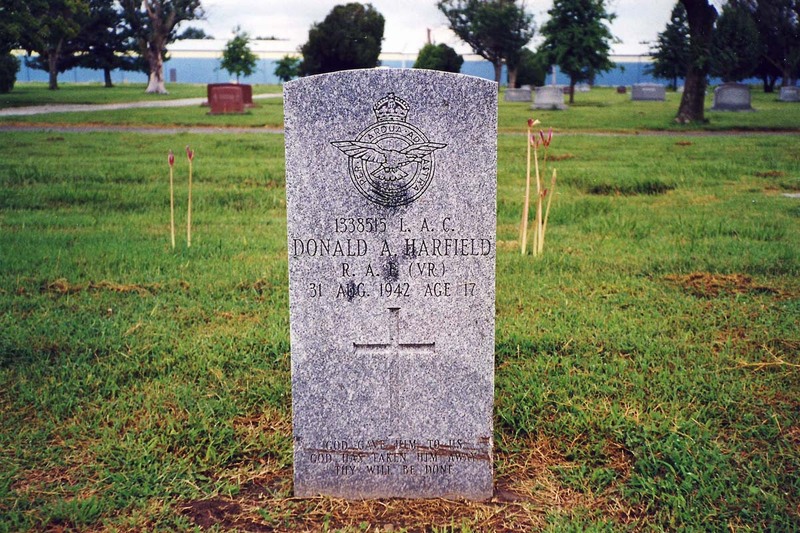 It was acquired with the intention of being an auxiliary field to Enid AAFld, but it was never activated as such. I started my return trip by heading north into Kansas. First stop, the former Coffeyville AAFld, 37-06, 95-34. 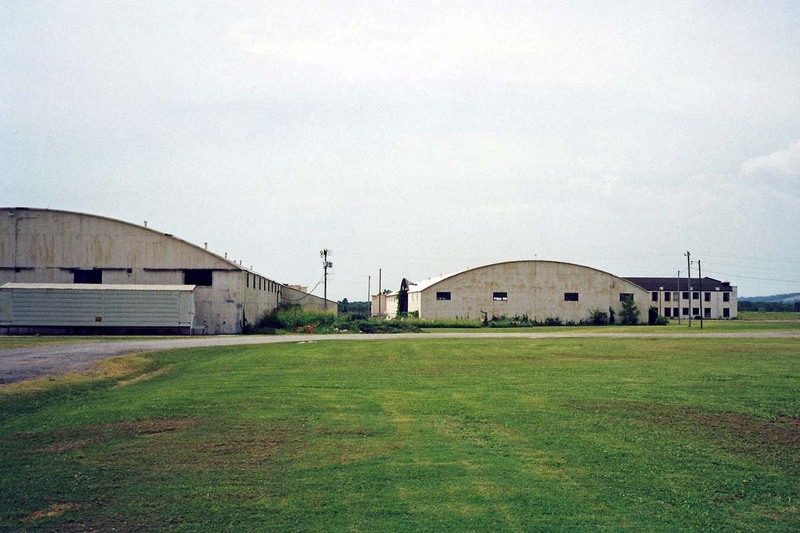 Now, it is an industrial park and the Coffeyville Municipal Airport (CFV). 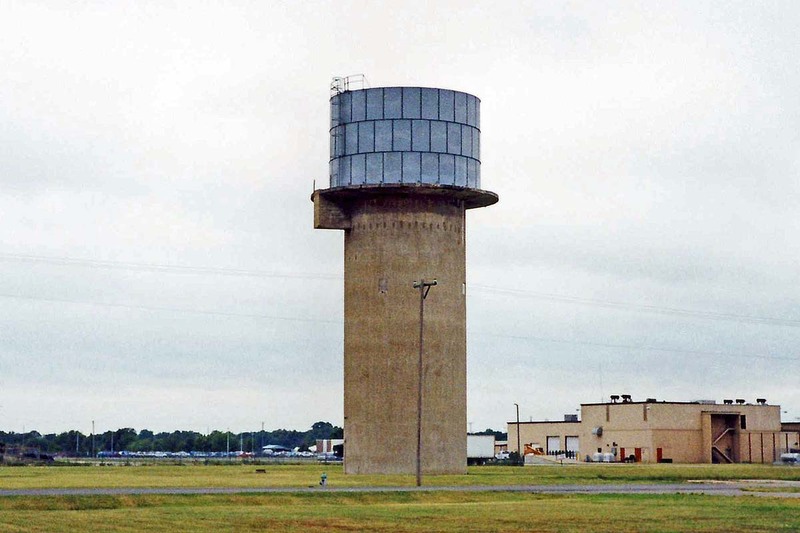 The concrete water tower from W.W.II still stands, as does this building, some buildings and foundations, and several hangars. 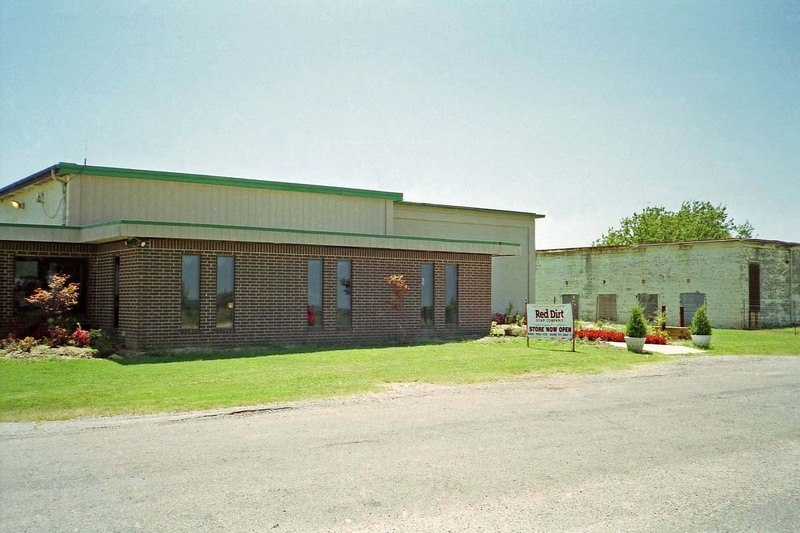 Only about 12 miles to the west, I stopped at the former Independence AAFld, 37-09-30, 95-46-30. 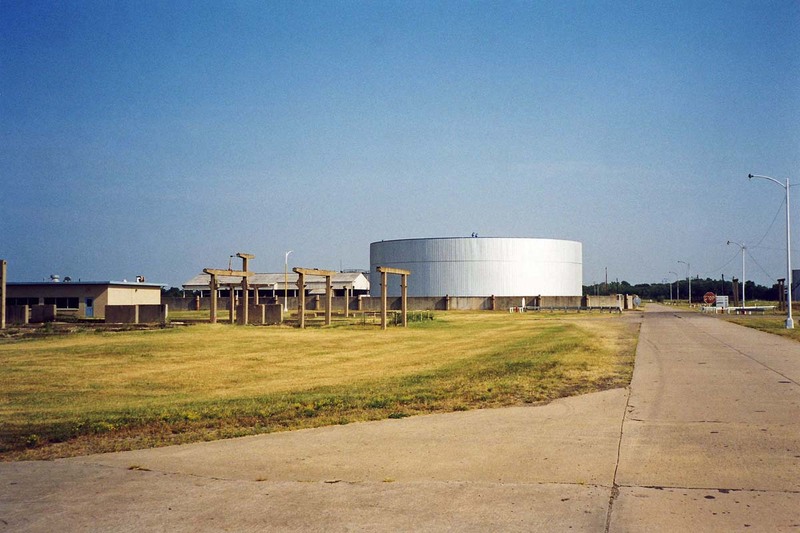 It now serves as the Independence Municipal Airport (IDP) and an industrial park. 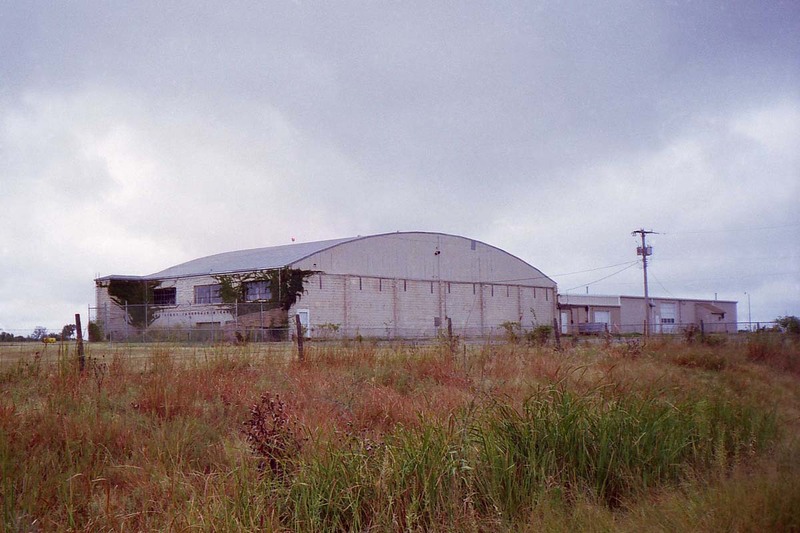 A few hangars remain, along with some foundation remains. I don't know if this bermed firing range is original or has been built since AAF use. No business trip this weekend, but out of habit I drove part way to Tulsa anyway! Actually, this was a planned visit with Shannon Thomas, Research Director of the Perrin Air Force Base Research Foundation. 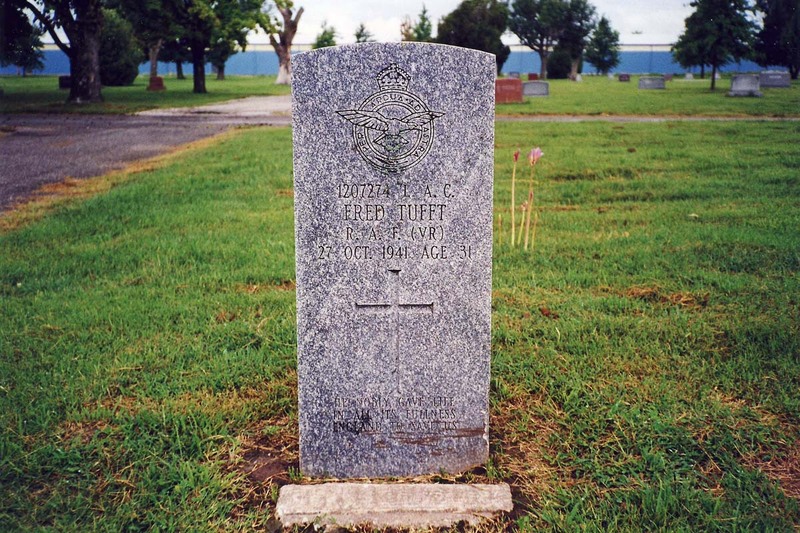 He operates the foundation from a building on the former Perrin AFB (1264, TBLZ). After discussing research sources, we toured the former munitions area. 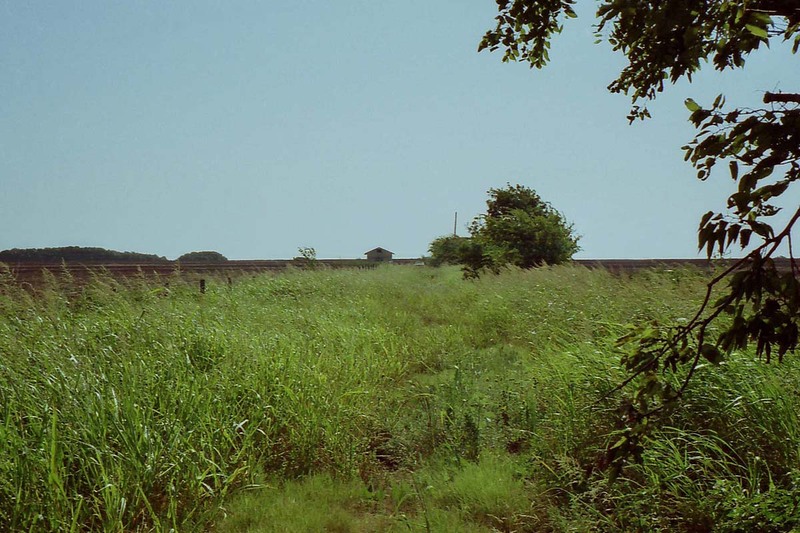 The bunkers are now used for storage and the berm of one serves as a firing range backstop. 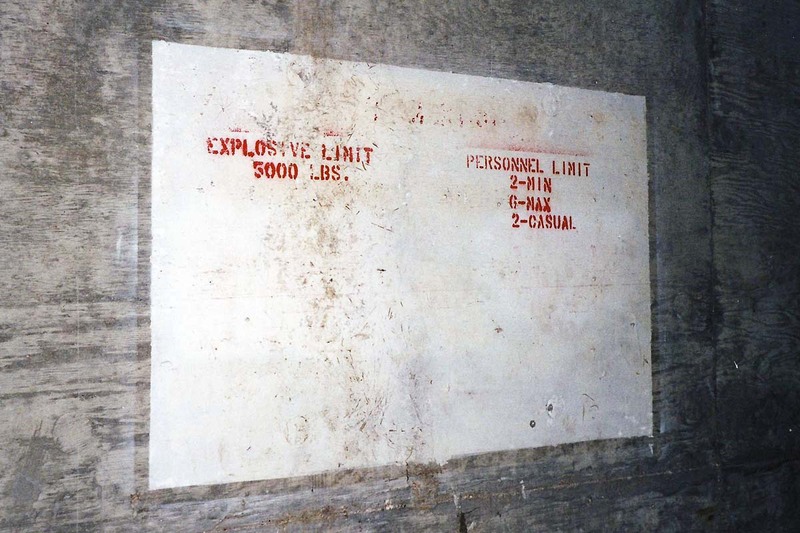 On the access road before you get to the igloos, there is a row of smaller storage units, each compartment marked for 1,000 pounds explosives weight. A Fire Symbol 3 is still displayed on one end of the structure. 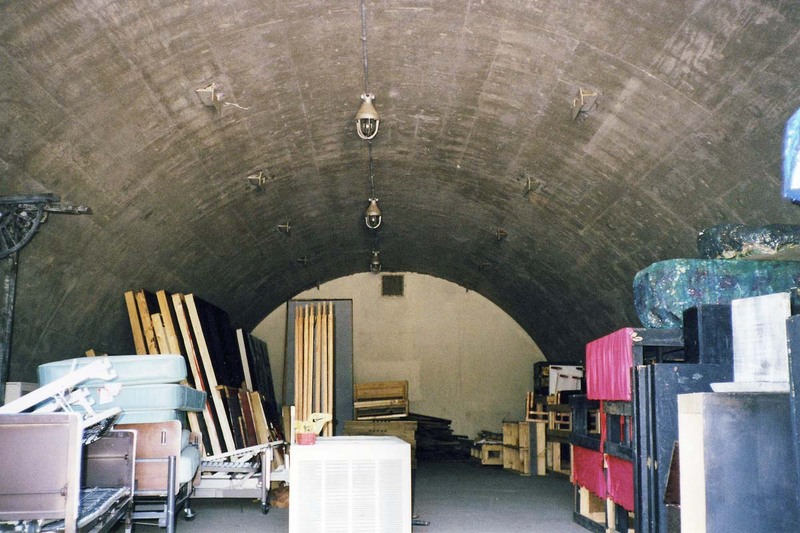 The two large earth-covered igloo bunkers are still in good condition, and are marked with an explosives weight of 5,000 pounds each. Behind the two igloos is another structure with a row of storage bays, each marked for 1,000 pounds maximum explosives weight. 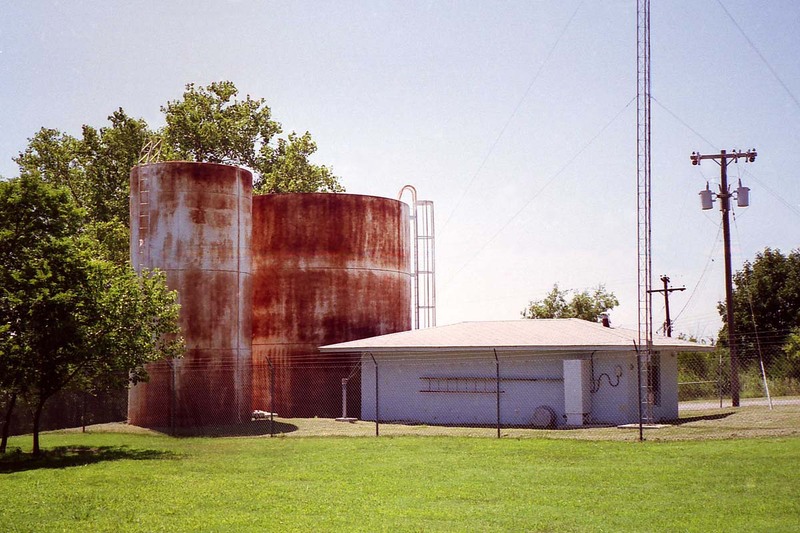 We also paid a visit to the former Perrin Radio Range Annex (1267) in Sherman, TX, 33-39-58, 96-37-57. 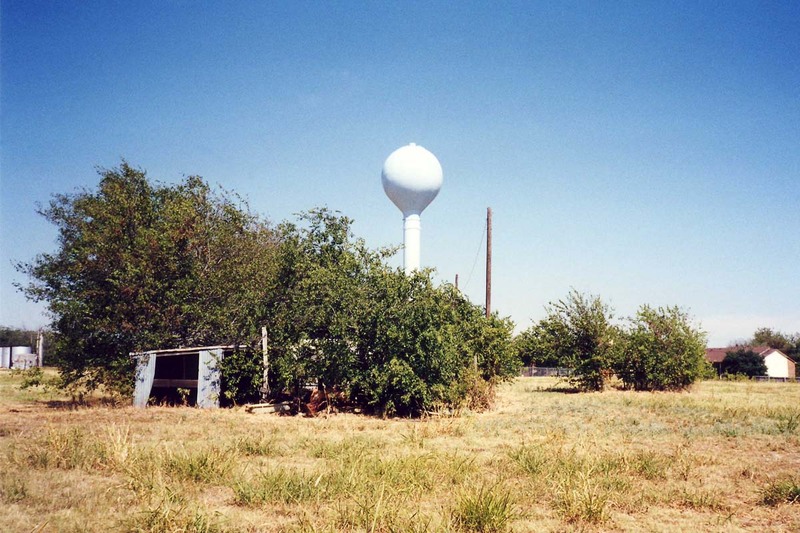 It sits abandoned except for the northeast corner of the property, which houses a city water tower. 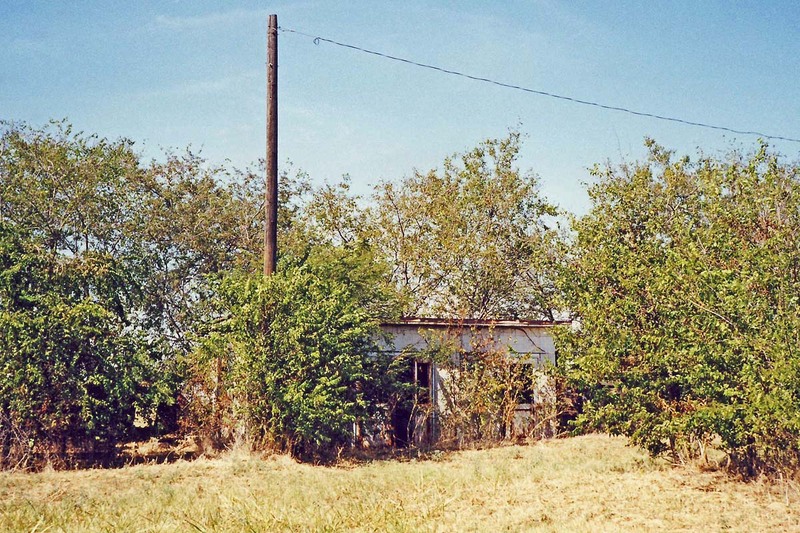 The radio building is fairly intact, although almost hidden by trees and brush. 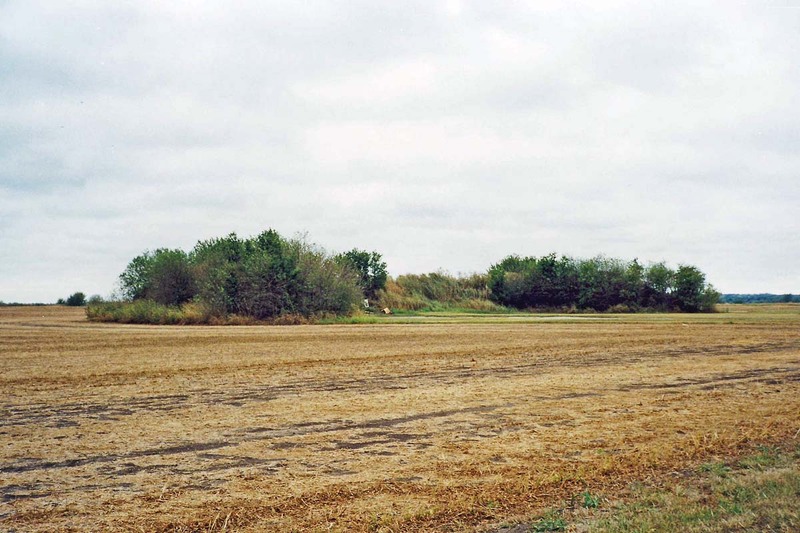 This NAVAID site was in use by 1952, and was disposed of in 1962. 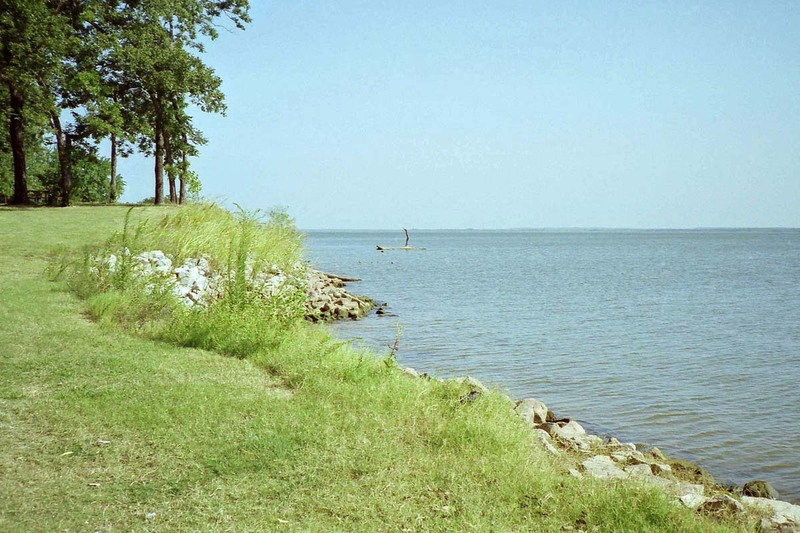 I made an attempted visit to the Lake Texoma Recreation Annex (1271), 33-49-18, 96-47-38, on the Texas side of the lake. It was fenced and gated. 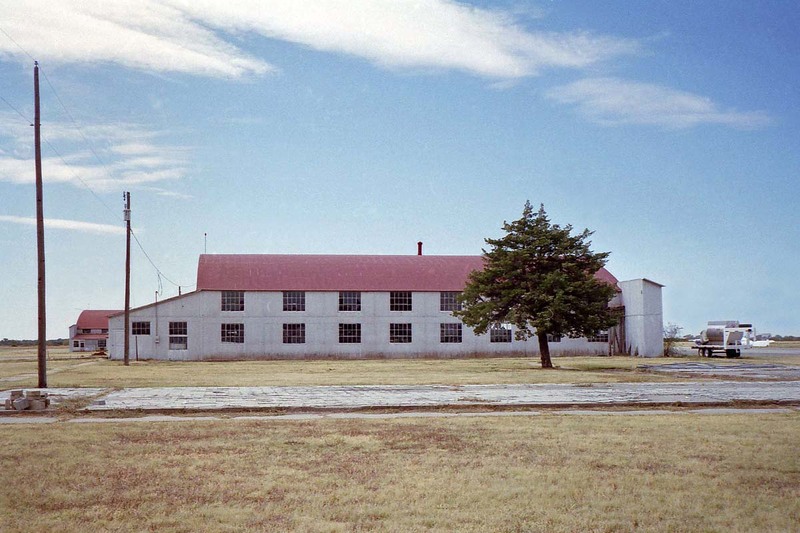 This annex served Perrin AFB from about 1949 until 1971. Just to prove it could be done, I drove straight from Arlington to Tulsa without making any historical stops. How boring!!! I started the day bright and early with a follow-up visit to the Tulsa Air National Guard. I met with Major Blickensderfer, Civil Engineer; and TSgt Roberson, Historian. Both were very helpful, and I gained additional information on Air Force activities at the Tulsa airport. Then at the Spartan School of Aeronautics, I met with Damon Bowling who provided information on the company's role in W.W.II pilot training. 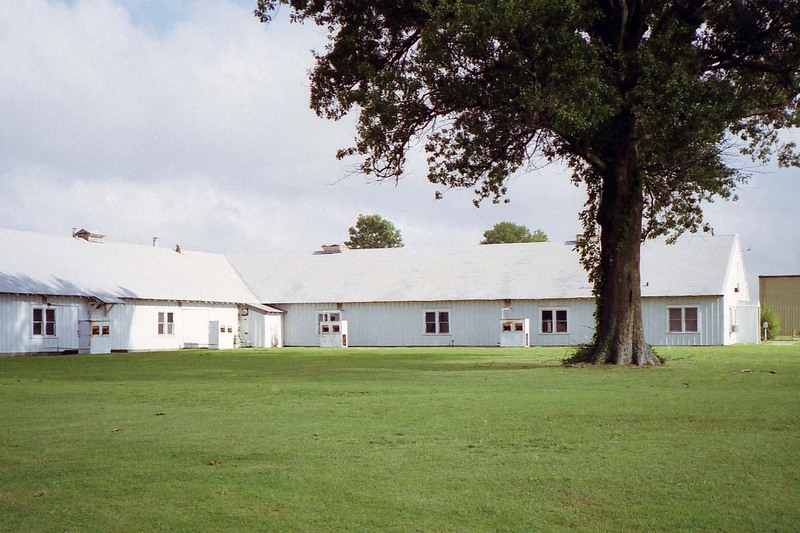 Unfortunately, we could not locate any information on the auxiliary fields used by their Tulsa school. 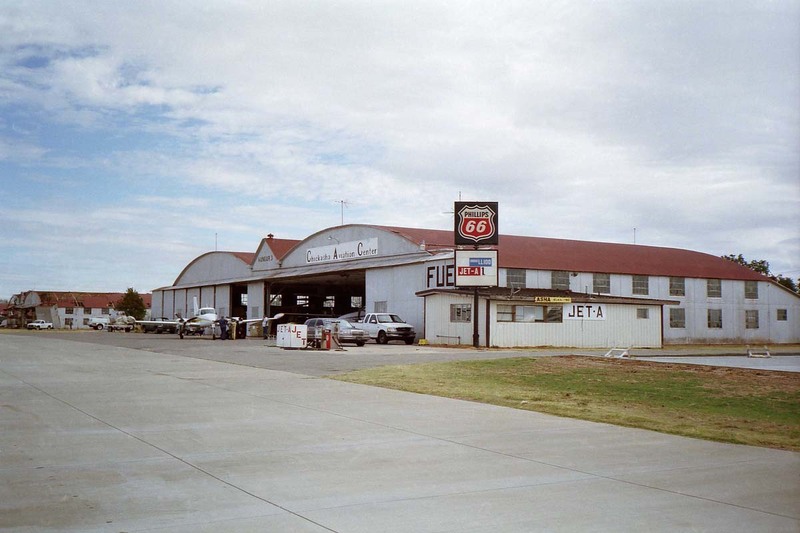 Heading west, I drove through Oklahoma City and found the Clarence E. Page Municipal Airport (F29), at 35-29, 97-49. 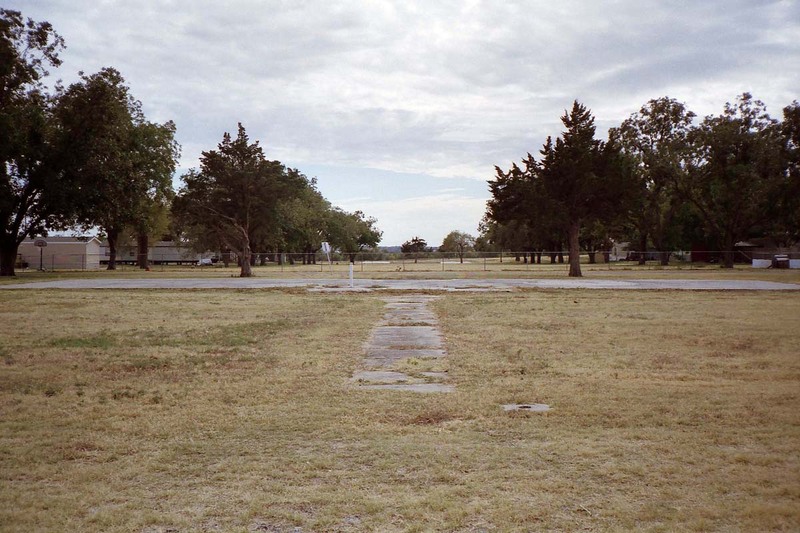 This was known as Cimarron Field during W.W.II, when Oklahoma Air College, Inc. operated it as a contract flying school for the Army Air Forces. 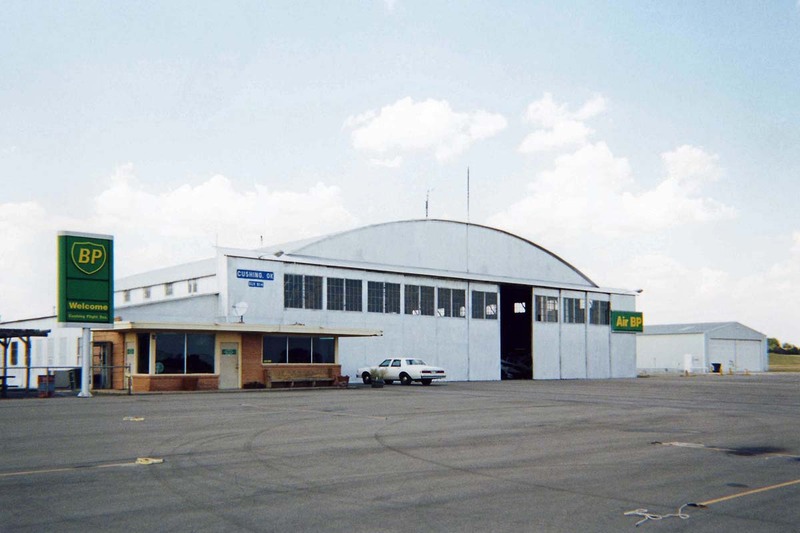 A couple of hangars looked vintage, but most of the airport facilities looked much newer. 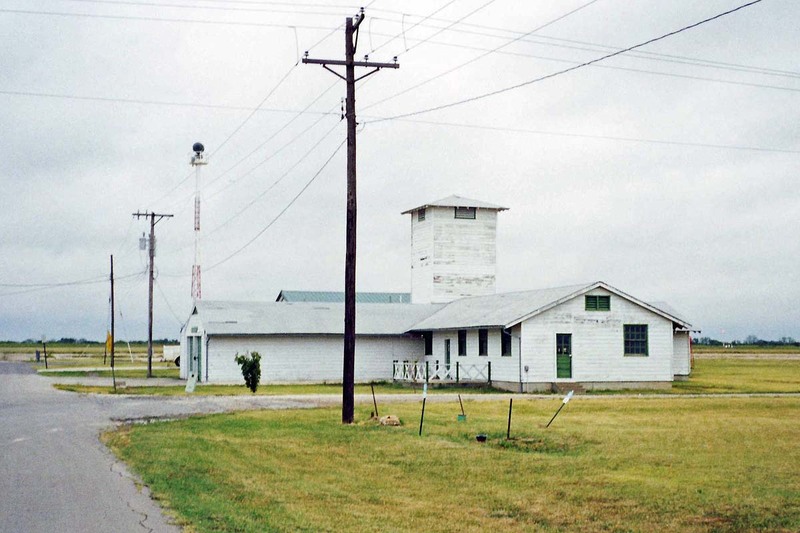 Continuing west past El Reno, the El Reno Municipal Air Park (F28), 35-28-30, 98-00, was formerly called Mustang Field. 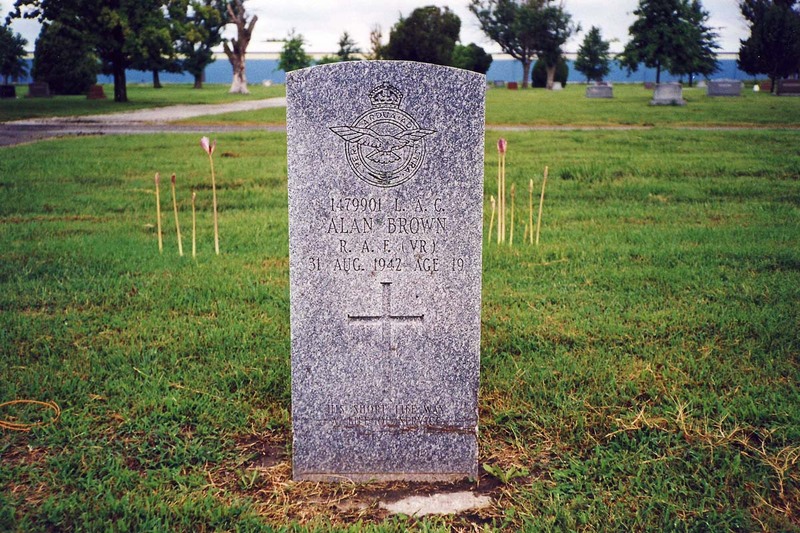 This was an Army Air Forces contract flying school. 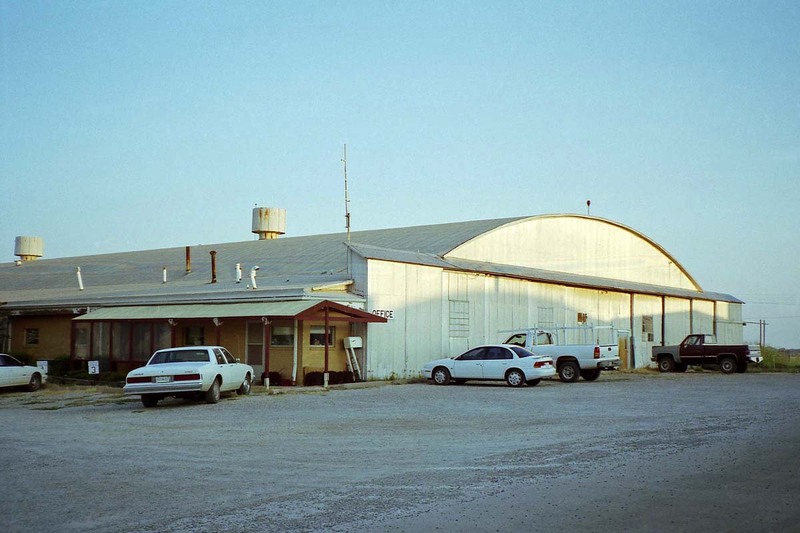 Some W.W.II sources list the operator as Oklahoma Air College, Inc.; and some list it as Midwest Air School. 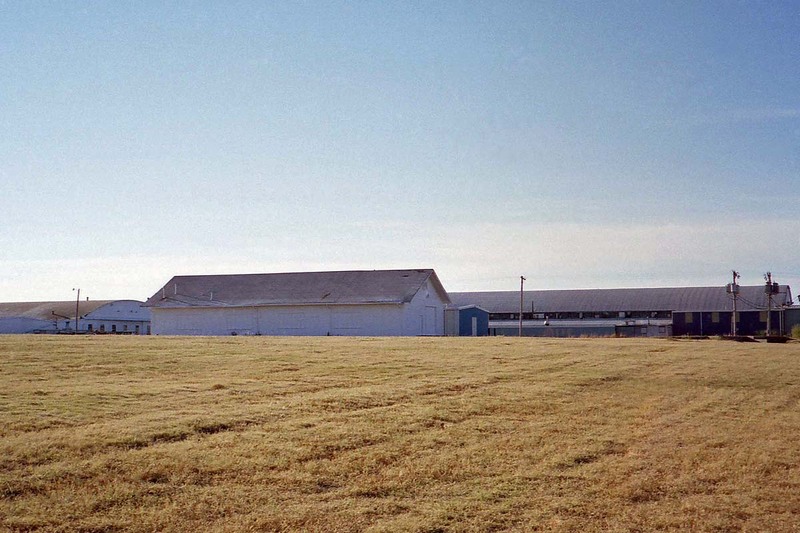 Four original hangars still stand in a row, and several building foundations remain between the hangars and the flagpole. (TerraServer imagery from 1995 shows the building still standing at that time.) The flagpole and surrounds has been reworked, but judging from the vintage sidewalk leading to it I suspect it is the original location. 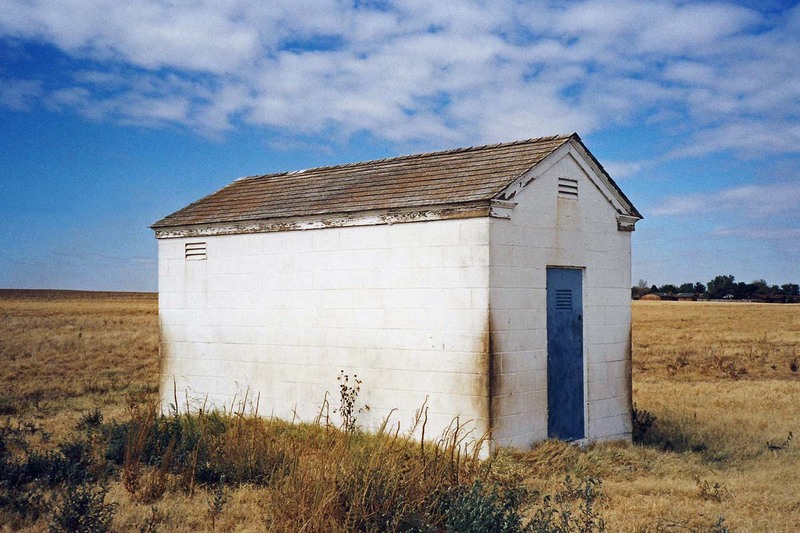 By coincidence, the short drive south from the interstate highway to Mustang Field took me right next to this AT&T repeater hut, at 35-29-58, 97-58-22. 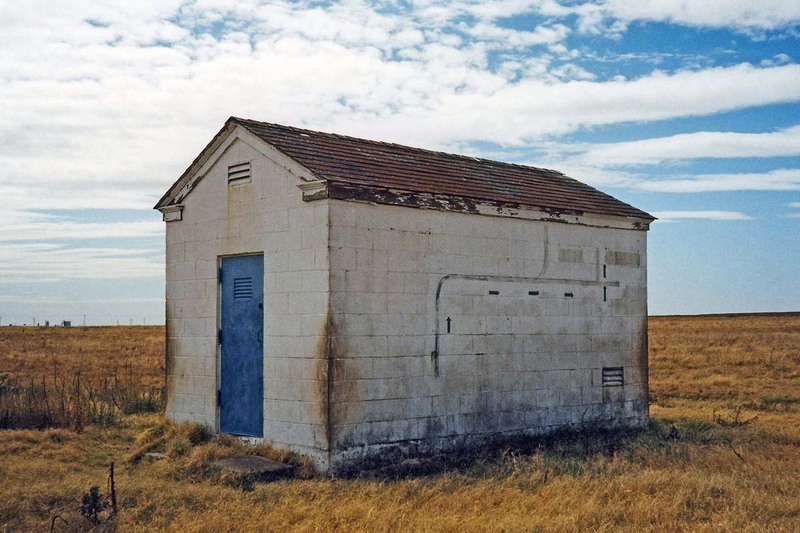 It looks like an L-series hut, part of the transcontinental coaxial cable system. No poles or cable path markers were evident nearby. 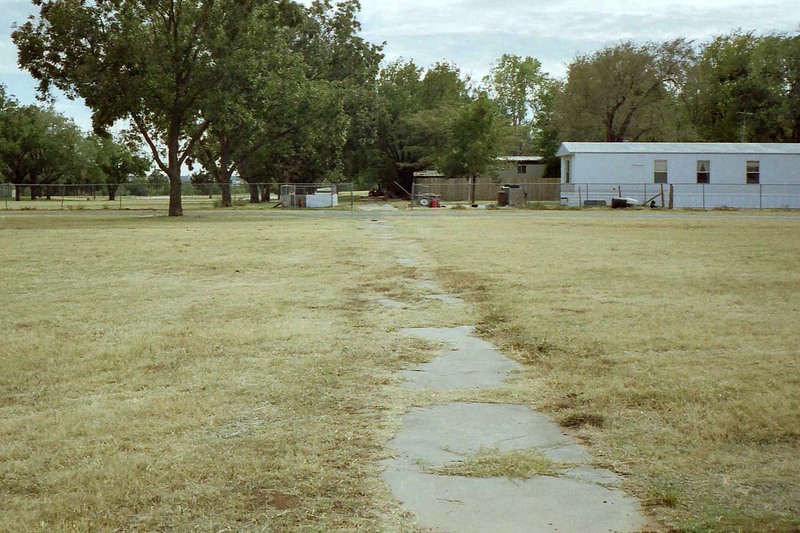 Heading south, I looked for the former Chickasha Auxiliary Field #3. 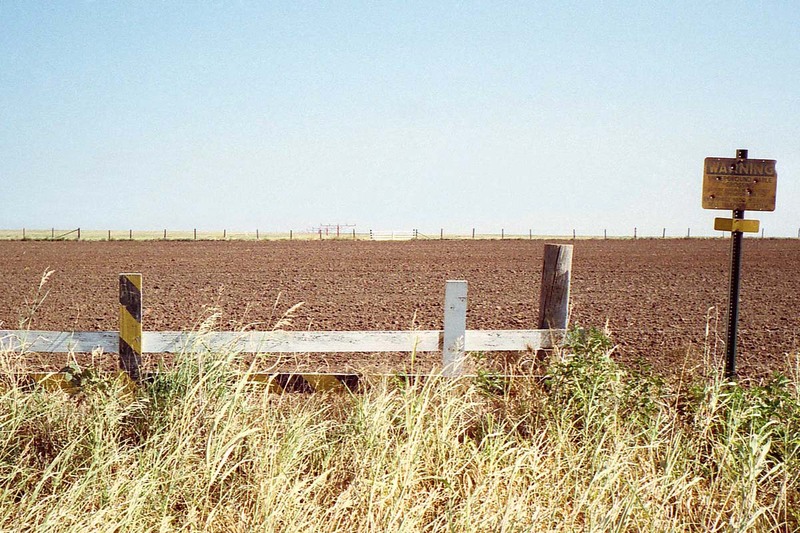 What I found, at 35-12-40, 97-59-00, was farmland (no surprise). 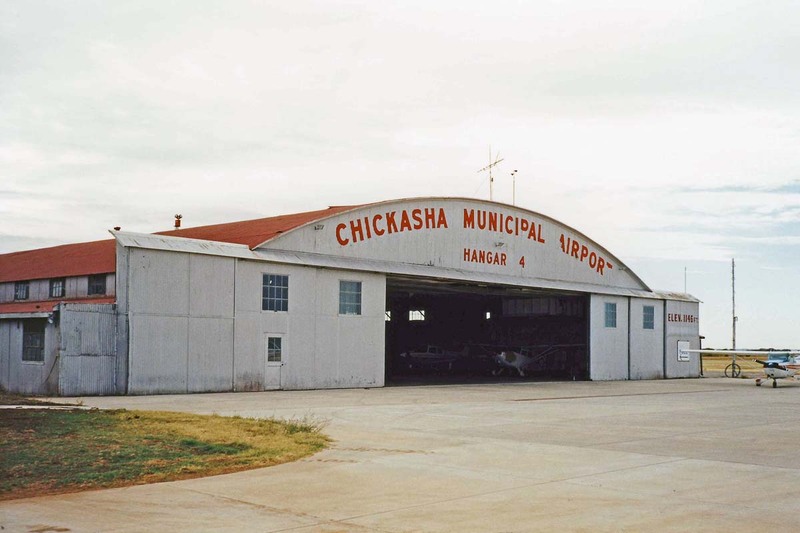 Chickasha Municipal Airport (CHK) still operates under that name. 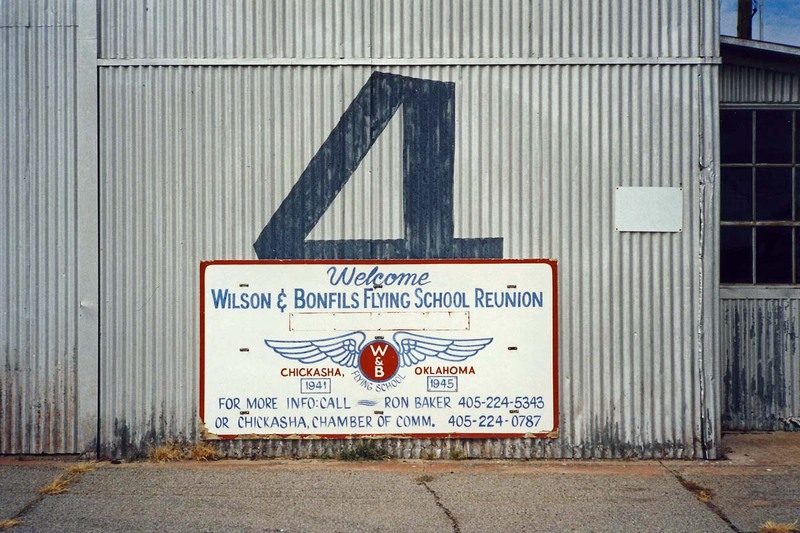 It was another W.W.II contract flying school, operated by Wilson-Bonfils Flying Schools. 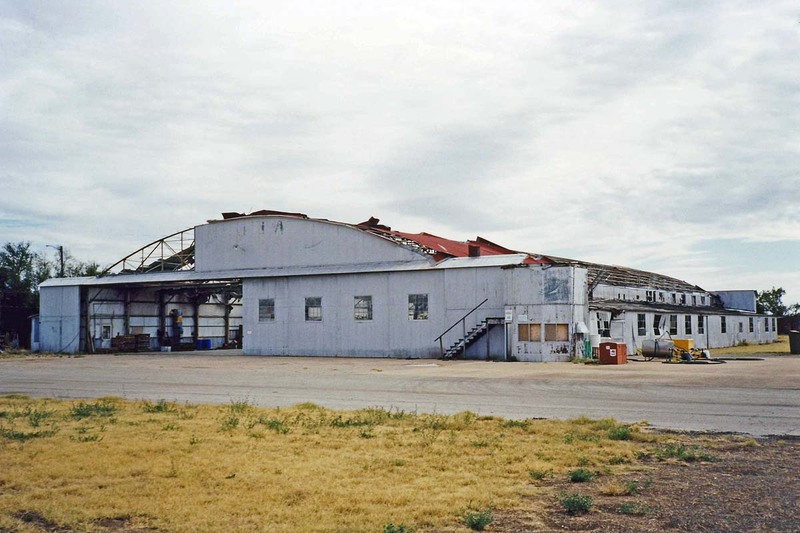 Located at 35-05-30, 97-58-30, it has four vintage hangars standing -- although two suffered significant damage in a severe tornado in 1999. 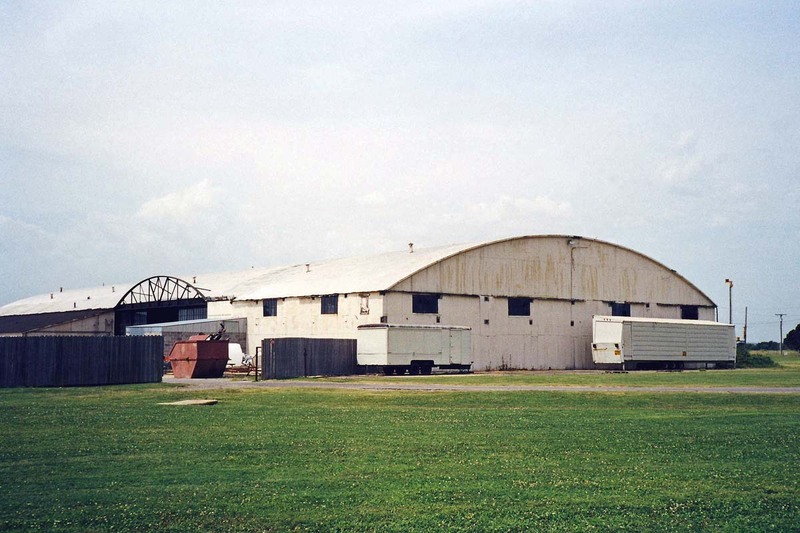 I was saddened to see the damage done to the 184' demountable hangar. I did not observe any other vintage buildings standing, but there are plenty of sidewalks and foundations. 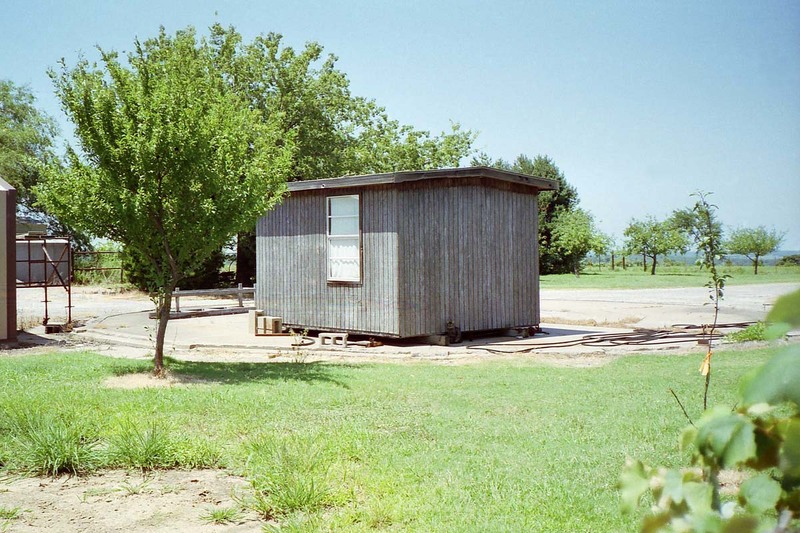 Many of the old building foundations are now used as pads for mobile homes. After this, it was time to head home and wrap up this trip -- and also bring to close this series of Oklahoma visits.